This month’s weather has been very weird for the time of year. 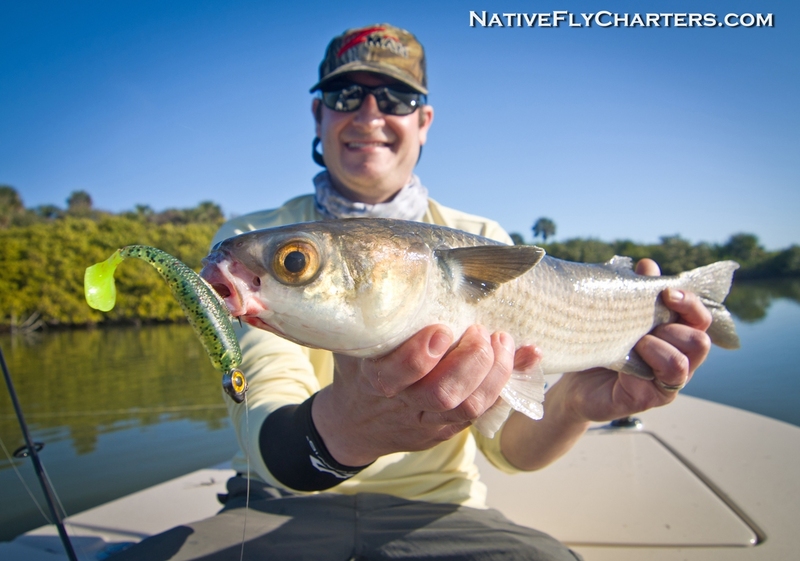 Hot Summer-like conditions in December doesn’t help with the water clarity in the Mosquito Lagoon, North Indian River, or Banana River Lagoons and it also has the fish all confused with their seasonal patterns…I mean, I was still seeing tarpon on the flats which is rare in December! 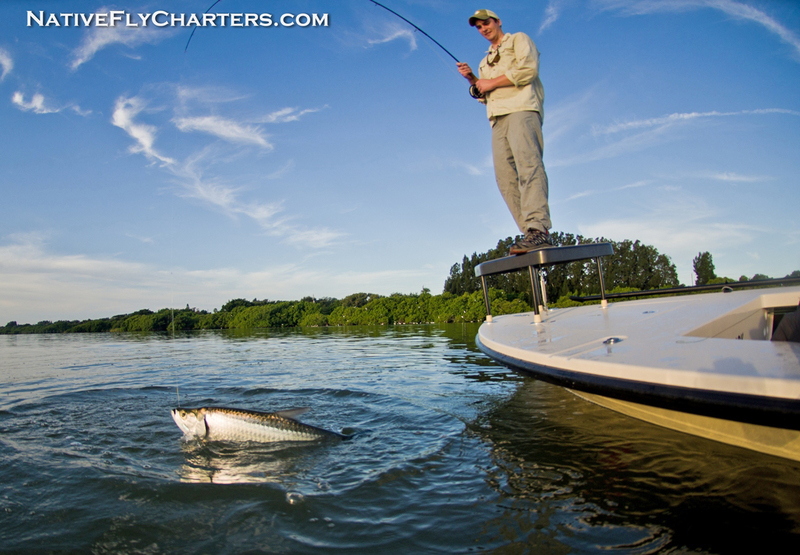 The fishing has been hit or miss, fish have been moving around a lot on a daily basis and not really staying put in a general area. 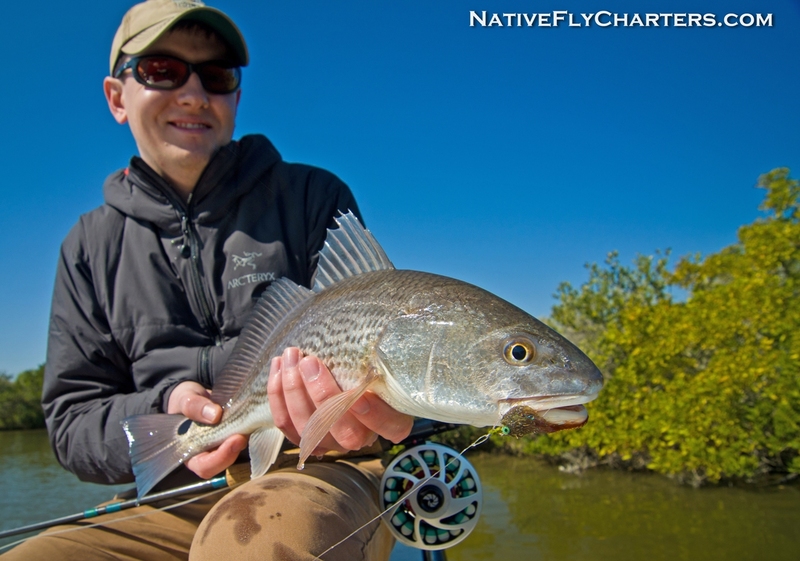 Redfish, Sea Trout, and Black Drum made their presence this month and were excellent targets on the fly, when the wind cooperated that is. 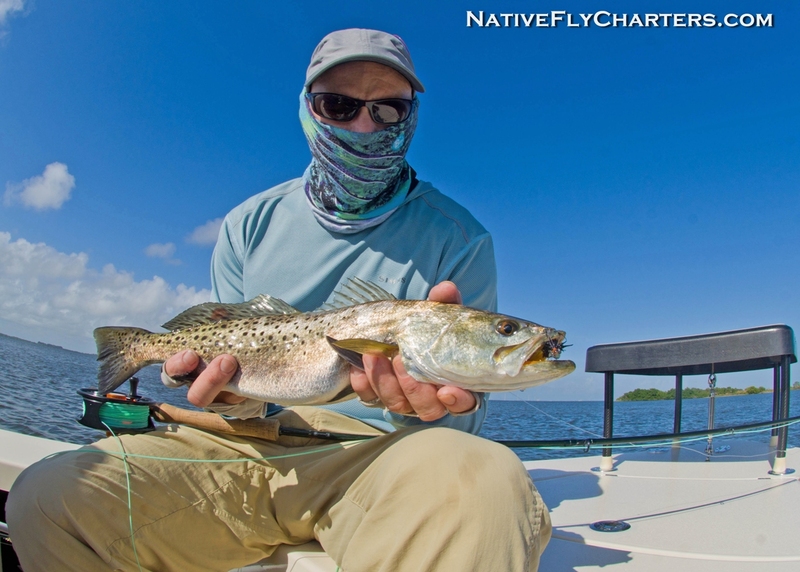 Thankfully, as I write this blog, we are finally getting some cooler temperatures which should help clean up the water and put the fish in a better mood which makes me in a better mood. 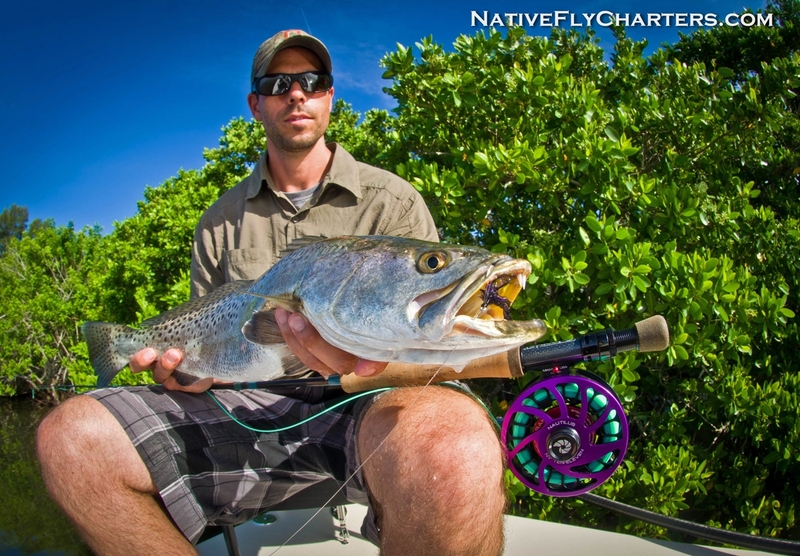 Adam from Rockledge, FL. got out on one of the better day. 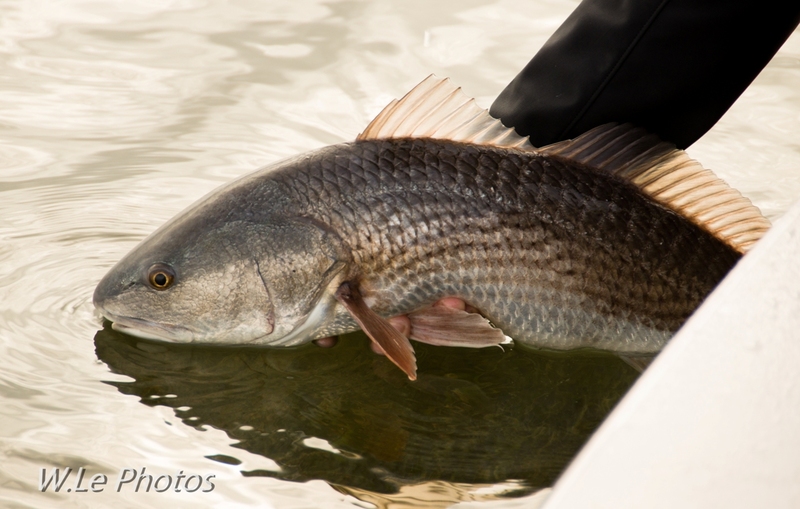 Slicked out conditions made it easy to spot big redfish finning on the surface from a good distance. 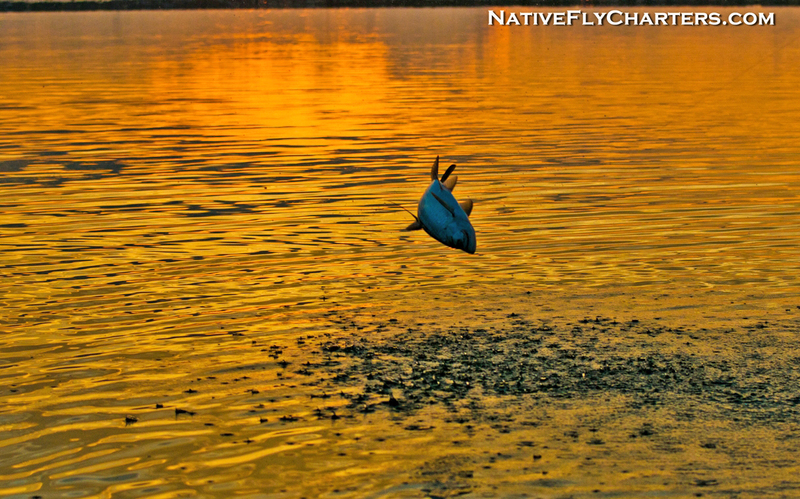 These fish weren’t that easy to feed a fly to this day, but this fish seemed to like how Adam presented the fly. 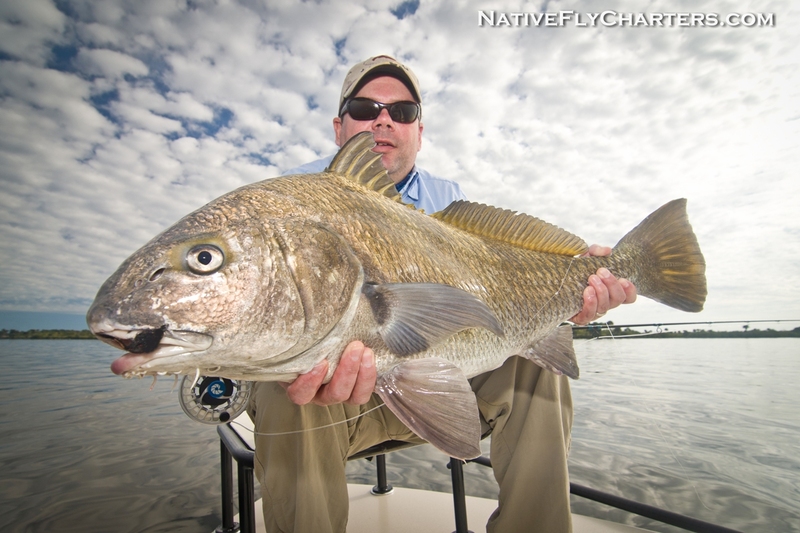 This is Adam’s biggest redfish to date. 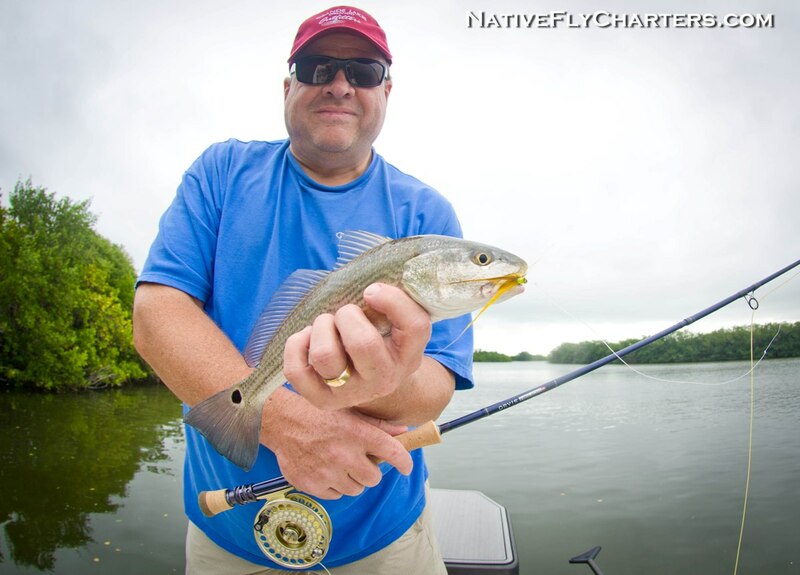 Ed from Atlanta, Ga. fed a few fish using topwater lures all day. A windy day for Tom from New York. 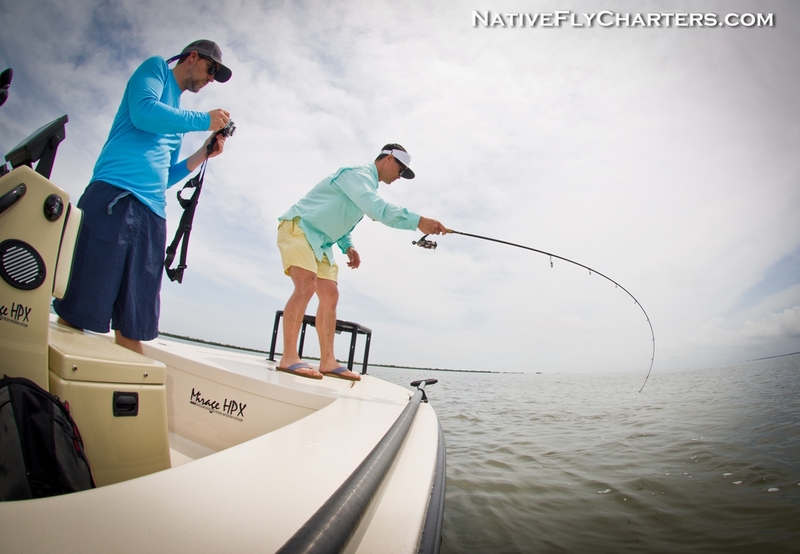 We had to tuck way back in the islands where he caught a mess of Sea Trout, a little redfish, and a couple black drum all on fly. 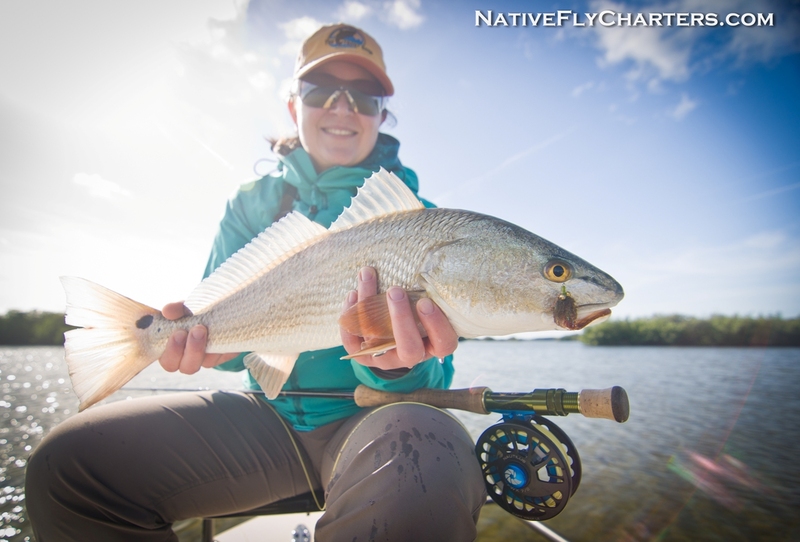 First time saltwater fly fishing for Amanda from Colorado. 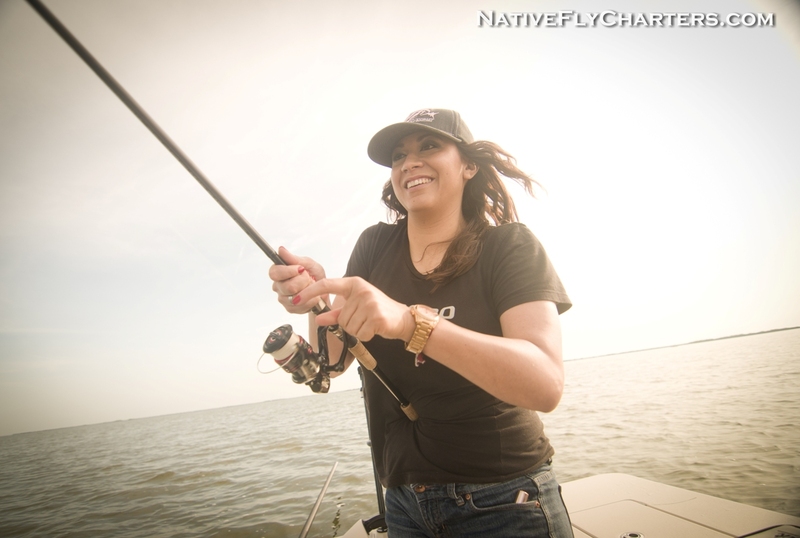 She had some fun with Sea Trout and sight fished a nice Black Drum that broke her off on a mangrove halfway in the battle, which was a heartbreak….but Amanda never stopped smiling. I always enjoy having Brad from Colorado on the bow. 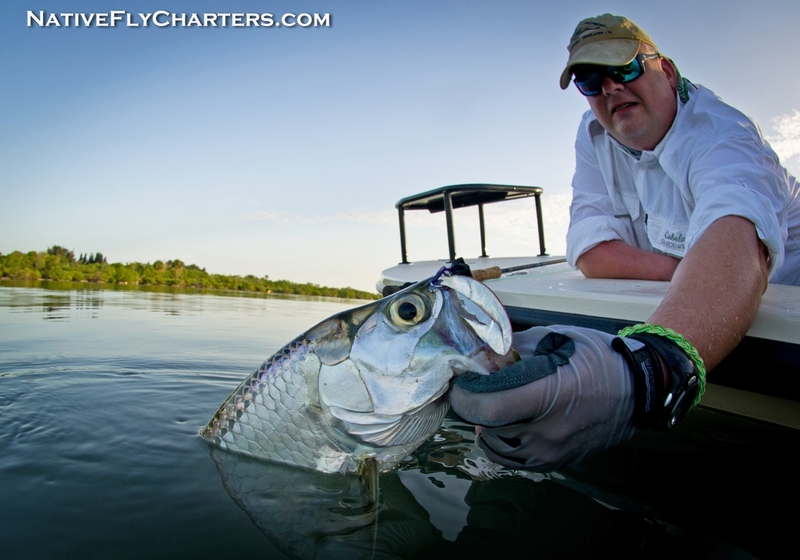 I’ve watched and coached as he progressed as a fly angler. 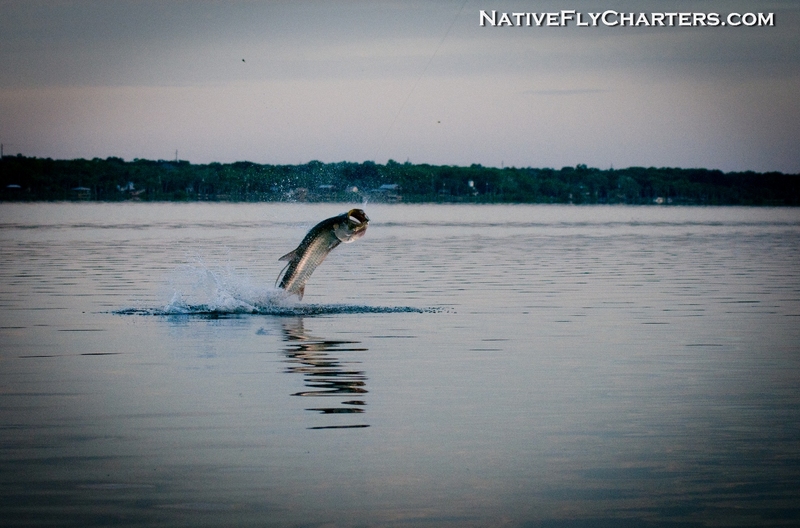 This day was a good one….lots of shots, lots of refusals, and lots of laughs. 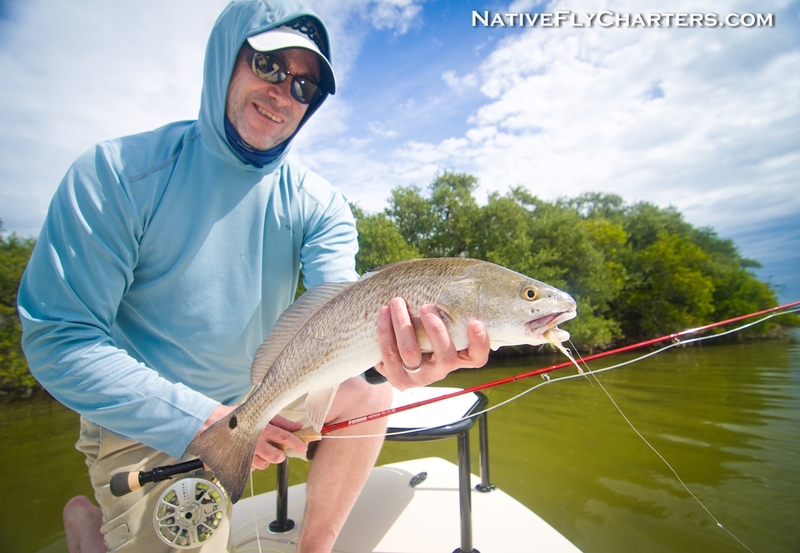 Paul from Portland Oregon caught his first Sea Trout and his first Redfish this day. He did a great job casting in the gusty winds. My buddy Alex doesn’t get too much bow time…this day he did. 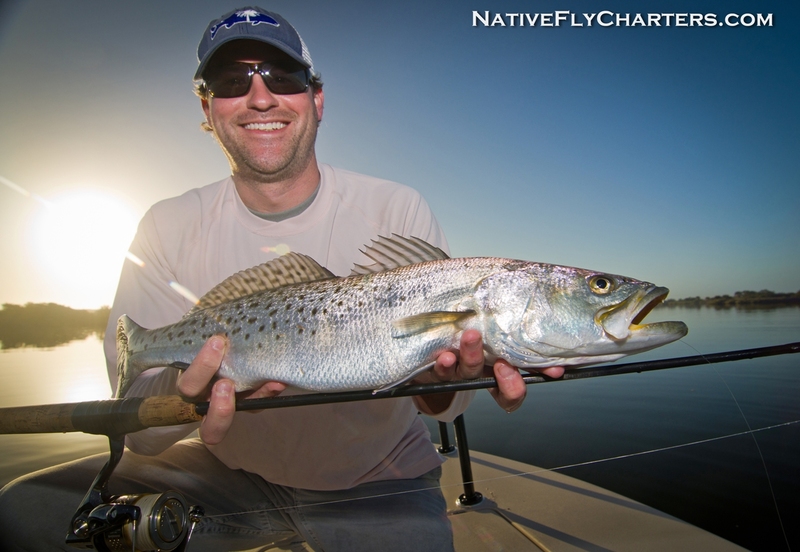 Thanks to everyone who I have fished with for making 2015 a great year for Native Fly Charters! Also, thanks to all the companies that have supported me this year and I look forward to working together for years to come. I have some good stuff coming for 2016 including new camera gear that will produce some fancy images I think you all will enjoy so stay tuned for that in the next blog entry. Also, I will be updating my website for a new look this year so keep an eye out for that…some changes have already been made in the main site. 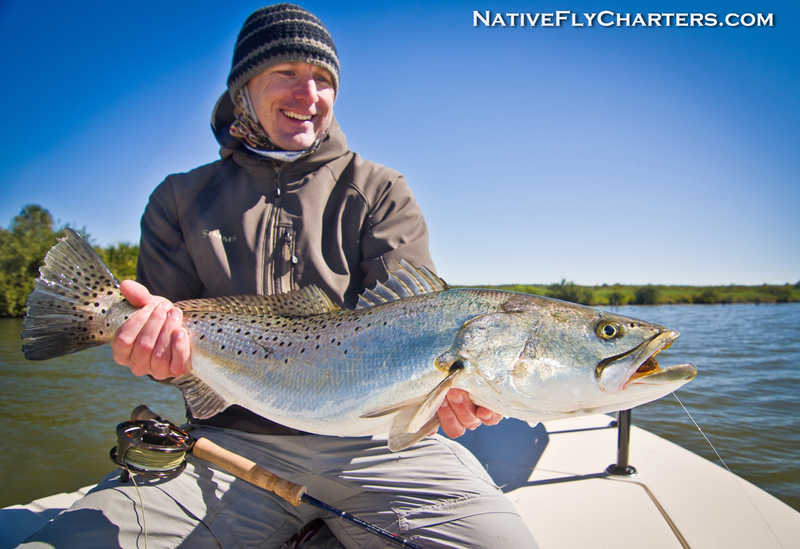 Welcome to the Native Fly Charters fishing report for Oct./Nov. 2015. 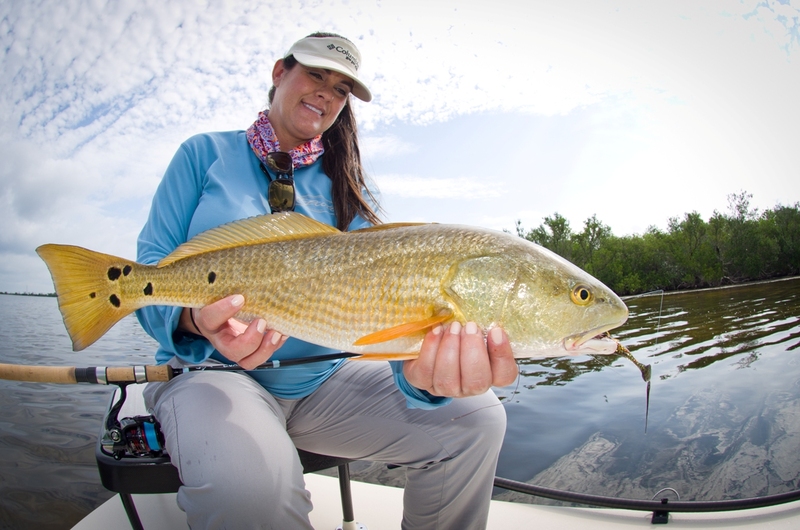 Water conditions remain murky except for a handful of areas which are clean enough for great sight fishing opportunities. 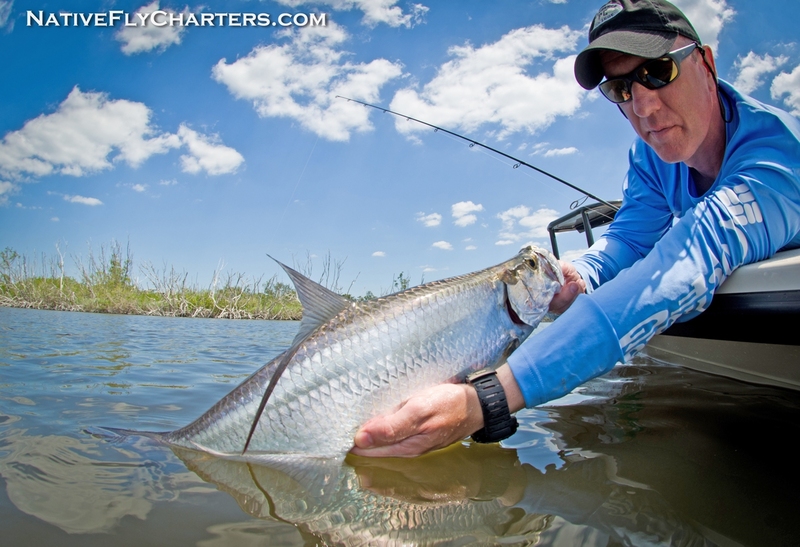 With the warm temperatures still lingering around, the tarpon and occasional snook have been cruising around the flats along with redfish, sea trout, and black drum. 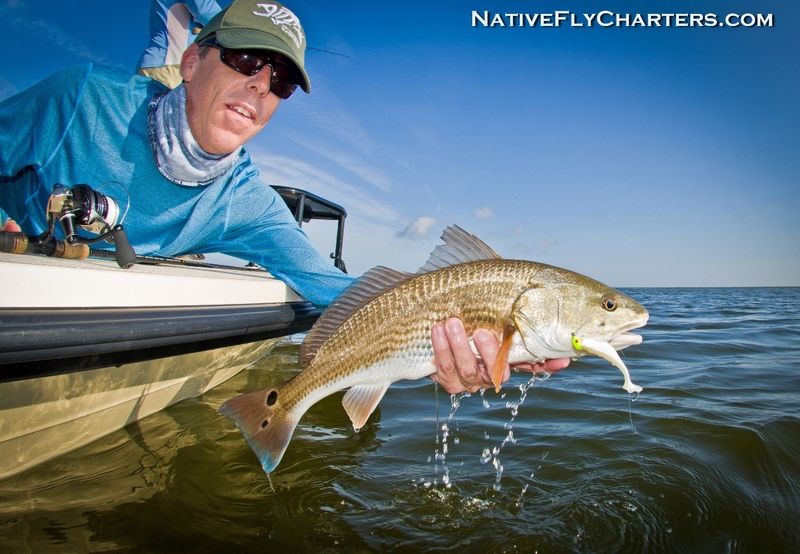 Millions of bait on the flats has been making it tough for fish to aggressively take flies/lures, but if you put it close enough to the fish and move it how they like it, you might get lucky. 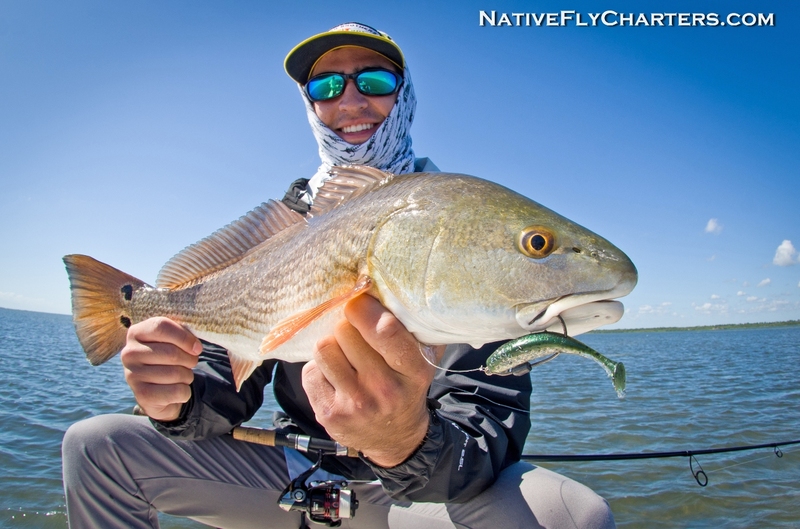 The water is expected to clean up when temperatures drop making sight fishing excellent, redfish should start to school up along with black drum, and the sea trout will lay up in the shallows making prime targets for fly anglers. 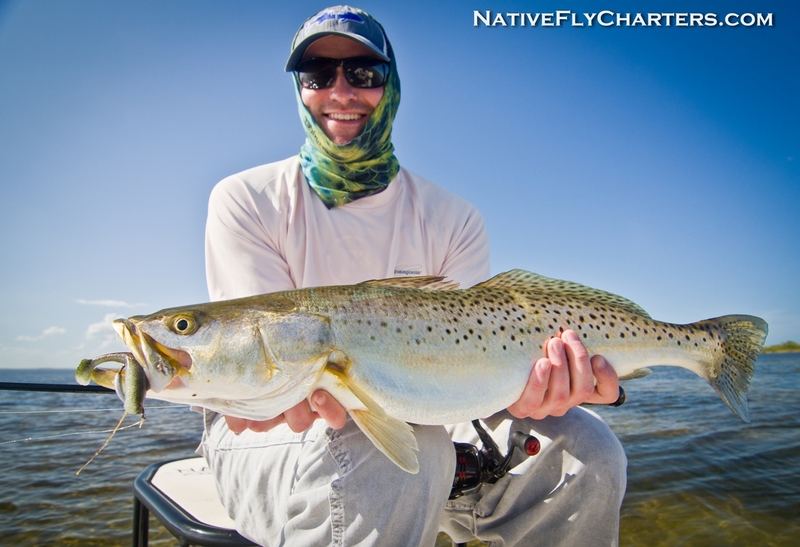 Zach drives down from Georgia a few times a year to fly fish for whatever is good at the time. 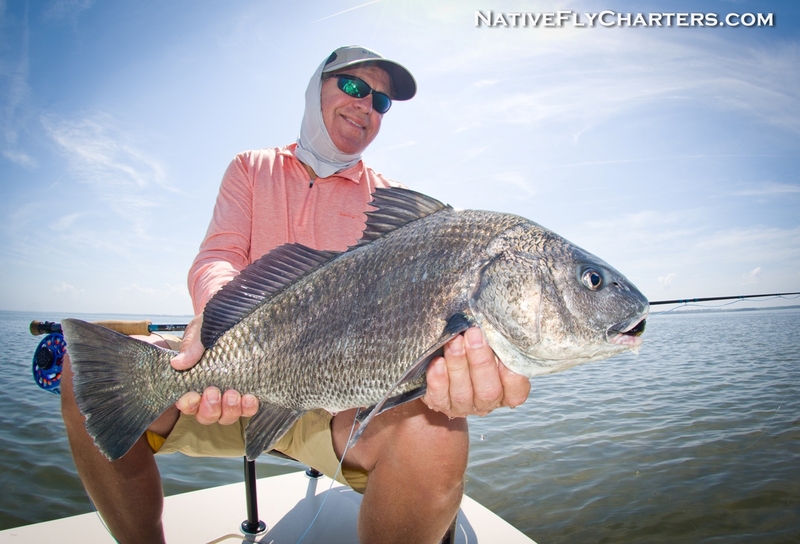 This time it was Black Drum. 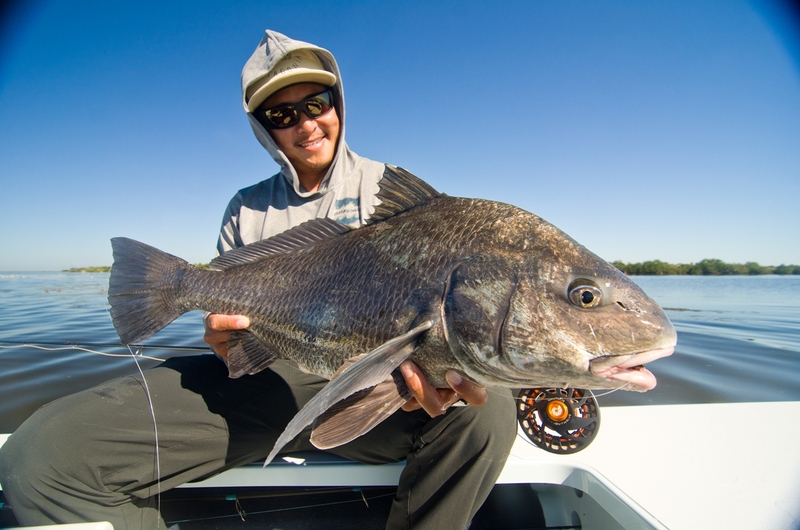 After what felt like hours of making some good presentations to schools of drum, he finally got one hooked up which make it his first black drum on fly. 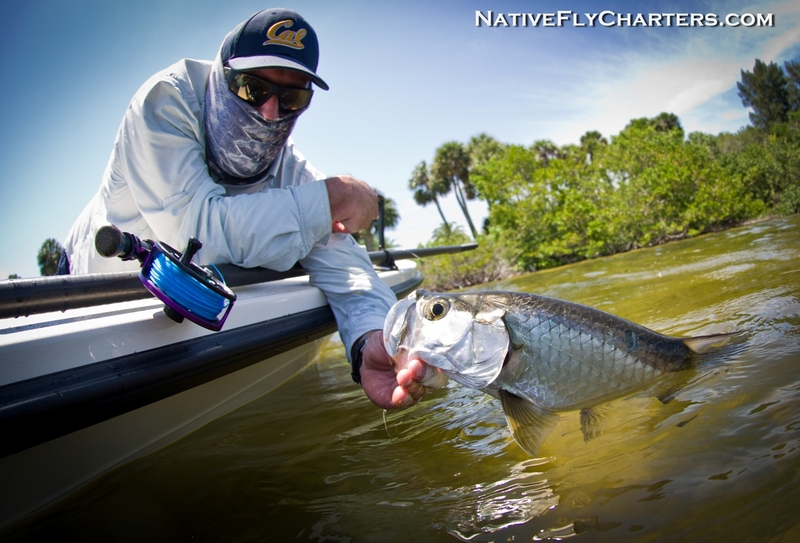 Brad from Colorodo got into some hard fight Jack Crevalle action while in search of snook in the mangroves. 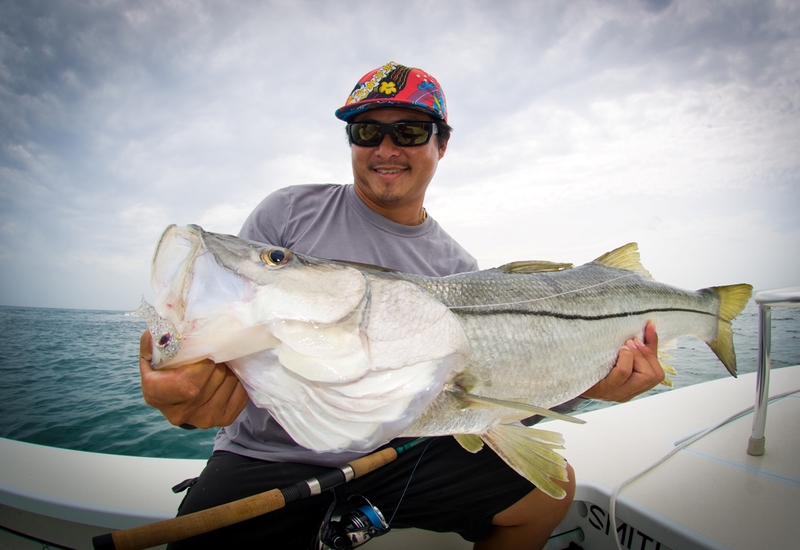 Christoph from Germany had a great experience for his first time fishing in saltwater. 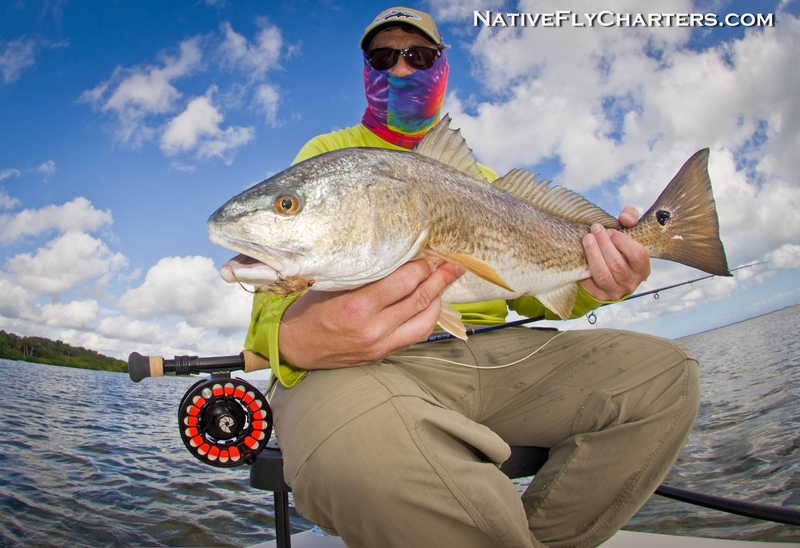 Although he caught multiple species, the redfish gave him the most trouble. 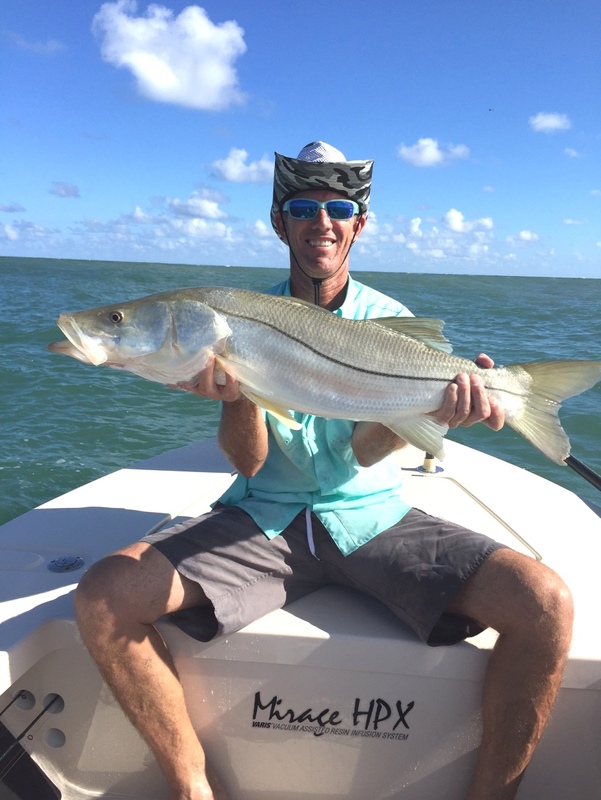 Ina from England, also his first time fishing in saltwater. 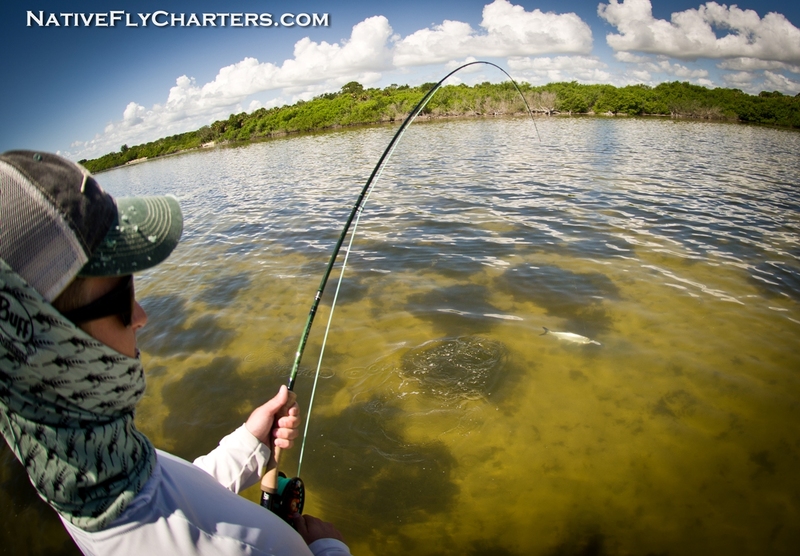 Conditions were a bit windier so we hid in the backcountry where he went 2 for 8 on small tarpon. 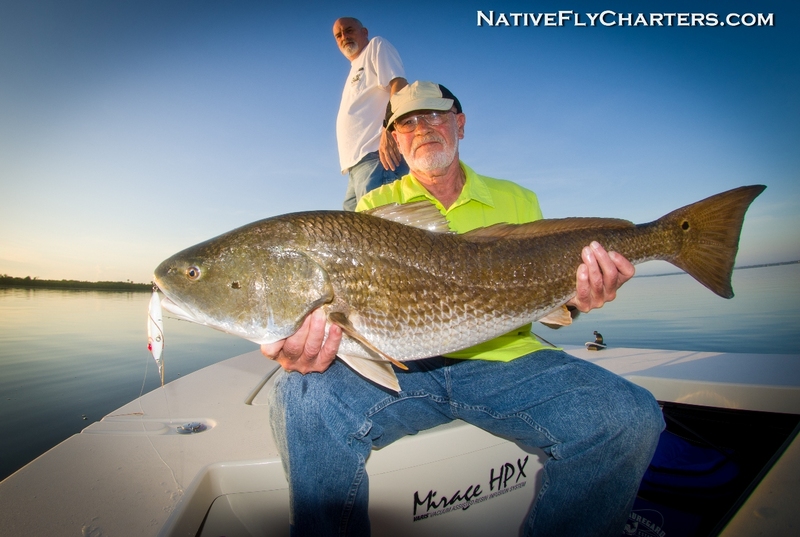 Paul and his son Arleigh from Montana got some redfish on a tough windy day. Milton from Georgia joined me for 2 days of fly fishing. 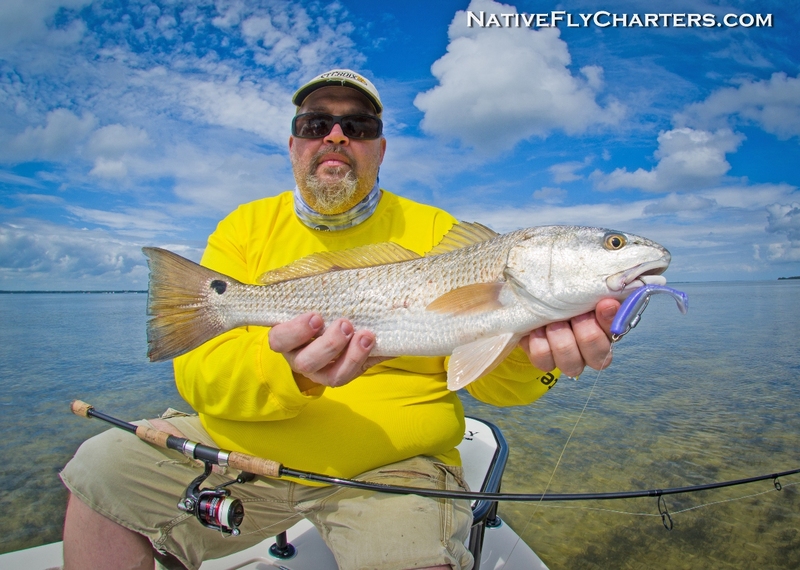 Day – 1 had clean water and plenty of shots at spooky fish with a few eats. 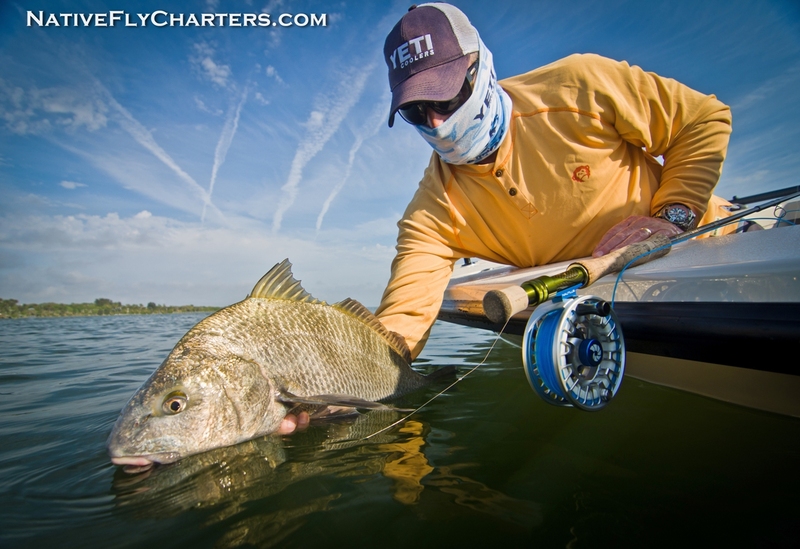 Day 2 – fewer shots, windier conditions and only a couple eats. 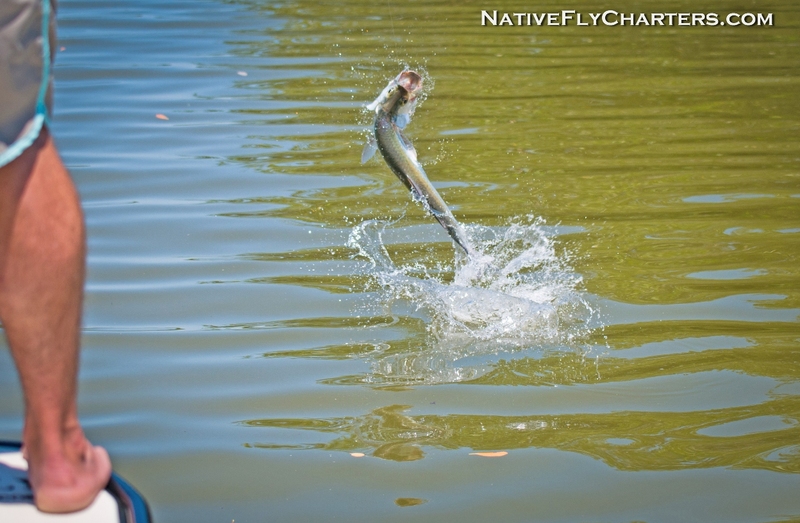 One of those days where the baitfish were so thick, all of the predators were full from feeding and did not want to take a fly unless you make them “reaction strike” it. 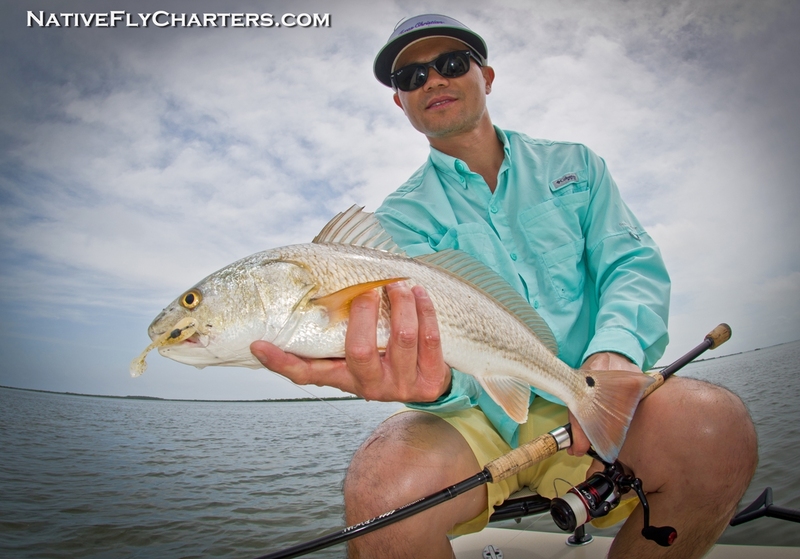 Cory from Orlando wearing out snook and redfish off the beach. 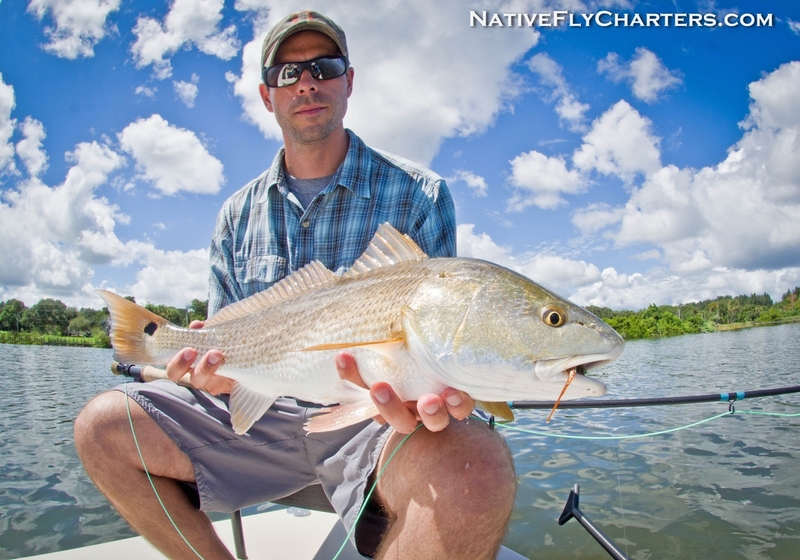 Welcome to this months fishing report for the Mosquito Lagoon, Indian River Lagoon, and Banana River Lagoon. 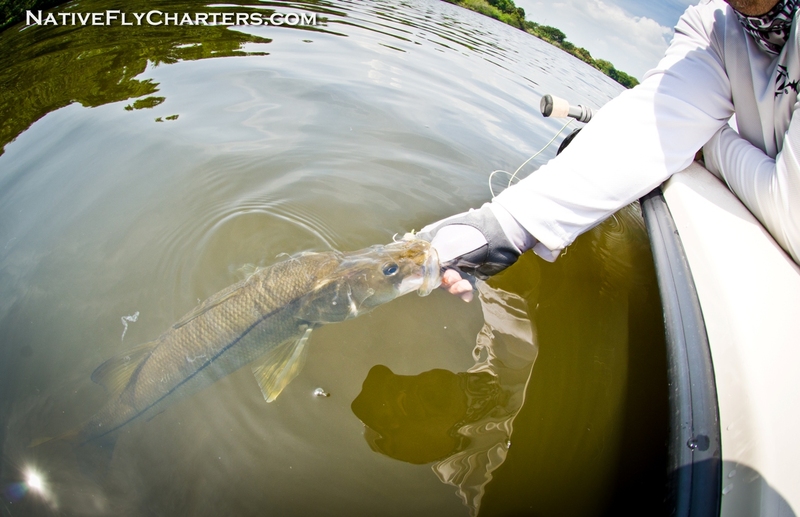 Water conditions in all 3 Lagoons are high and dirty due to all the recent downpours. 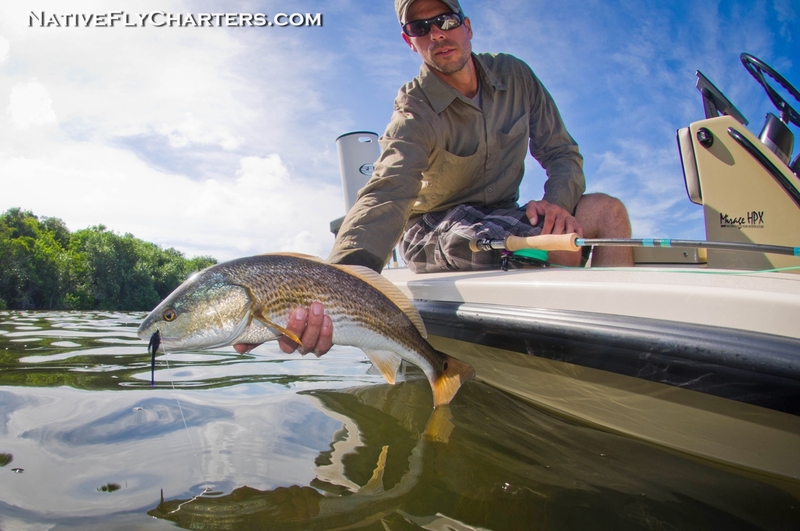 The fish have been pushed way in the back country which is where I prefer to fish anyways to get away. 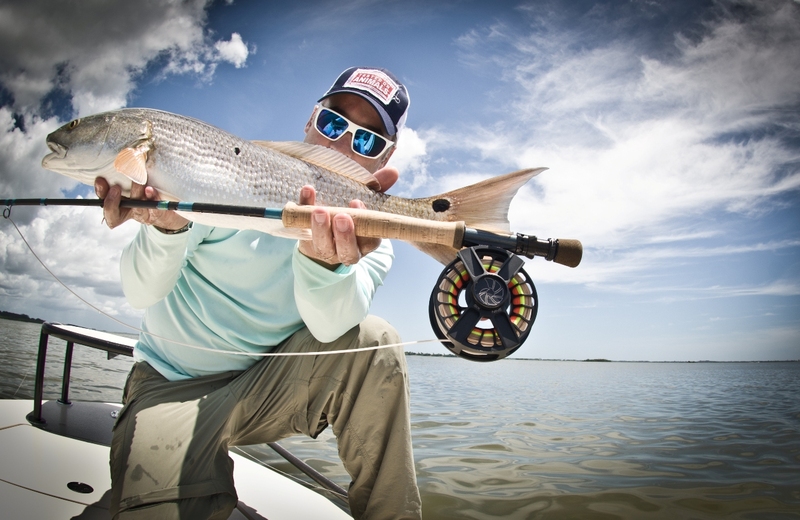 Clean water has been hard to come by but with a trained eye and a good pair of Amber polarized sunglasses, you should be able to get some sight fishing in. 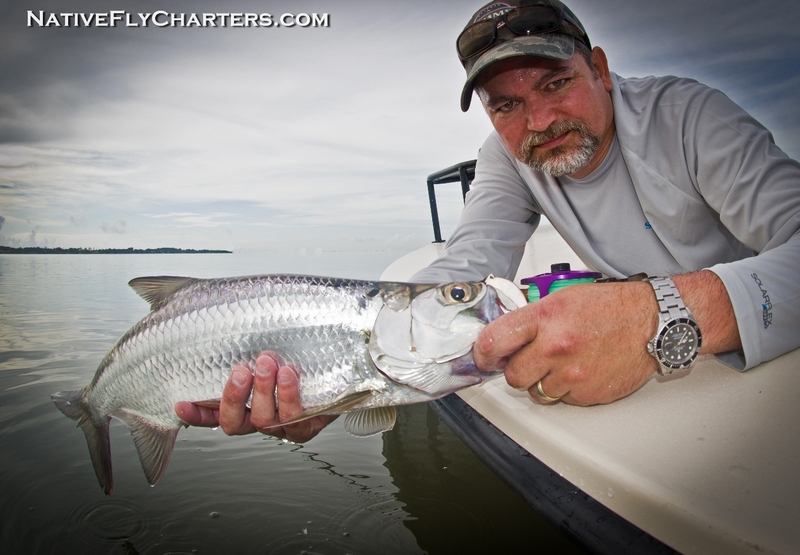 The mullet have started their Fall migration up and down the beach and in the Lagoons around the Space Coast which has made fishing really good this month. 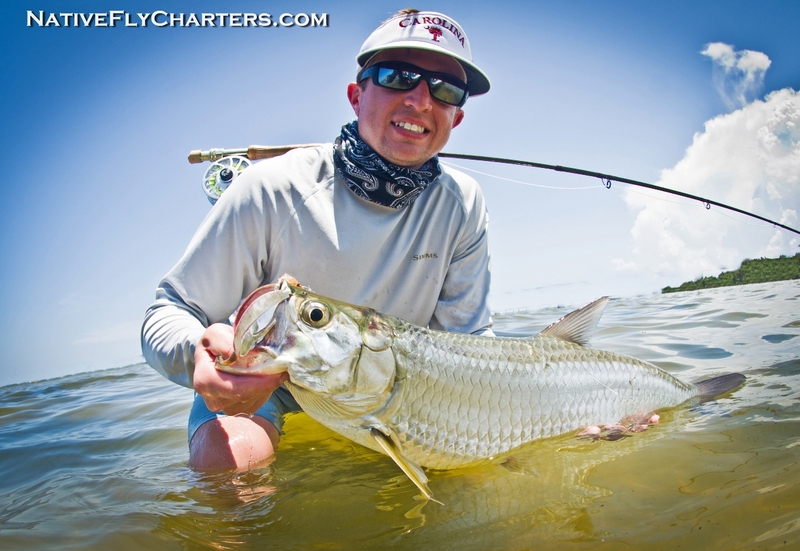 Tarpon, Redfish, Snook, Jacks, Sharks, Bluefish and Spanish Macks have been following the bait off the beach. 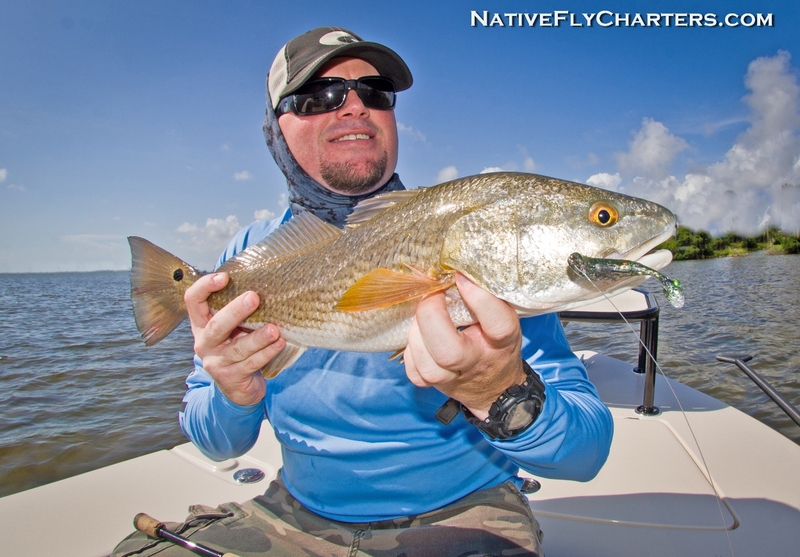 Inshore, the redfish have been fired up and plentiful, juvenile tarpon are still lingering around, sea trout are starting to lay around in the sand, and some snook can be seen cruising along tight to the mangroves. 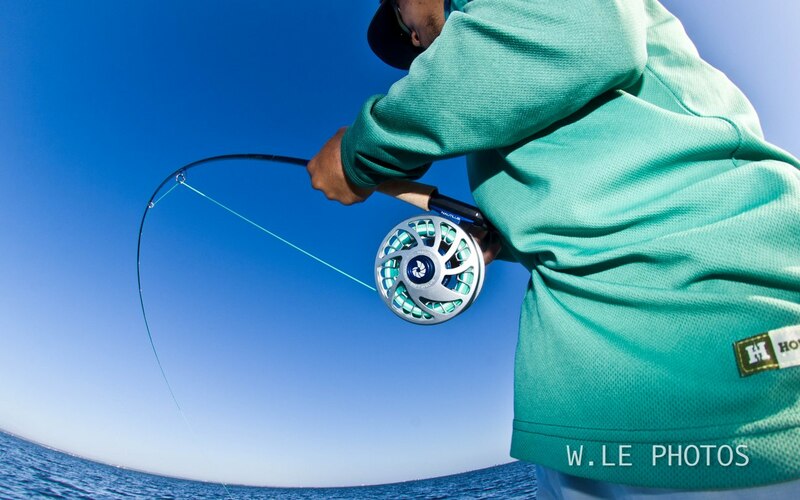 Conditions for sight fishing is excellent if the sun is out. 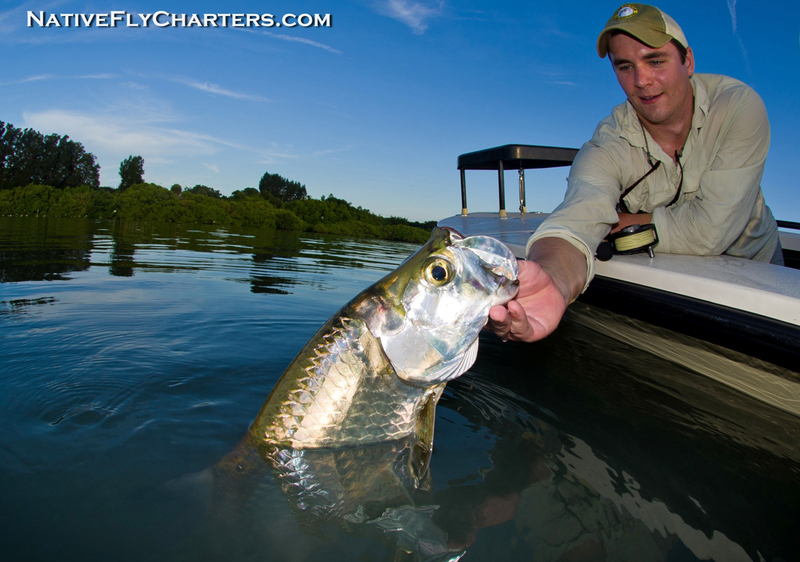 Fish have been aggressive and happy to eat if you can put a fly or lure in front of one. 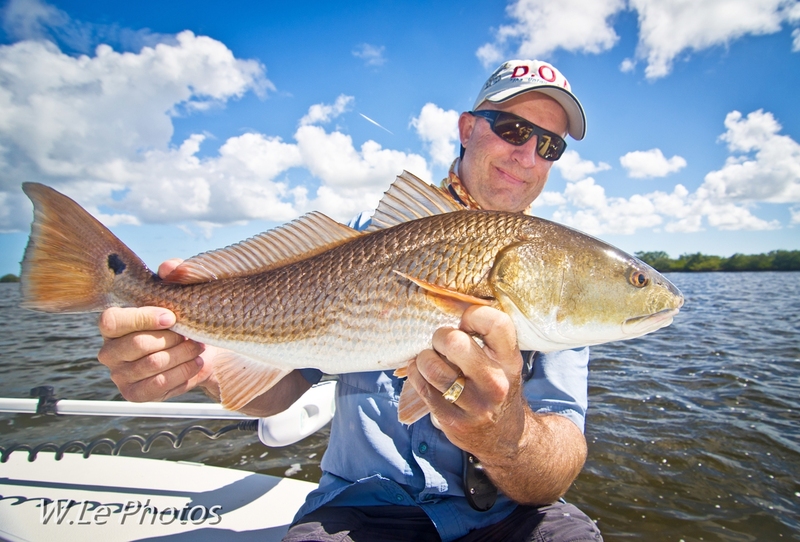 David and his father Jim from Louisiana got into some good redfish action on topwater lures. 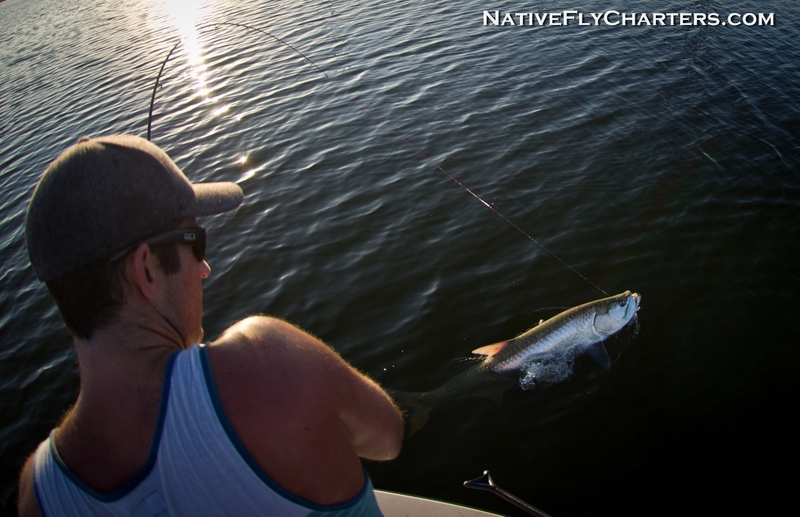 Alex from North Carolina got his first Tarpon on fly. 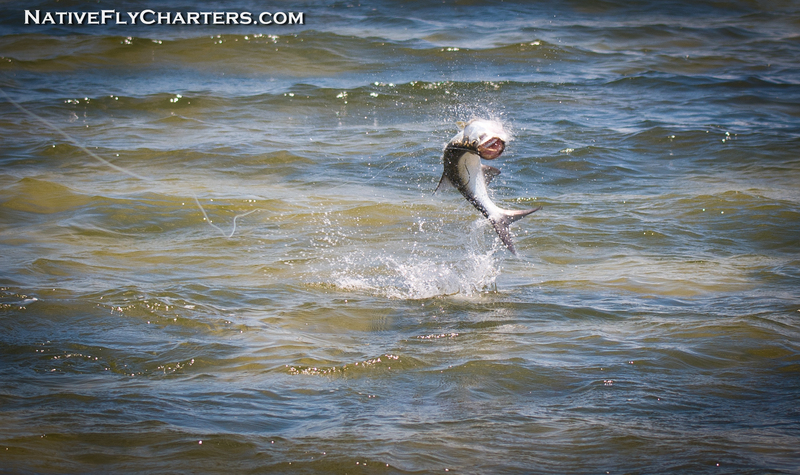 Jack from South Carolina got into some good tarpon action this day. 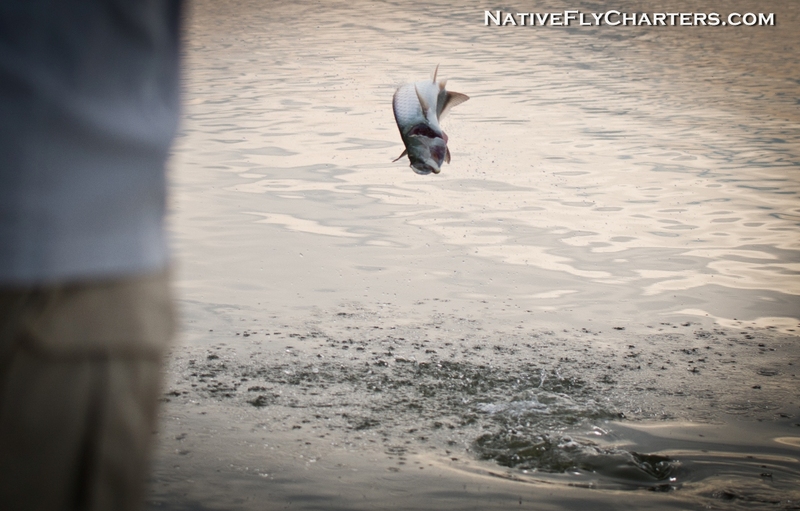 Watching them smash surface flies was so much fun. 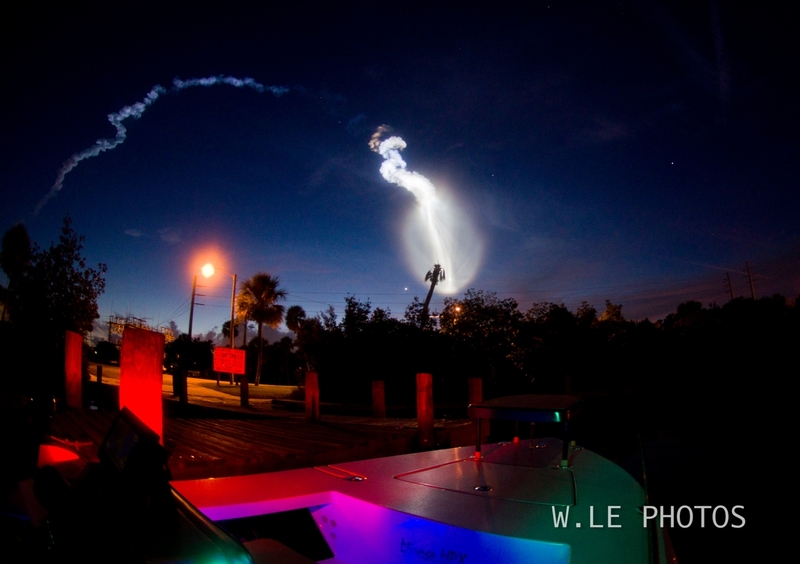 We also got to witness a spectacular rocket launch from the ramp that morning. Adam from Minnesota fish with me for 2 days. 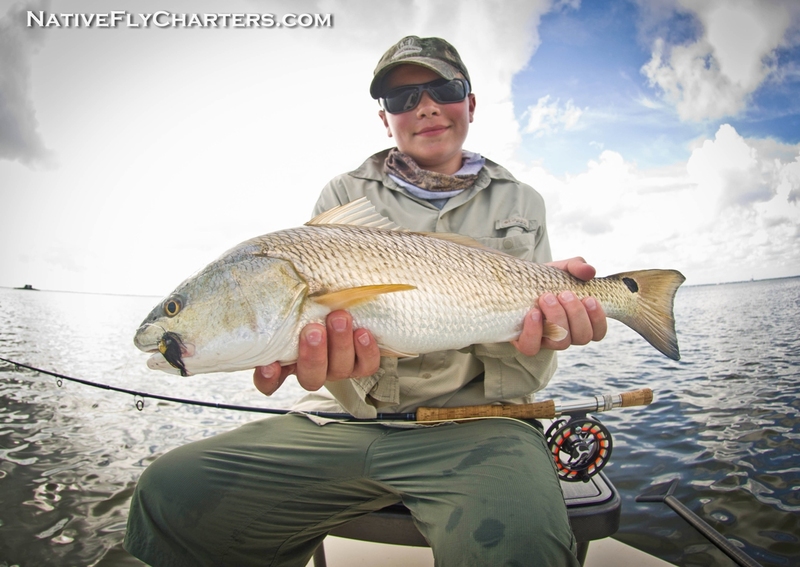 This was his first time sight fishing from a skiff and only his 2nd time in the saltwater. He did very well presenting flies. 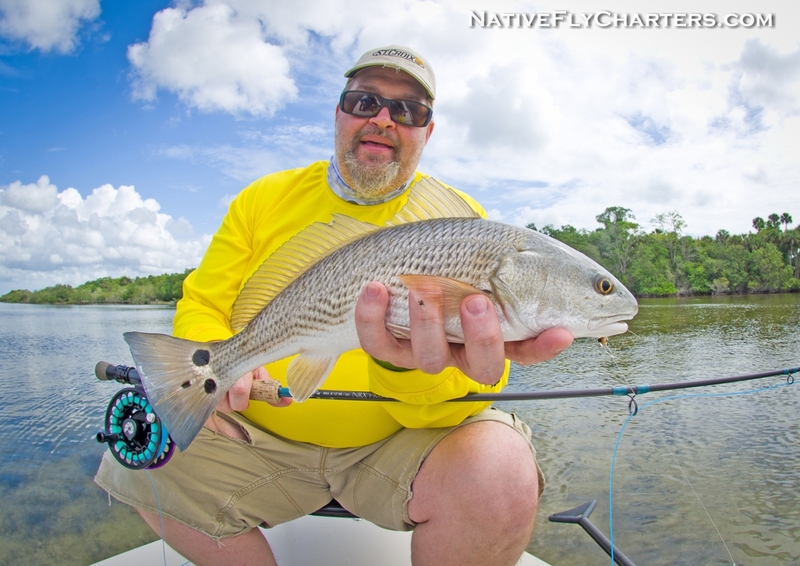 My buddy Honson came up from Miami to target big redfish on poppers. 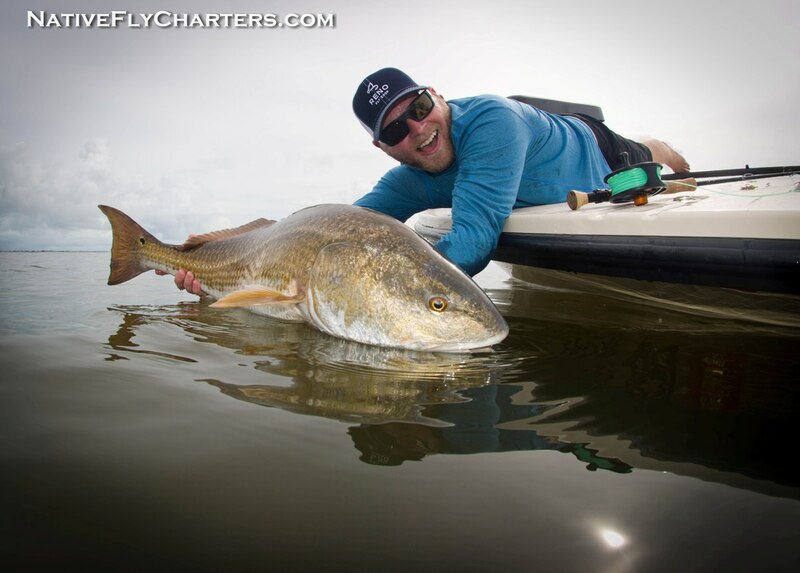 He got his biggest redfish on fly, congrats buddy! 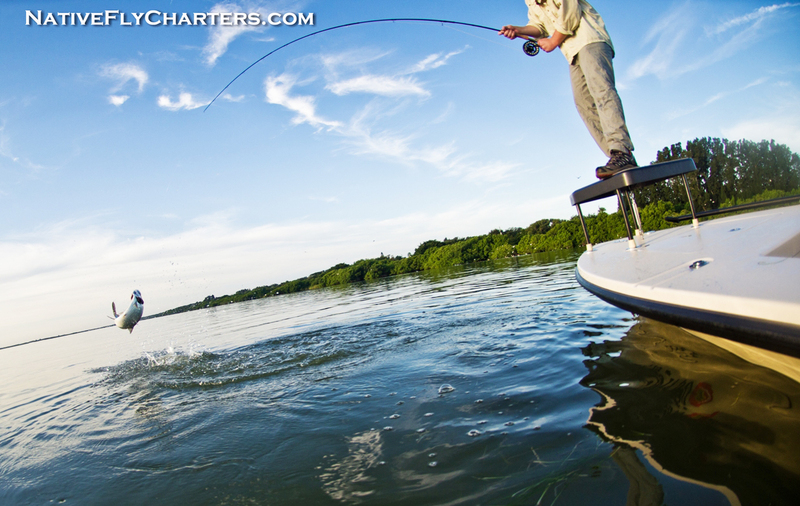 Fall is here which means cooler weather and excellent fishing! 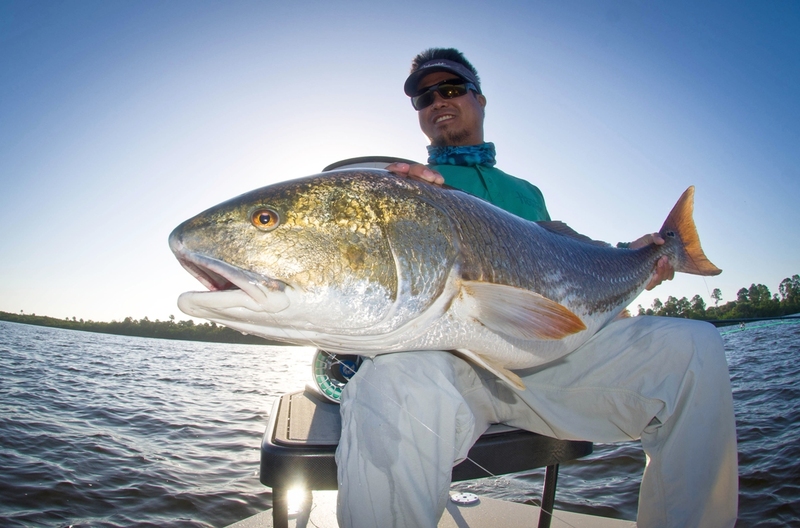 One of my favorite seasons to target big redfish. August is the slowest month of the year for me. Mainly because not many people can handle the Florida heat. 1/2 days and 3/4 days are most popular during the heat wave of August, which is fine because the bite tends to slow down around noon. 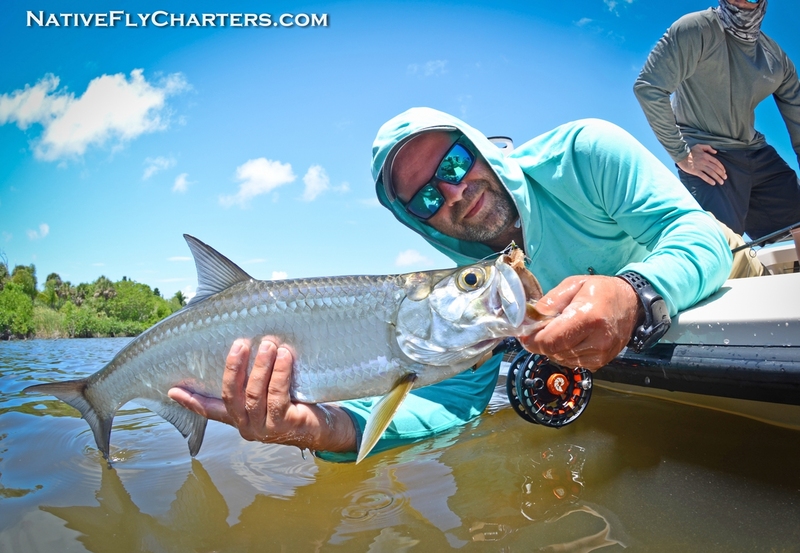 August is also the best month for inshore Tarpon in my area so I am not bothered by business being slow, that means I get to go out and catch some Tarpon for myself and have a little fun! Small signs of algae bloom having been showing in the Indian, Banana, and Mosquito Lagoons. 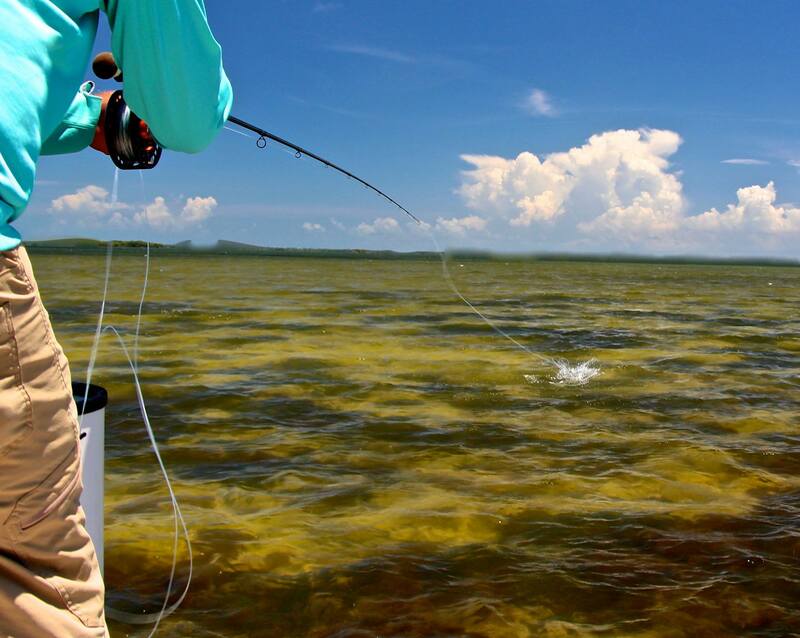 Pea green water and some dead fish has been spotted throughout the lagoon system. 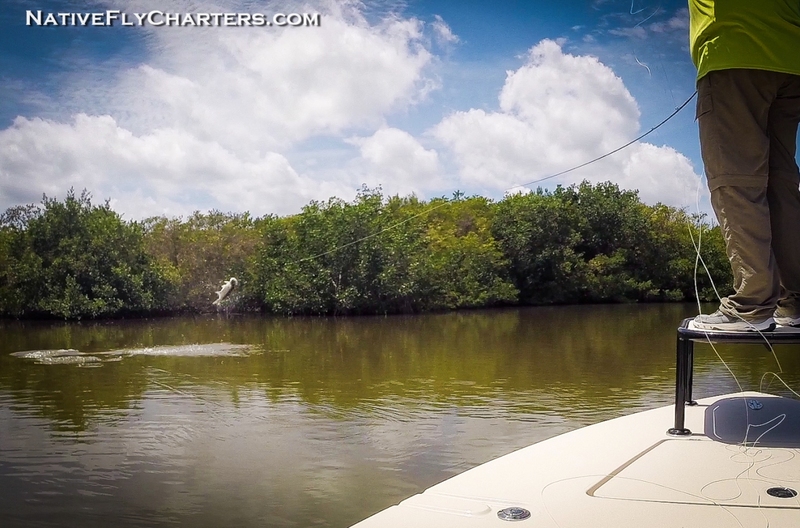 Luckily it’s mainly catfish and puffer fish that are taking the hit, but still…not a good sign. 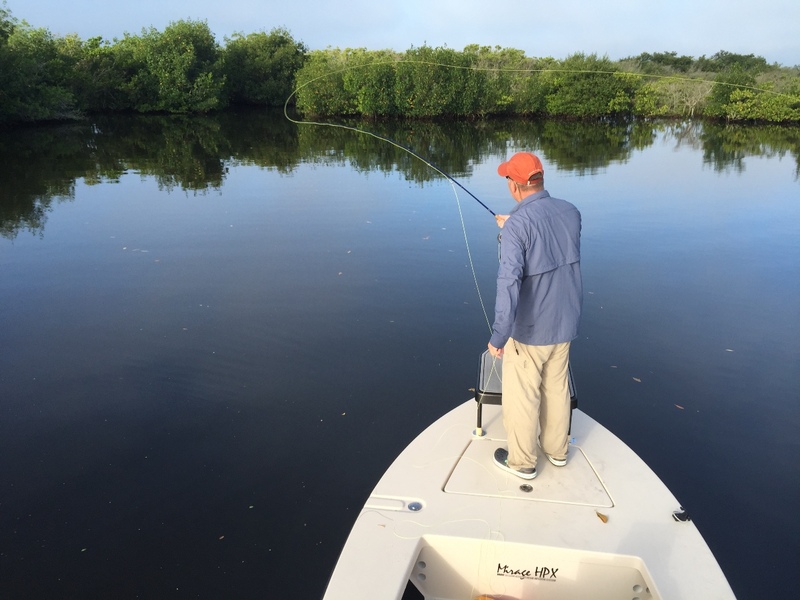 Most of the floating fish I’ve seen are in the residential areas of the Banana and Indian River, so lawn fertilizers and pesticides being run off into the lagoon from the rain may play a part in it. If you live near or on the River, you may want to think twice about what you spray on your lawns. On the bright side, the sea grass that we lost due to bad algae blooms in the past few years has grown back thick this year. I’m just hoping these small signs of algae bloom remain small. 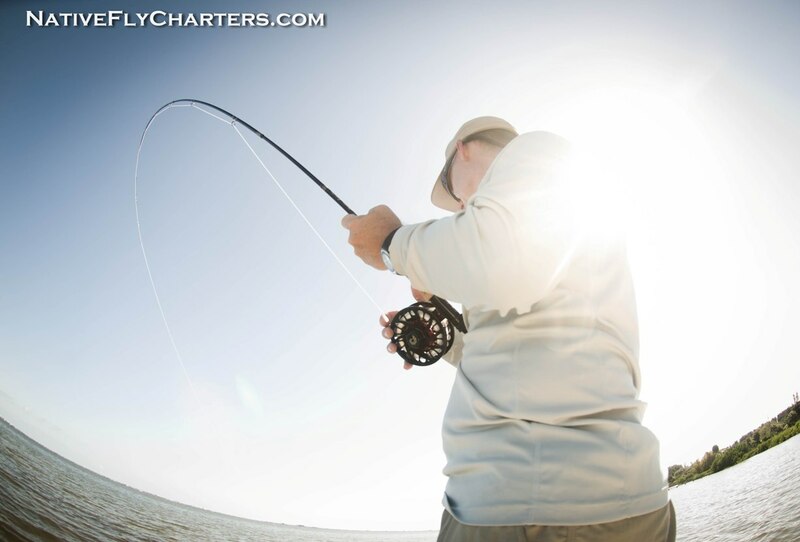 For the guys and girls that did brave the heat this month, they were treated with light winds and good fishing. 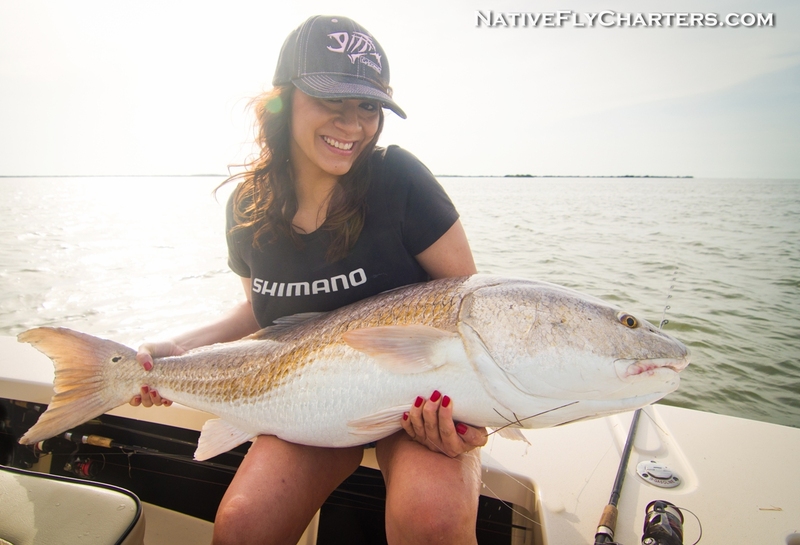 Regulars from South Carolina Carlos and Jennifer were some of the brave ones to fish this month. 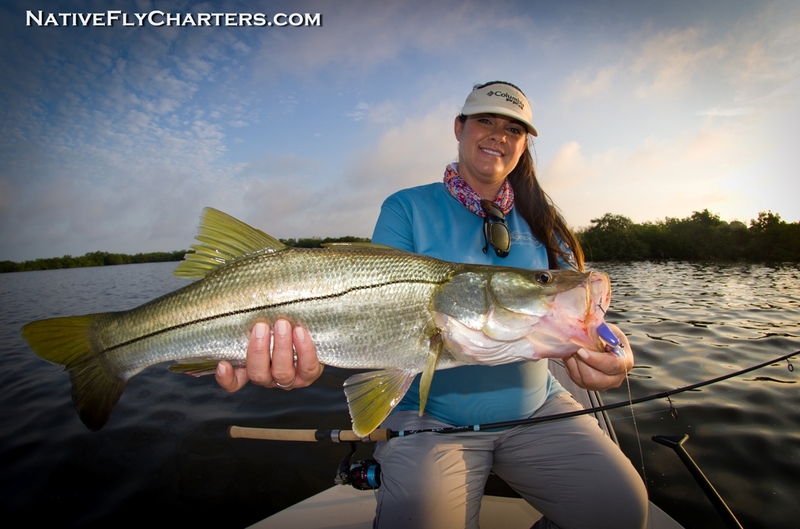 Jennifer is 8 months pregnant and wanted to fish one more time before having their baby. 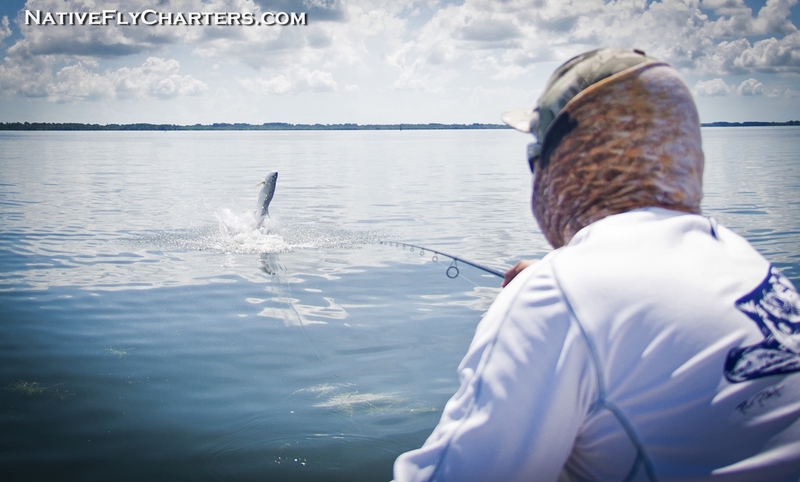 Hunter from North Florida got his first tarpon this day. 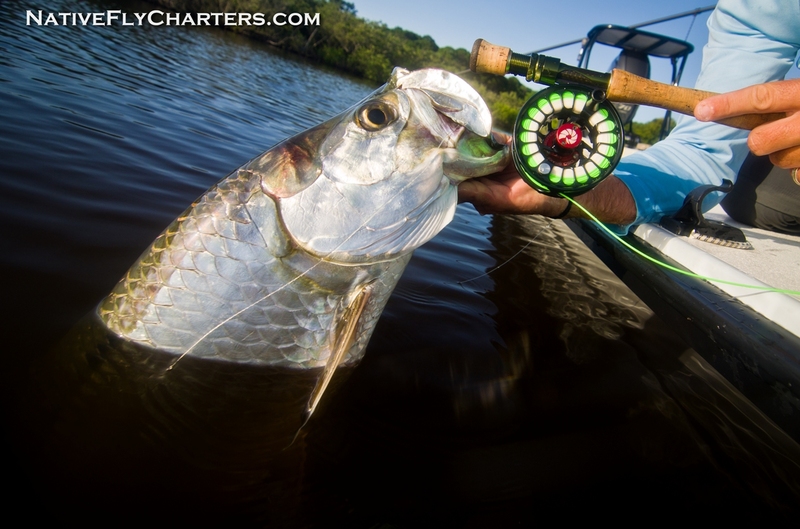 When the timing is right and the stars align, bigger tarpon can be found in the Lagoon system. Charlie from Cocoa Beach, FL. 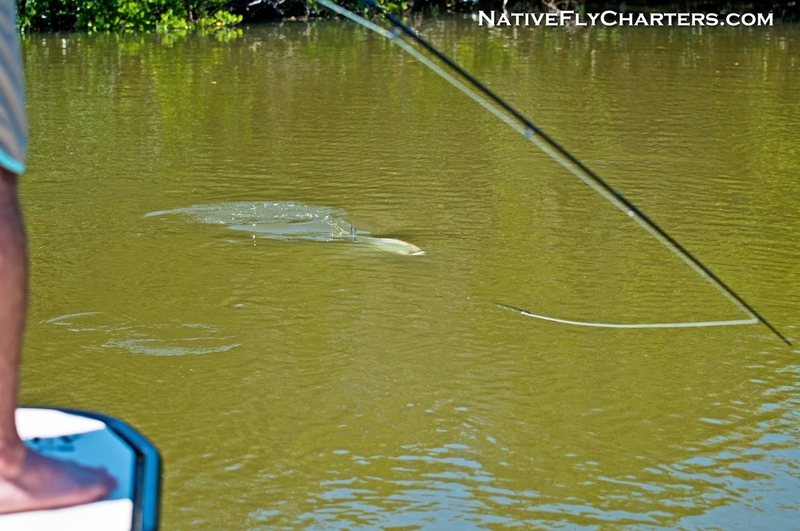 got to pull on a grown one that ate a D.O.A. 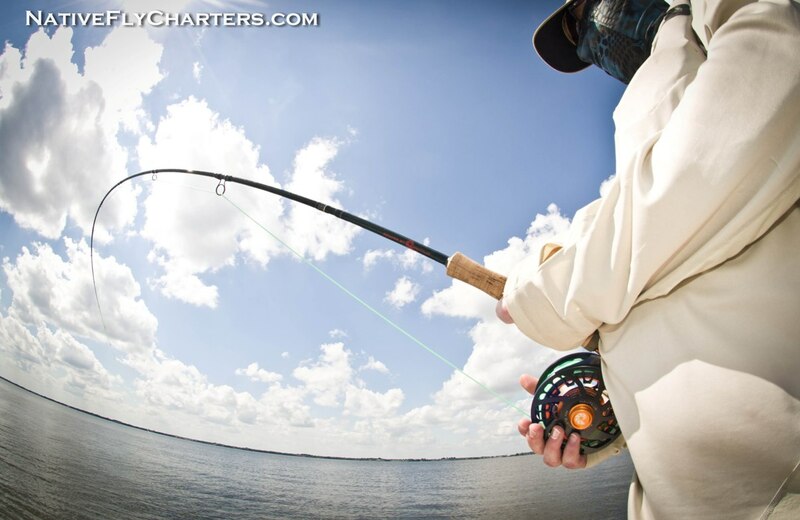 Baitbuster. 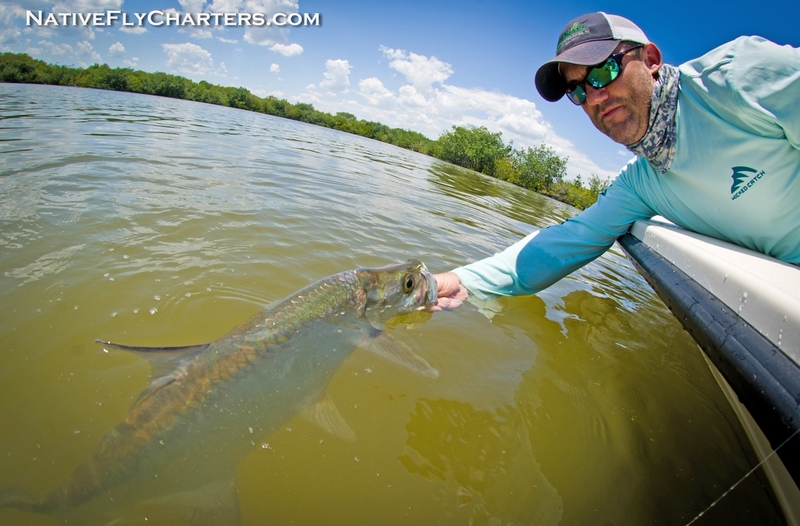 Jamie from Jacksonville got a tarpon on a popper fly first thing in the morning when the fish were happily blasting small minnows on the surface. 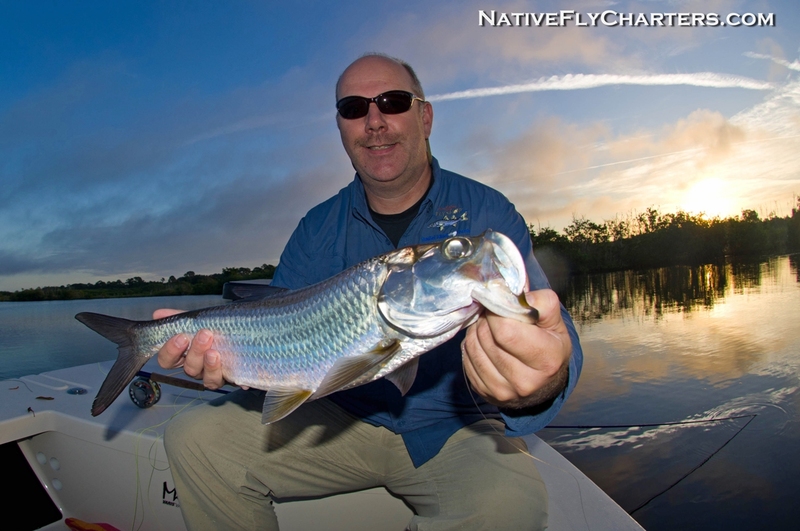 Don from Jacksonville was flying these small tarpon all morning using a 3″ D.O.A. Shadtail. 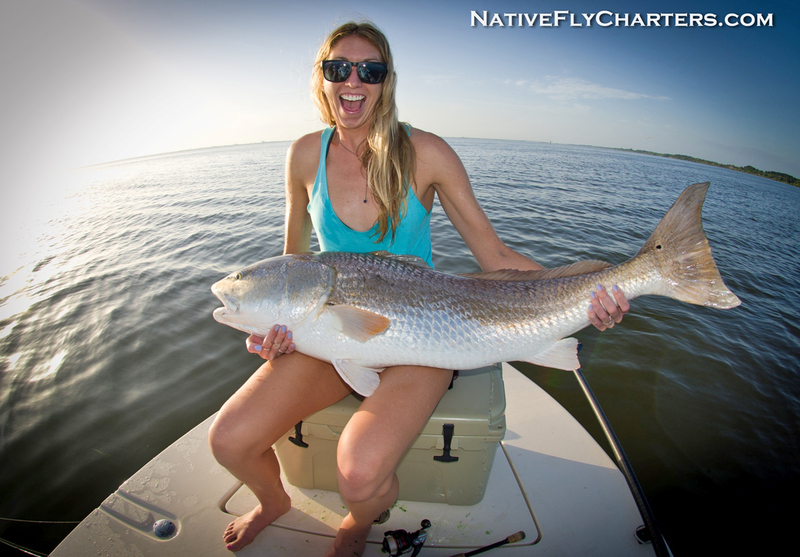 Big redfish start to group up this time of year as well and Savannah from Cocoa Beach wanted to catch one, so she did. 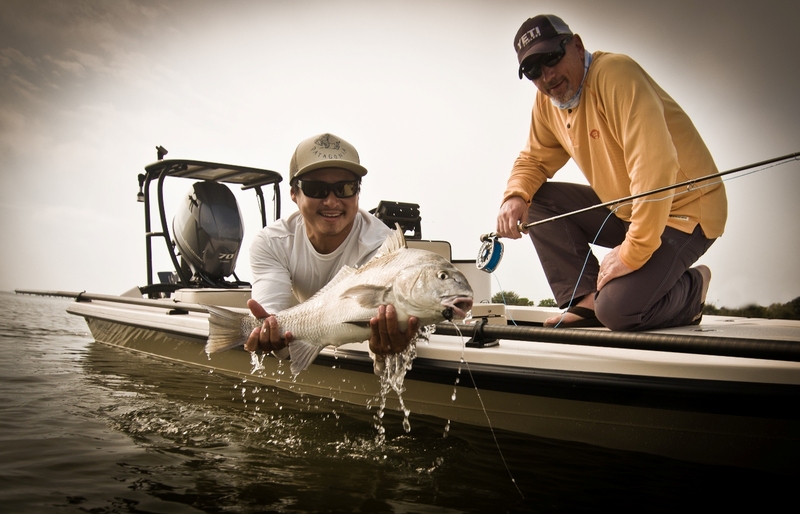 …and some photos fishing with friends. Wow what a busy month! 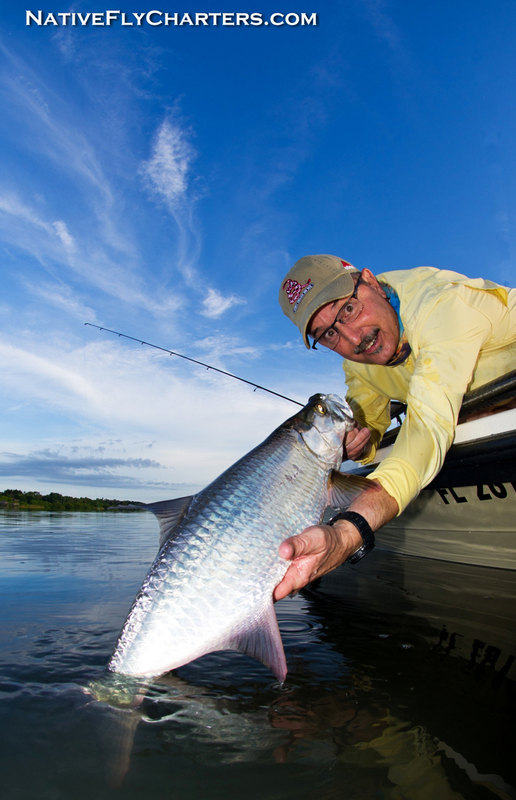 With the ICAST/IFTD Tradeshow being in Orlando again this year, it brings anglers and people in the tackle/lure industry from all around the globe. 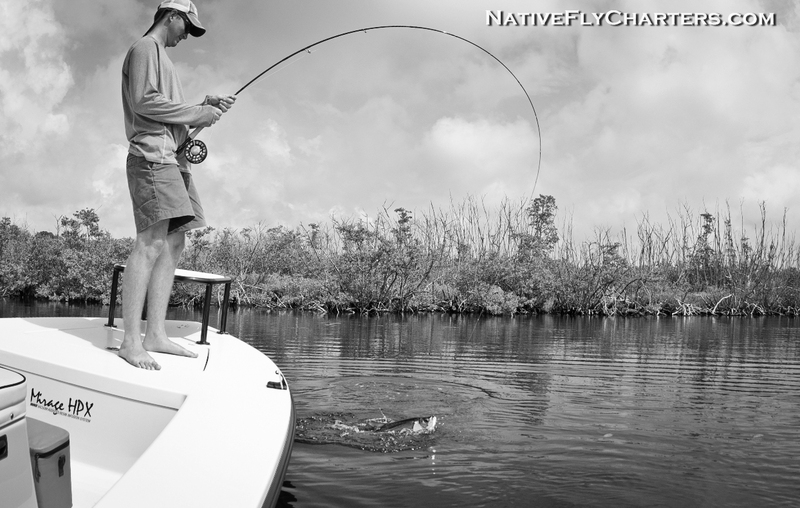 While they are in Orlando, of course they would like to try and fish new waters for a day. 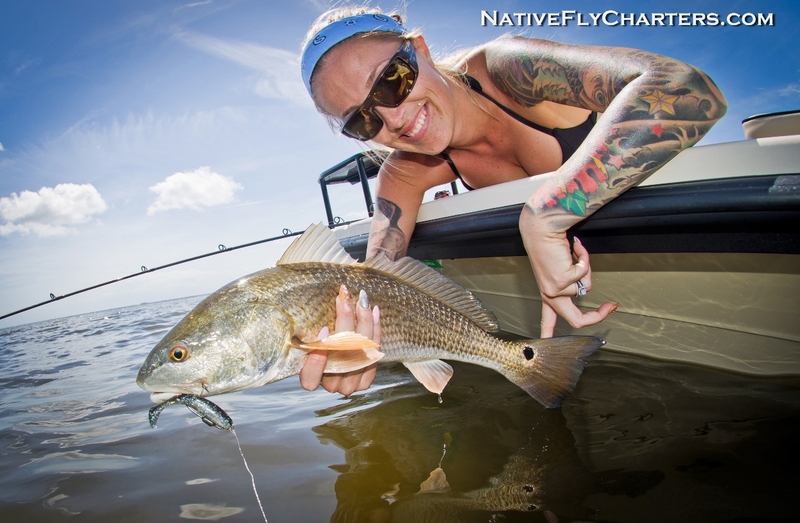 Since the Mosquito Lagoon, Indian River Lagoon, and Banana River Lagoon is the closest to Orlando, most guys and gals head my way so usually July gets pretty crazy for me. 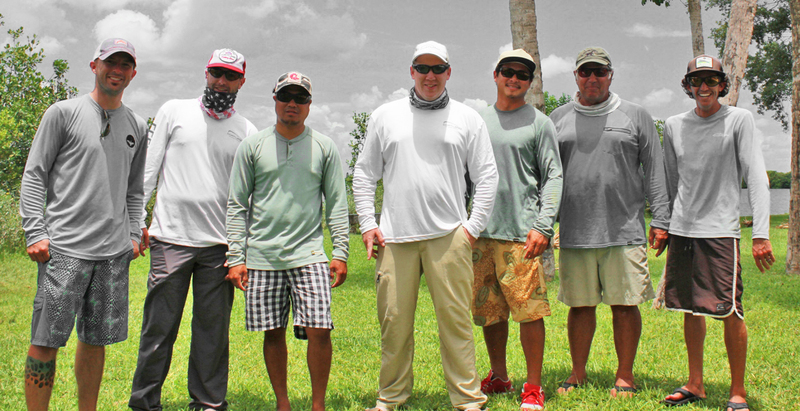 Its was great seeing everyone at the show and spending time on the water with the reps behind the companies I work with. Earlier in the month we had some flat conditions to cruise the beaches in my Maverick 17HPX-V. 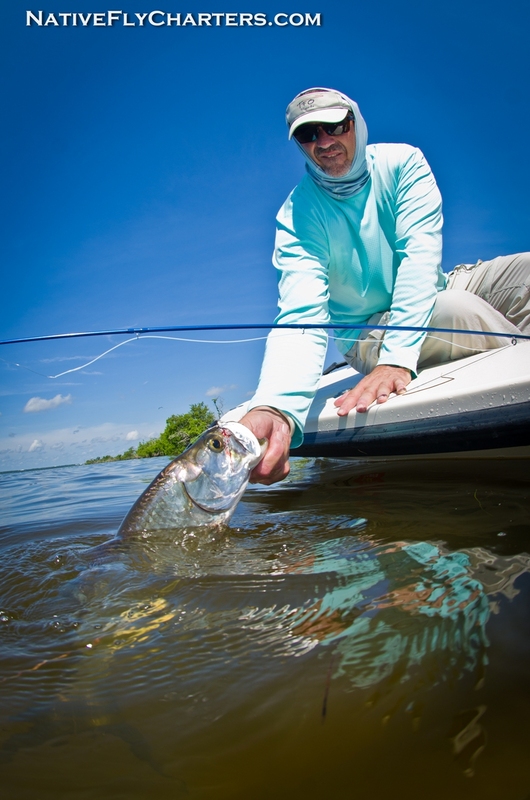 This time of year we can find Tarpon ranging from 40-150lbs migrating along the beach along with Cobia, False Albacore, big Redfish, sharks, bluefish, Spanish Mackeral, and Jack Crevalle. This day I decided to poke off the beach with Kevin. 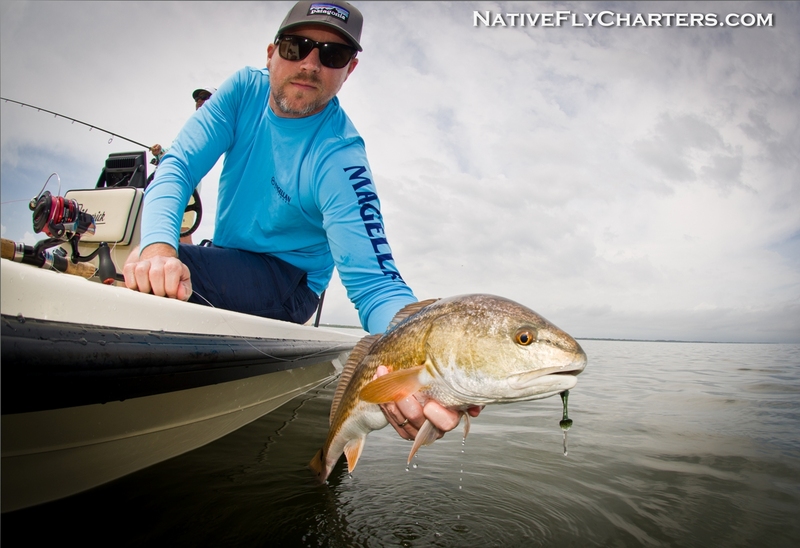 We had a few shots at Tarpon but not many, He caught False Albacore on fly until his arms were sore, and later on found some big hungry redfish that were crushing the D.O.A. 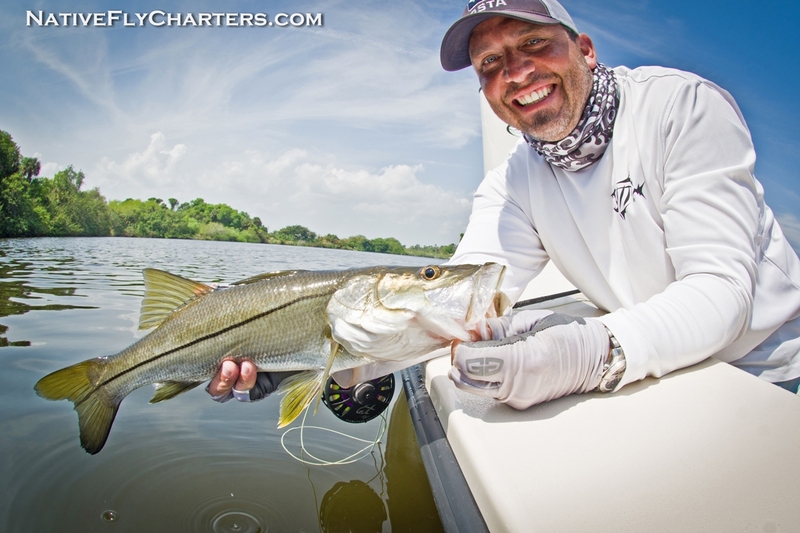 Baitbuster(trolling model). 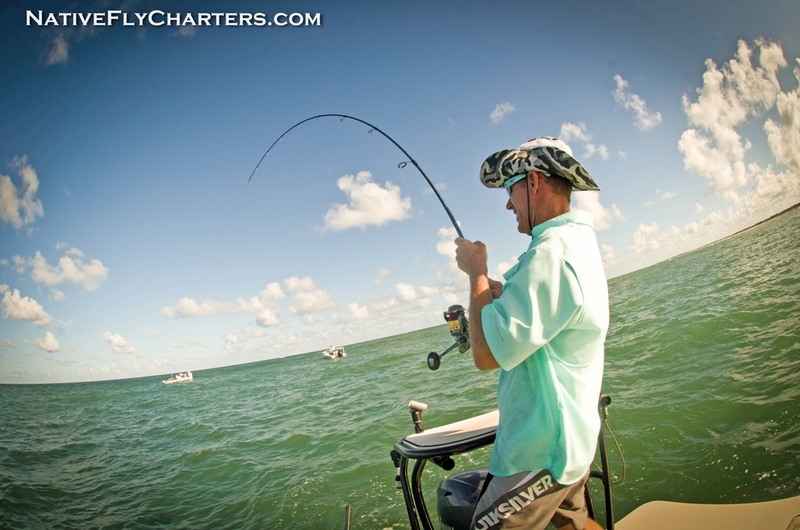 Brian and his wife Allison from Connecticut joined me for a 2 day adventure in hopes of Brian catching his first Tarpon. 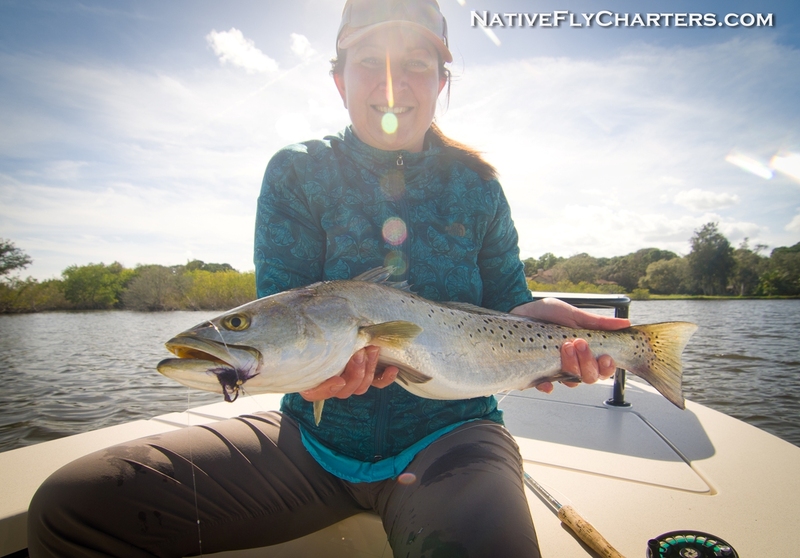 Day 1 – Jumped a few but none to the boat, but Allison got her a nice Sea Trout on a D.O.A. SHadtail. 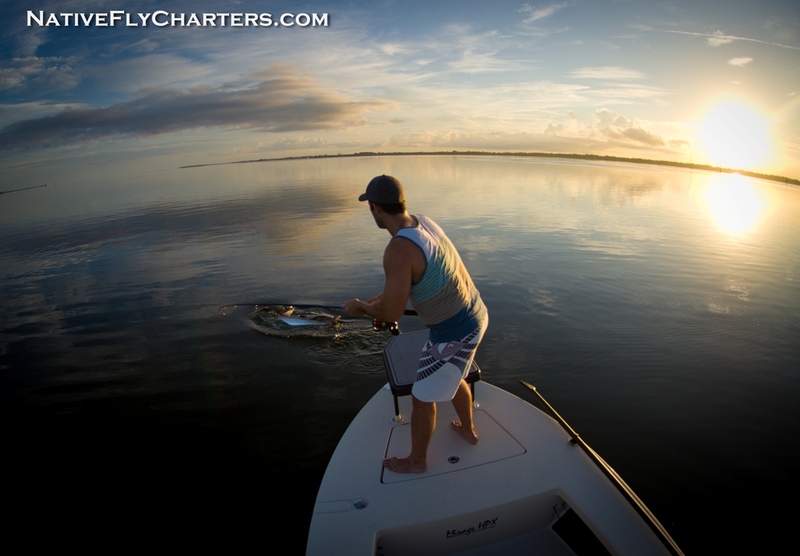 Day 2 – Brian get his Tarpon first thing in the morning to take the pressure off the day. 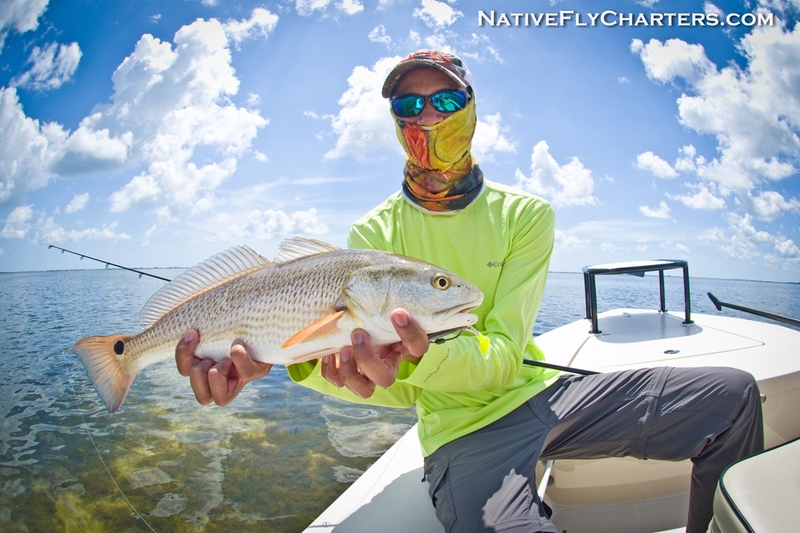 Then we look for Redfish which he got his first also, and to finish off the slam we go to a Sea Trout spot where he gets one on his first cast before the rain chased us off the water which is also his first. Great couple days for Brian and Allison, afterwards they went to Disney World. 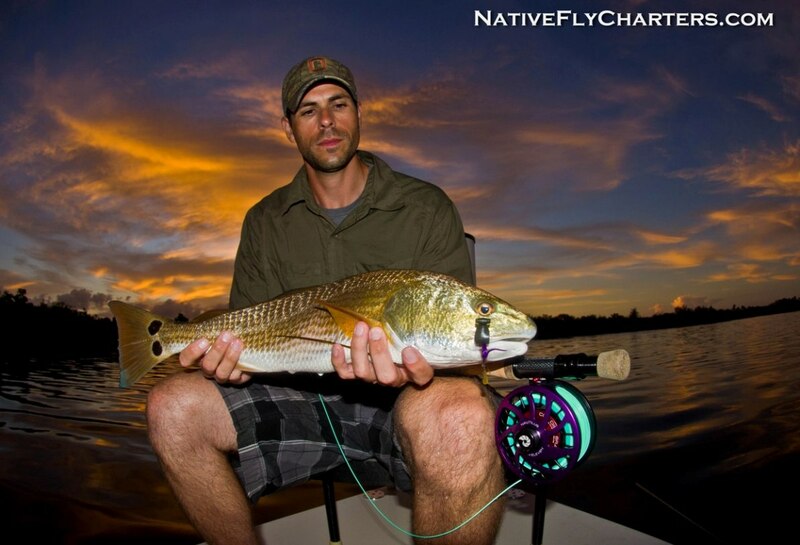 Chris from Gainesville, FL. 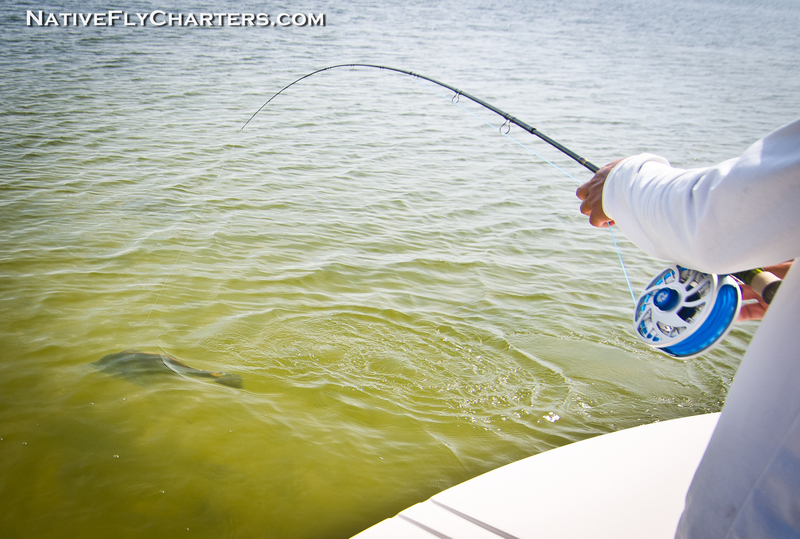 got his first Tarpon on fly on his 2nd or 3rd cast of the day, and jumped a few more afterwards. 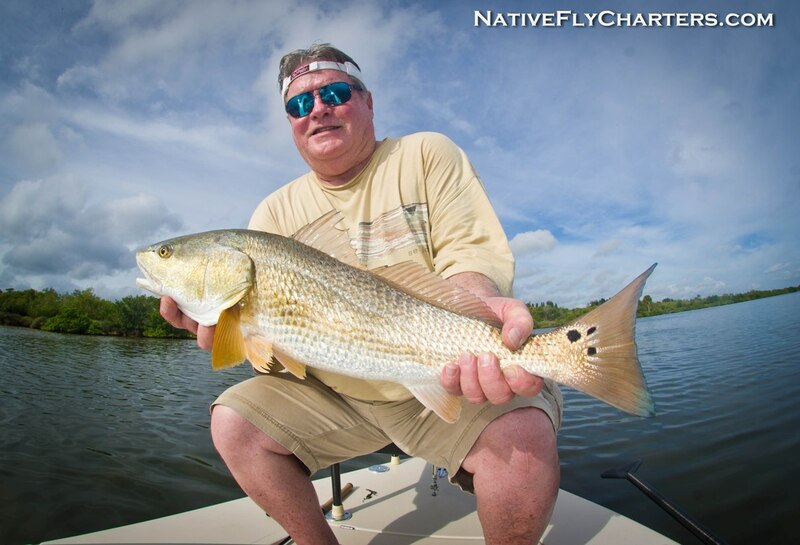 Ken from New York down for family vacation at Disney World snuck in a few hours on the water. 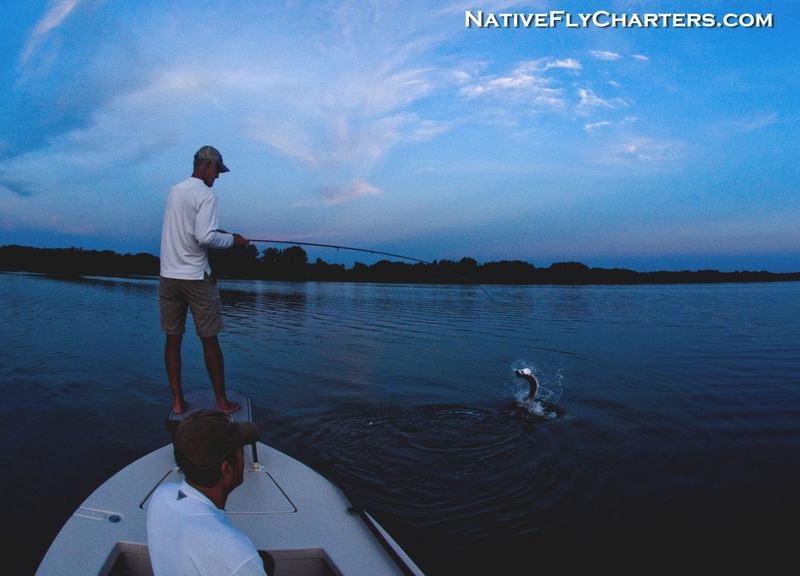 He also got his first Tarpon on fly. John from California came to Orlando for business. 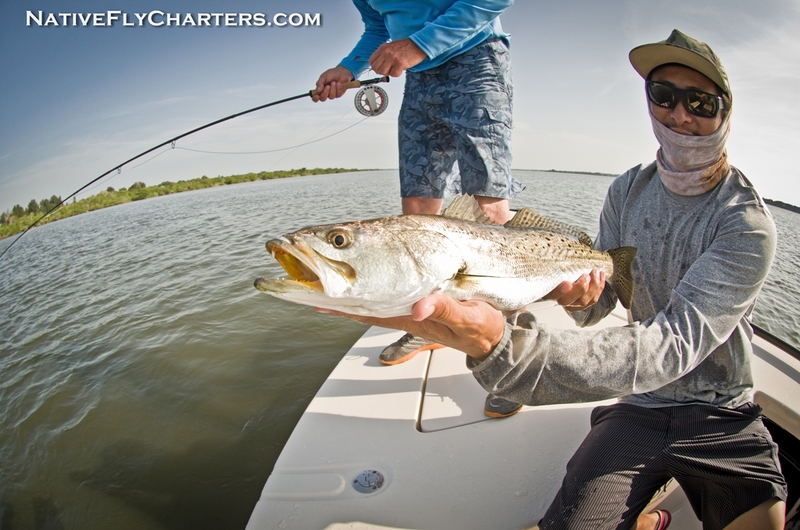 Spent a day on the water to catch his first Tarpon on fly along with a nice Sea Trout. 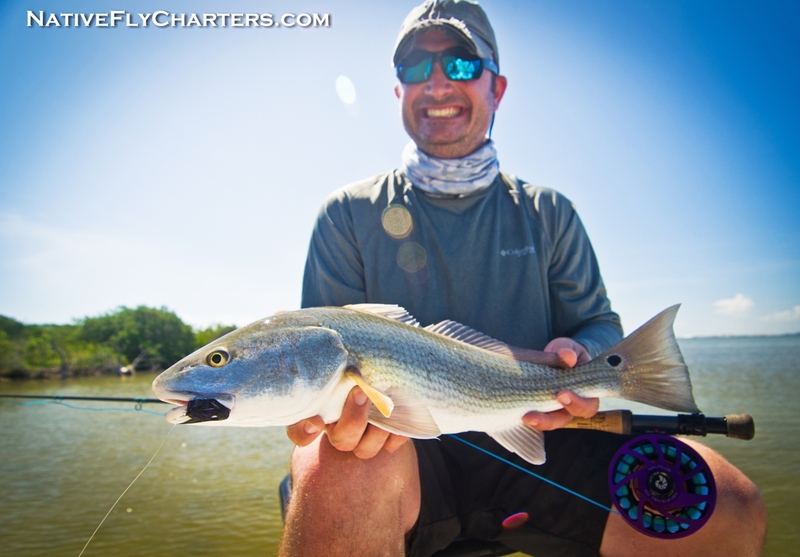 Travis from Amelia Island, FL. got what he wanted for his birthday. 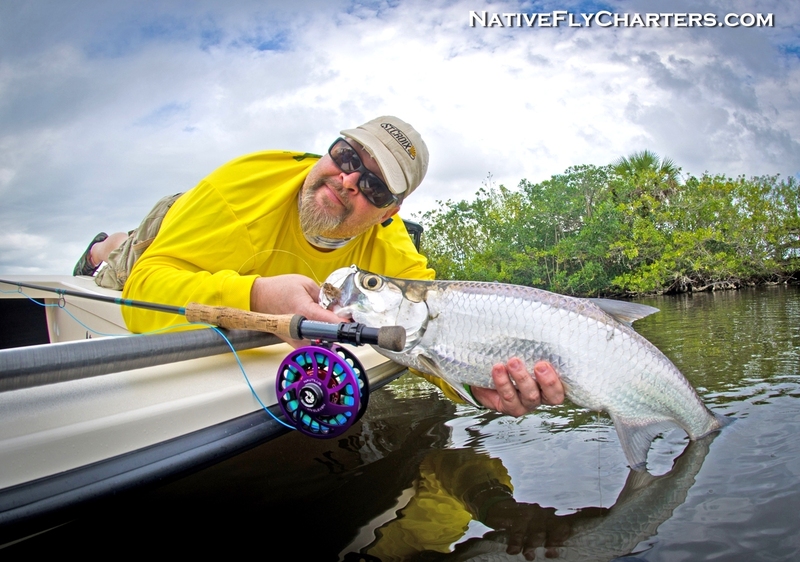 His first Tarpon on fly which he worked super hard for. 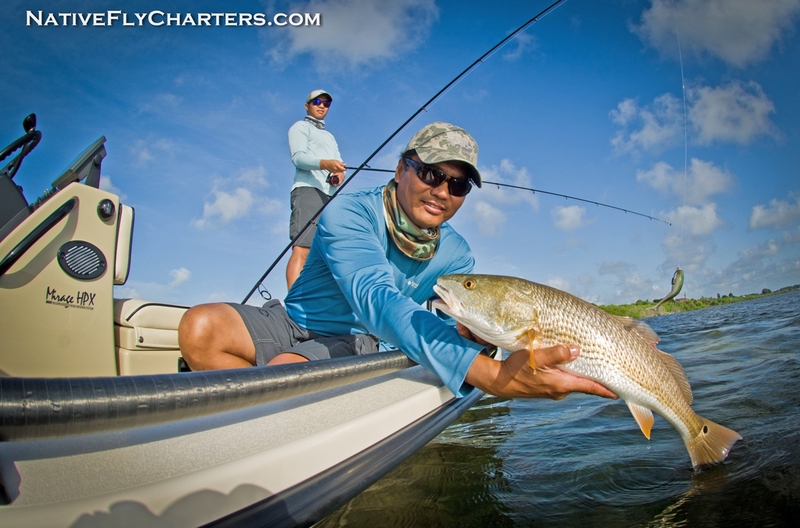 Earny from Surinam has only seen pictures of redfish on the internet or magazines. He finally got to catch one while he was in town for family vacation at Disney World. 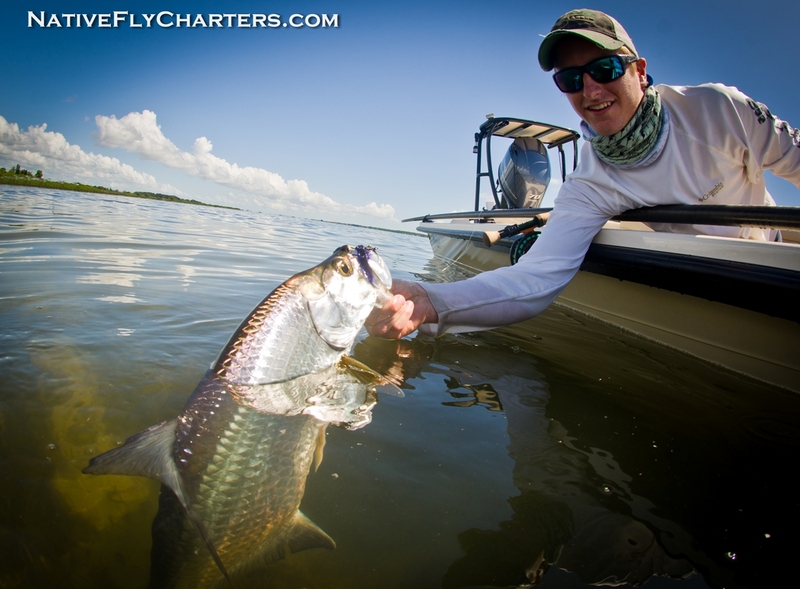 Logan from South Carolina got his first Tarpon on fly! 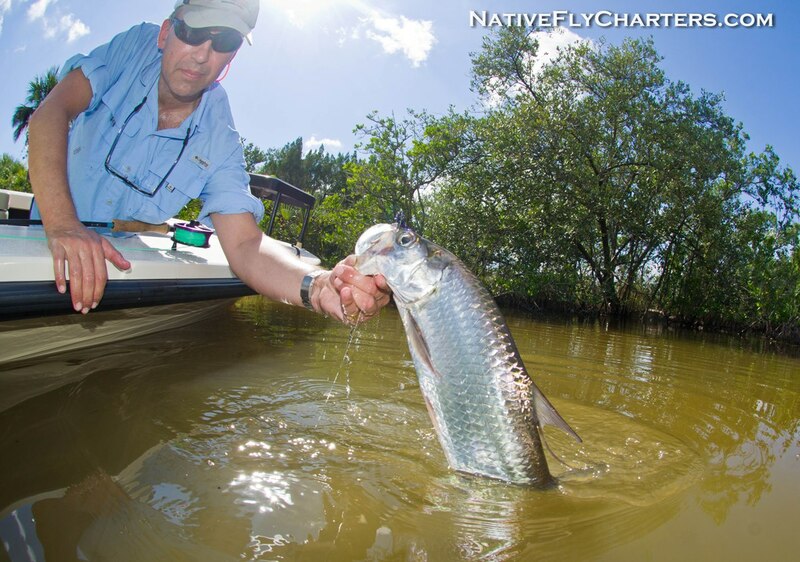 The Tarpon are still around and will continue to be around until the temperatures start falling usually late September/October. 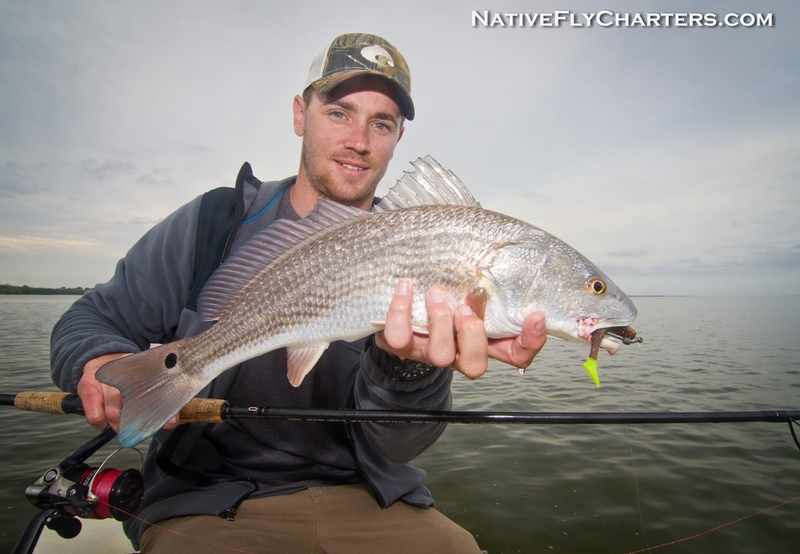 After that, the focus will be on Redfish, Sea Trout, and Black Drum. 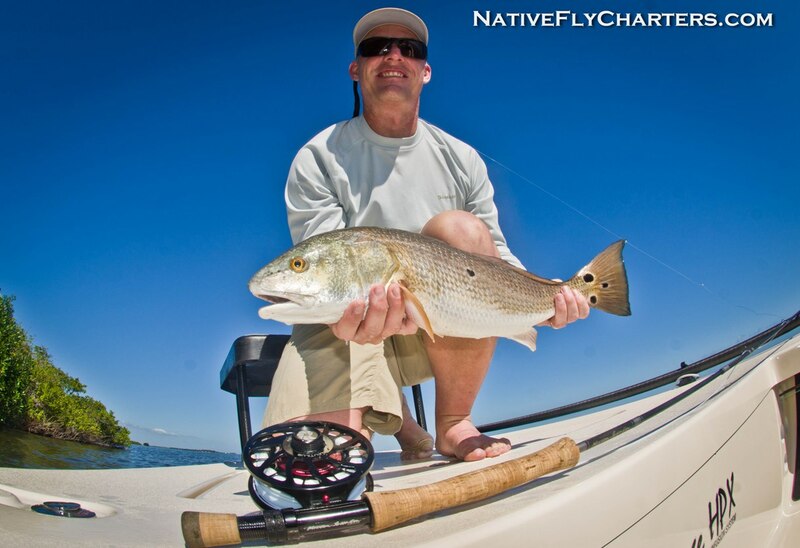 Thanks for visiting NativeFlyCharters.com and hope to see you all soon! 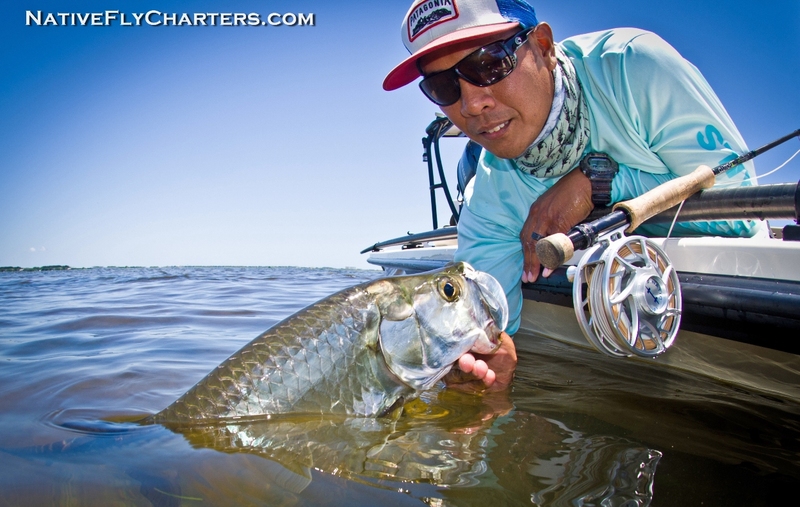 Tarpon is on the top of the list for this month. 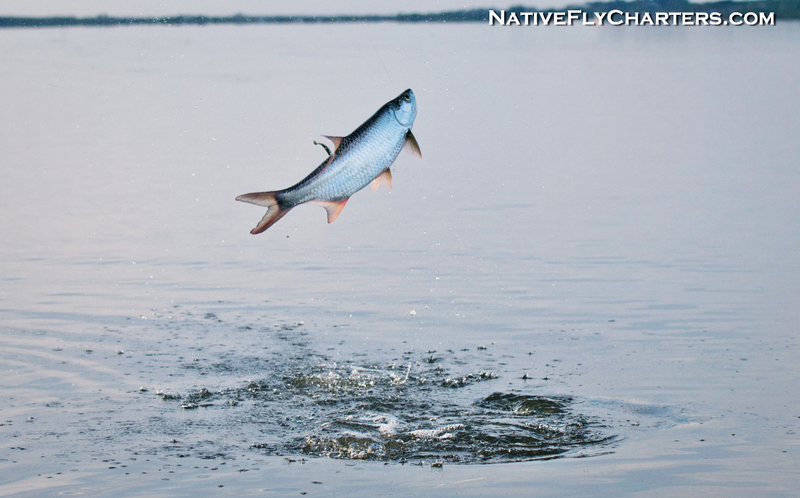 It’s been a good Summer so far for these acrobatic fish. 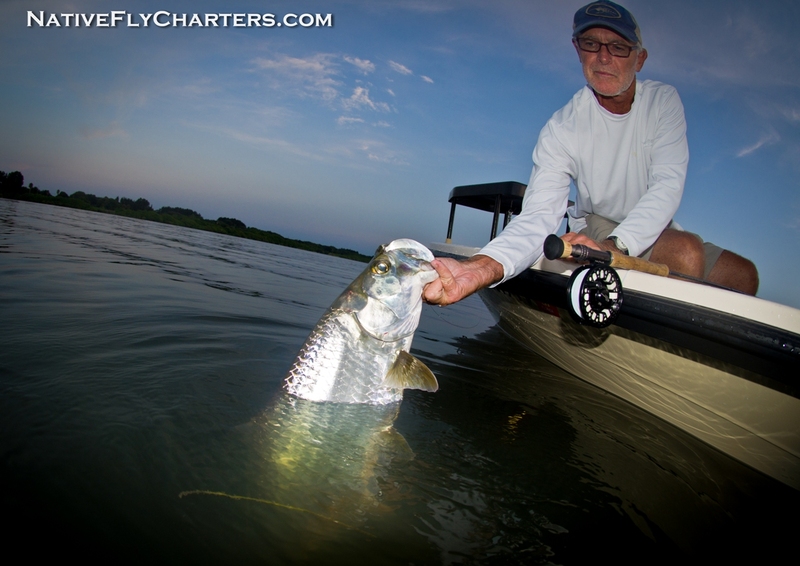 There’s been many first Tarpon on fly landed on my skiff so far this month from anglers all over the world. 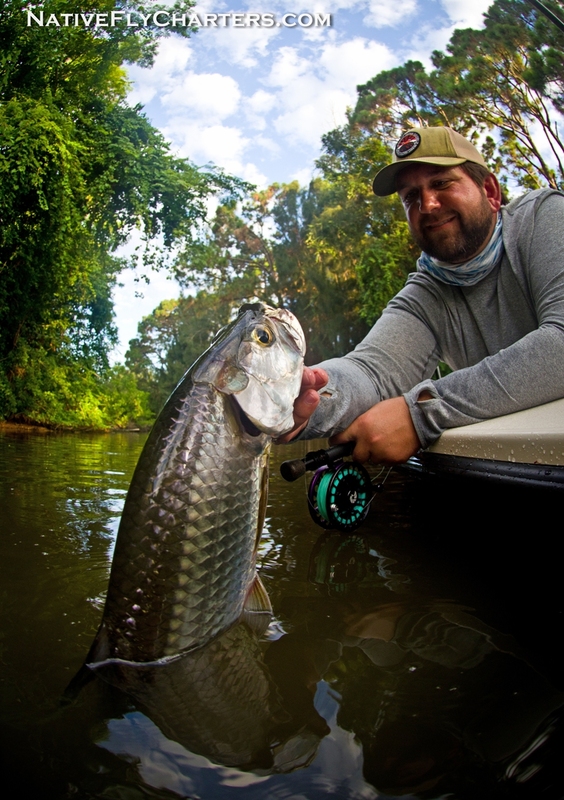 The ones that I’ve been consistently targeting in the lagoon systems are ranging from 10-30lbs and eating well place flies very well. 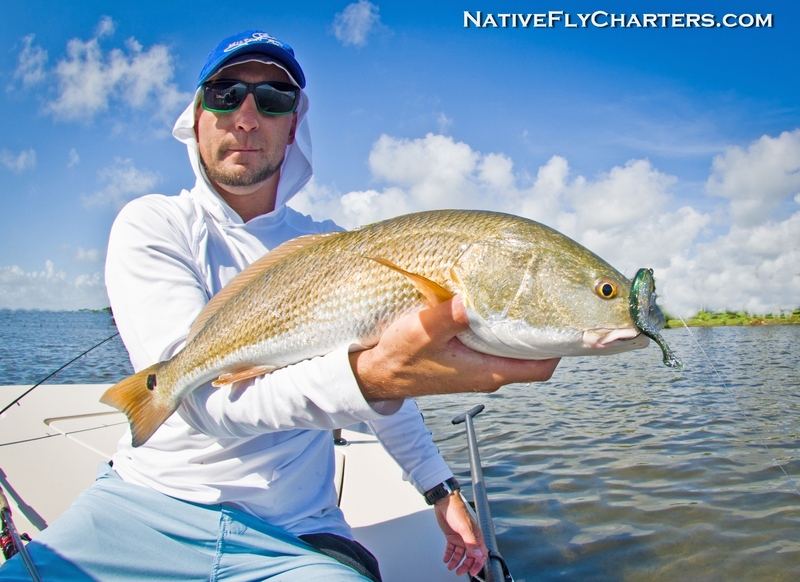 Redfish are also plentiful on the flats along with some cruising sea trout. Toby from Tampa, FL. 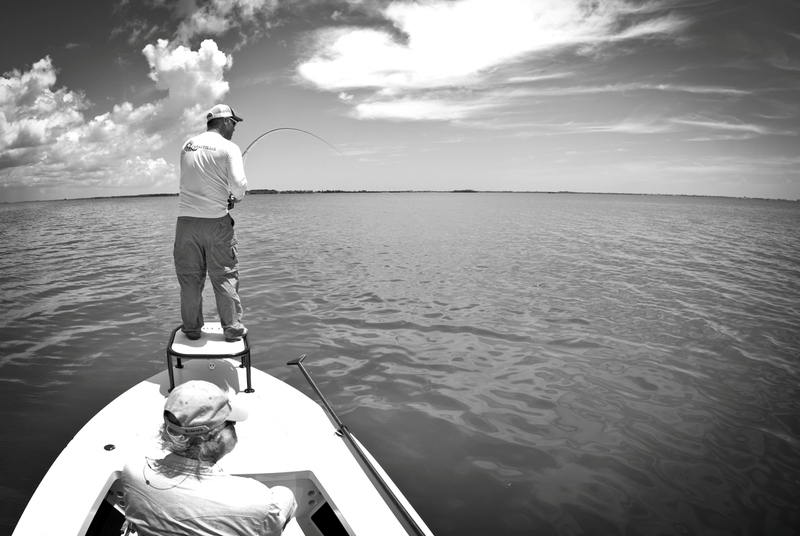 usually fishes with bait. 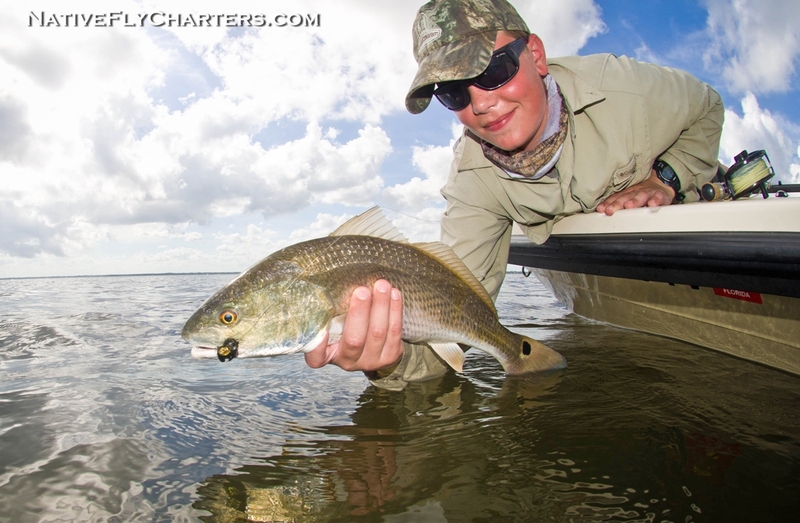 This day he wanted to try sight fishing with lures and found out out tough it can be spotting fish and making the right presentations. 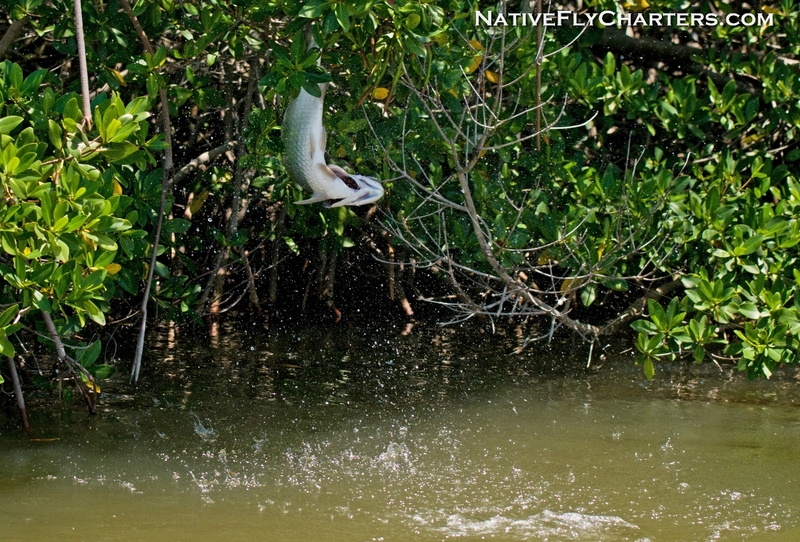 He did manage a few fish but definitely had a lot more opportunities. 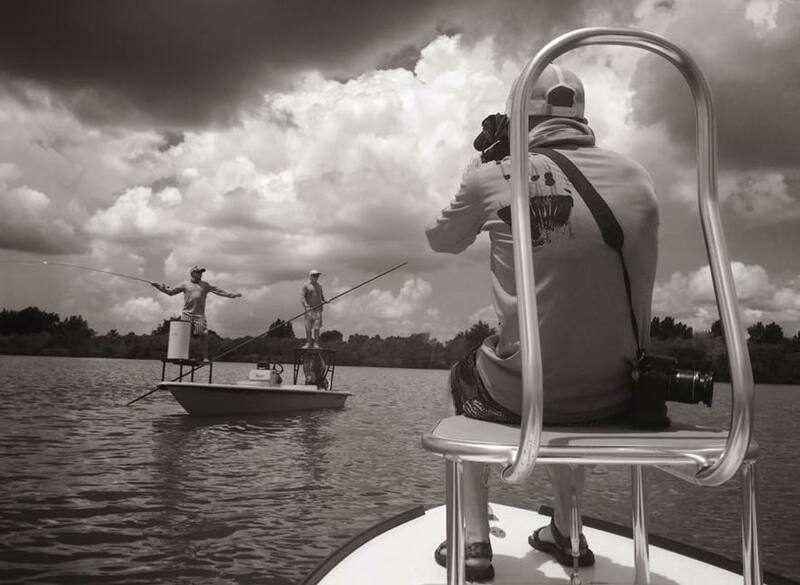 Allen and his son Noah from Jacksonville having some quality father and son time. Tim from Tampa, FL. 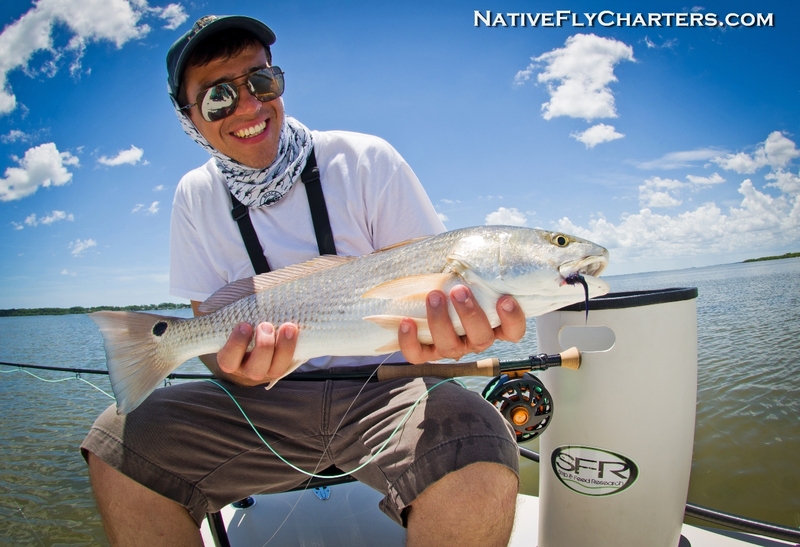 with his first redfish caught on a D.O.A. Shadtail. Rich from Jacksonville, FL. 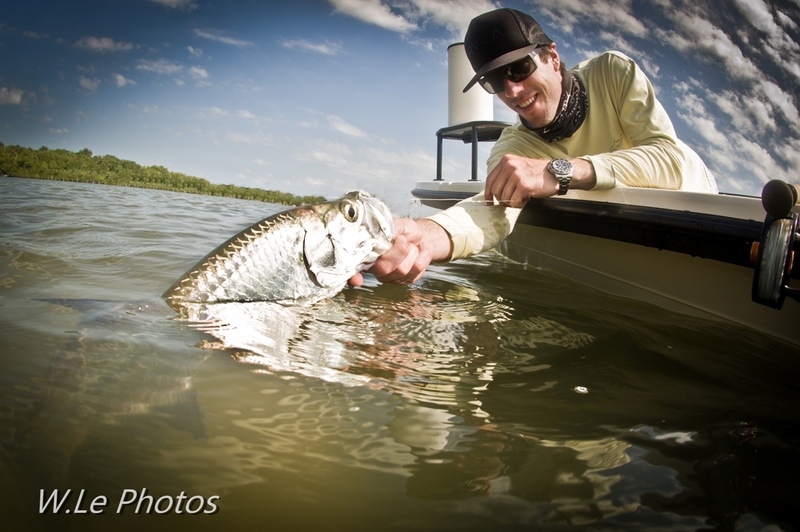 with his first Tarpon on fly! 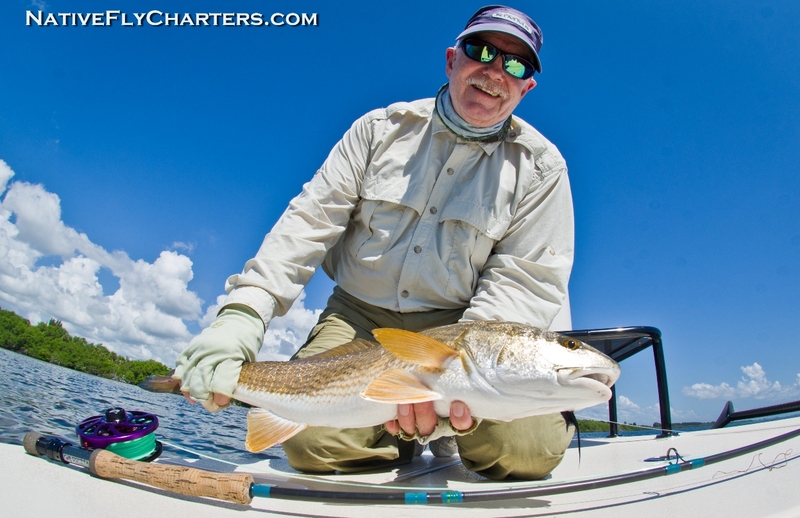 Bill from South Florida had shots at tarpon that were being uncooperative this day, but the redfish seemed to be happy. 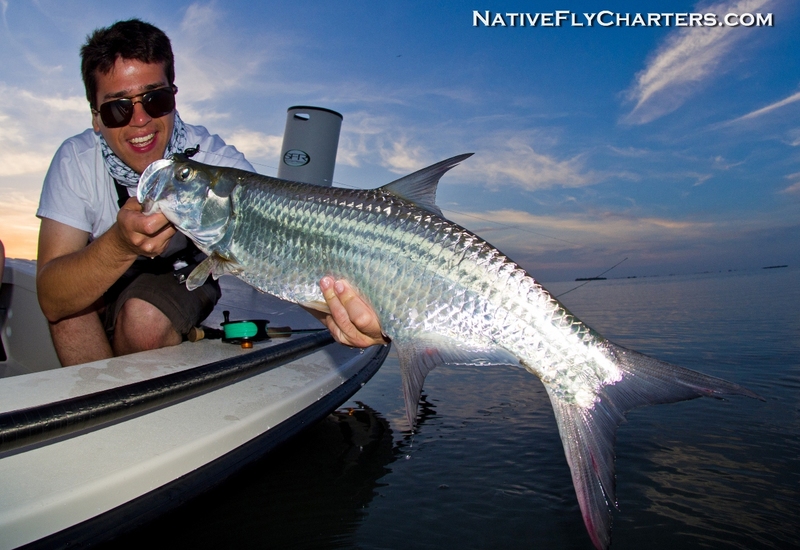 Zach from Georgia with his first Tarpon on fly! 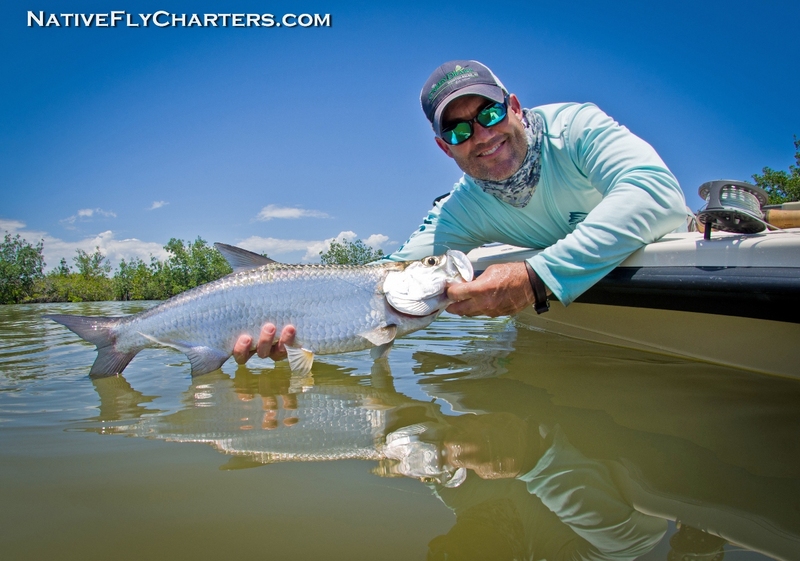 Lee from South Carolina got in the water to snuggle up with his first Tarpon on fly. 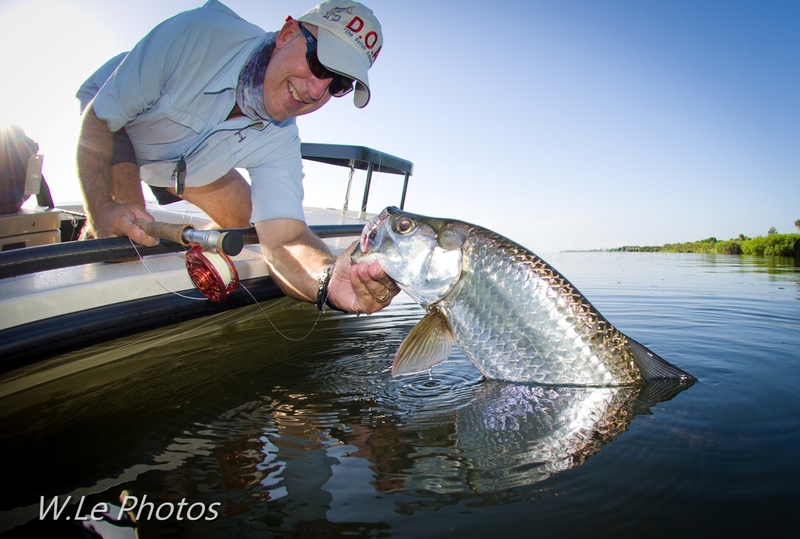 Gary from North Carolina had some fun with Tarpon and Redfish this day. 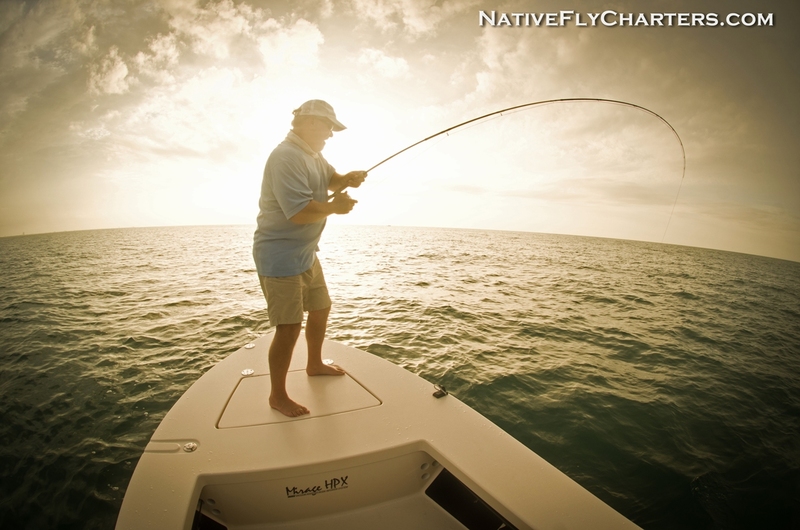 Thanks for visiting NativeFlyCharters.com…see ya next month! 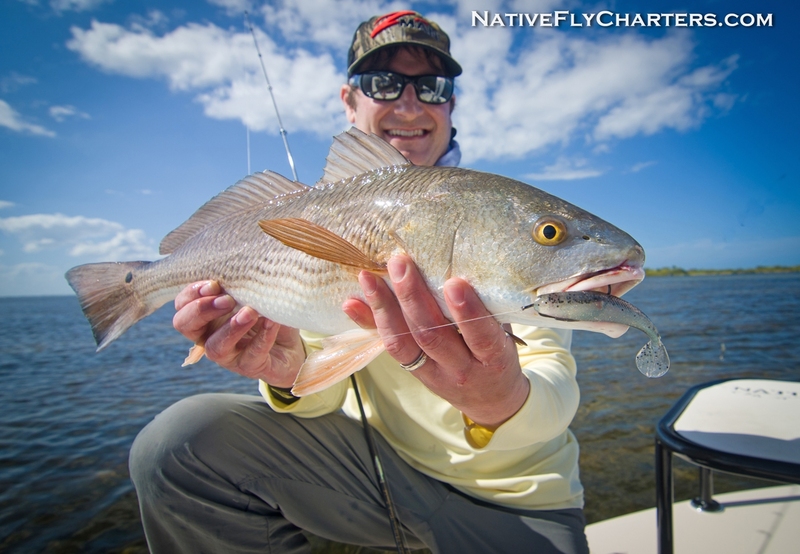 Welcome to this months Native Fly fishing report for the Space Coast of Florida. 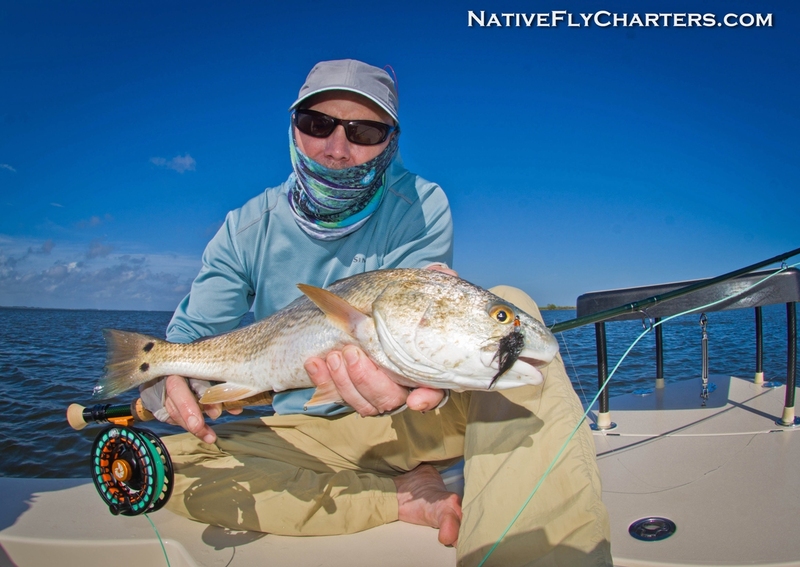 In the last few weeks, we have been blessed with light winds and sunny skies which is a fly fisherman’s dream… especially when there are an abundance of fish present. That was the case for many of my customers this month. 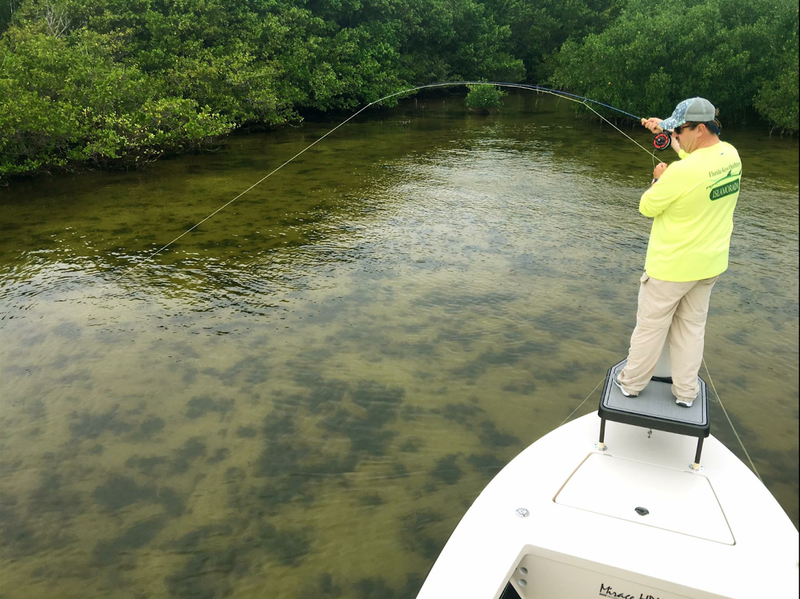 Anglers from all over the U.S. got to experience some very good sight fishing opportunities that the Space Coast has to offer. 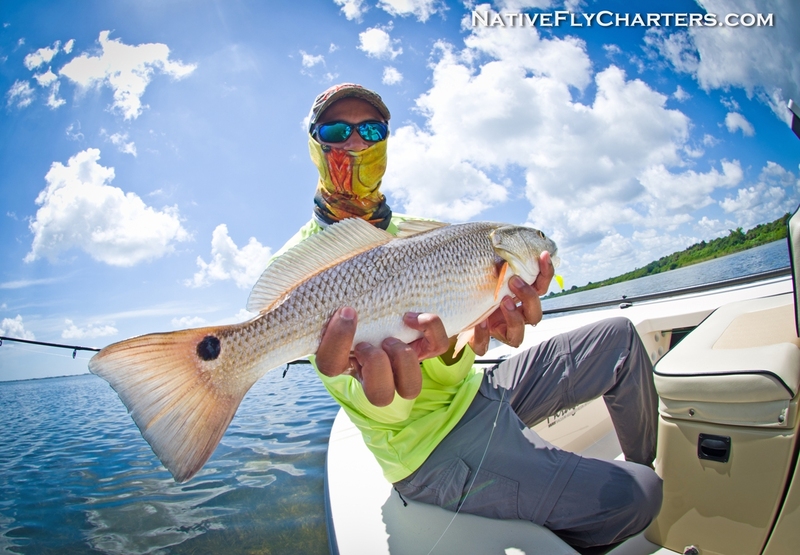 Redfishing has been pretty good in all 3 Lagoons(Mosquito, Indian, and Banana). 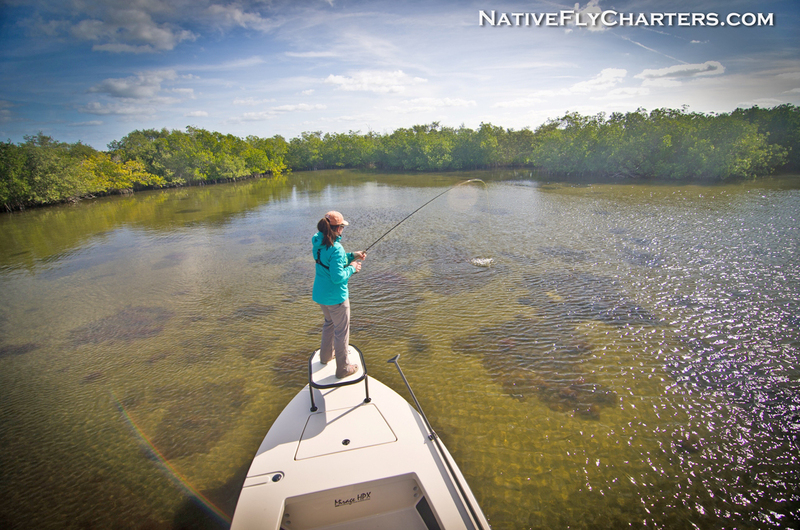 Water has been high so fish can be found way in the back bays, and tight to the mangroves. 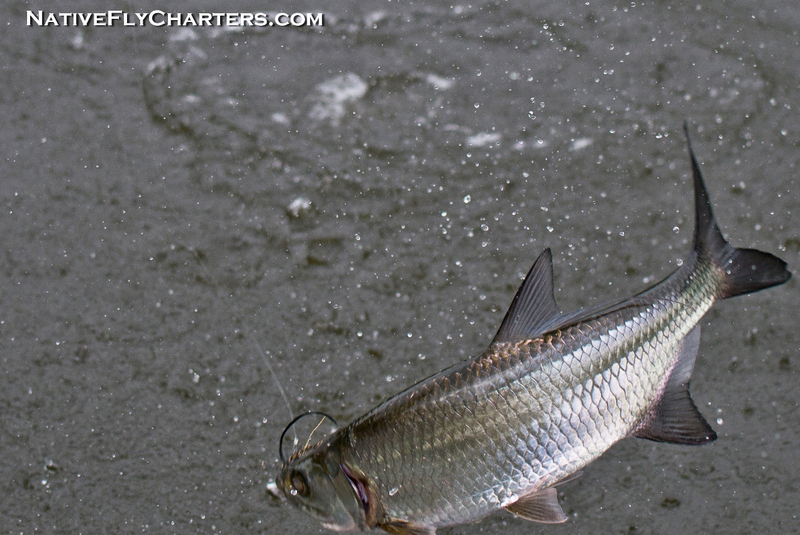 Baitfish patterns have been working well for Reds and Sea Trout in areas where baitfish are present. 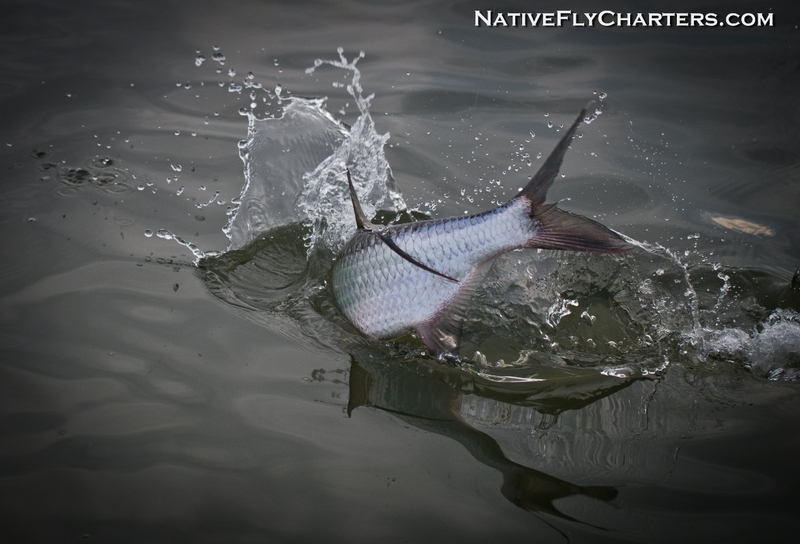 Schools of Tarpon are littered on the flats smashing bait fish and eating well placed flies. 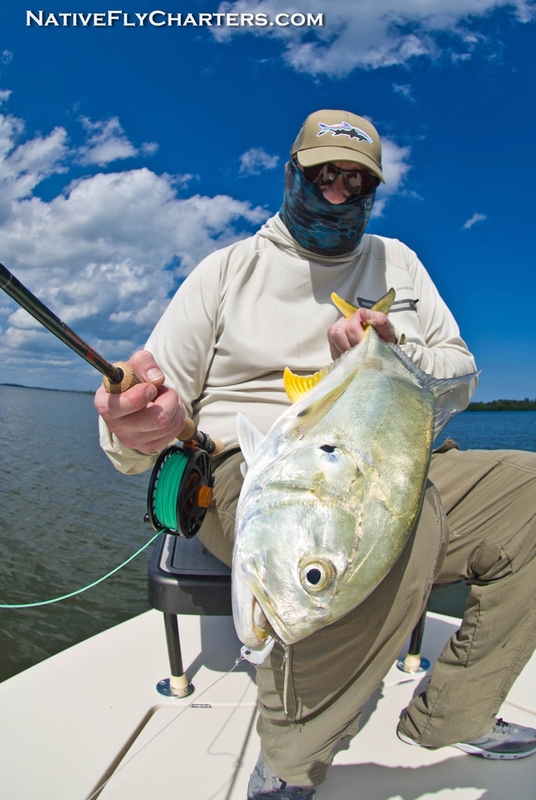 They can be pretty tricky to feed and land on any kind of tackle, but once you have finally landed that one fish…please handle them with care. 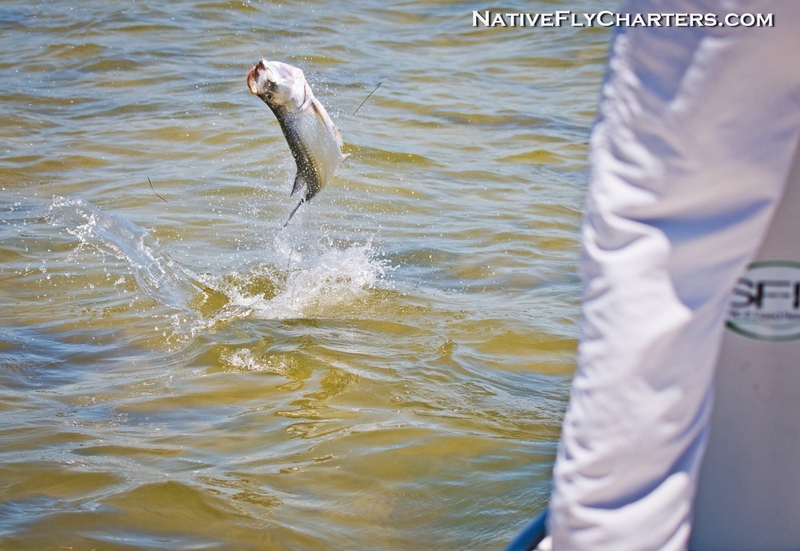 These fish can be extra stressed during the fight by the airshow that they will put on for you. 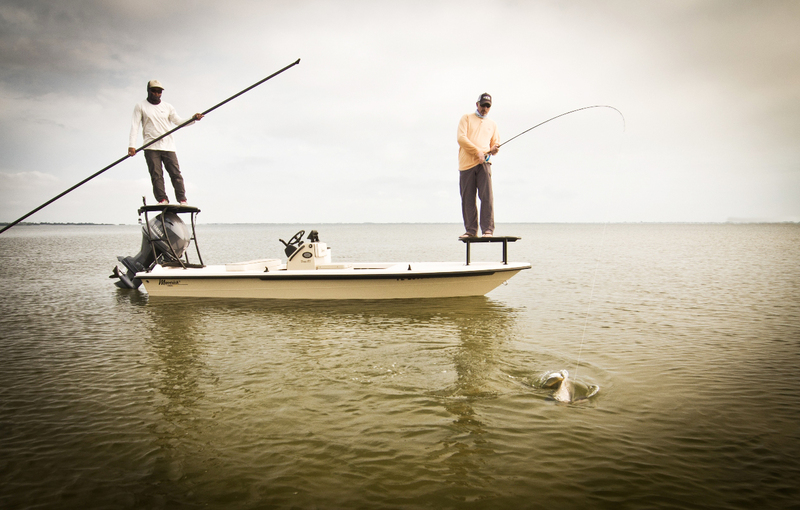 After I get one boat side, I Do Not lift them out of the water. 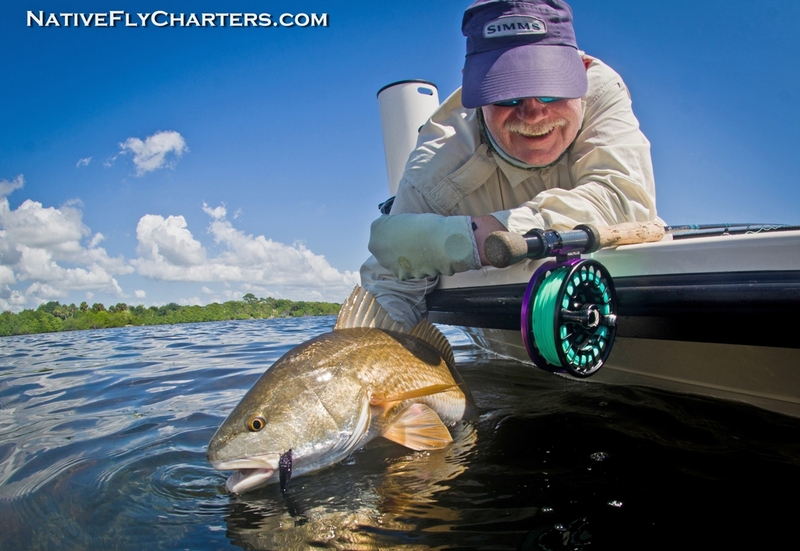 I like to keep them in the water at all times, that goes for any size big or small. A quick photo with a little lift above the water and back in it goes for the revival and release. 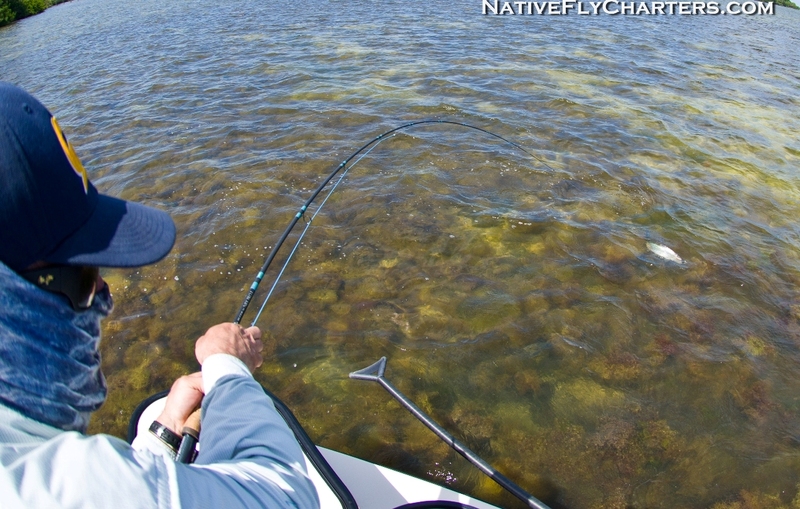 This technique is good because Tarpon are strong and floppy fish, if you lift one in the boat, chances are they will kick out of your hands and flop all over the deck causing more harm to the fish and your boat/equipment. 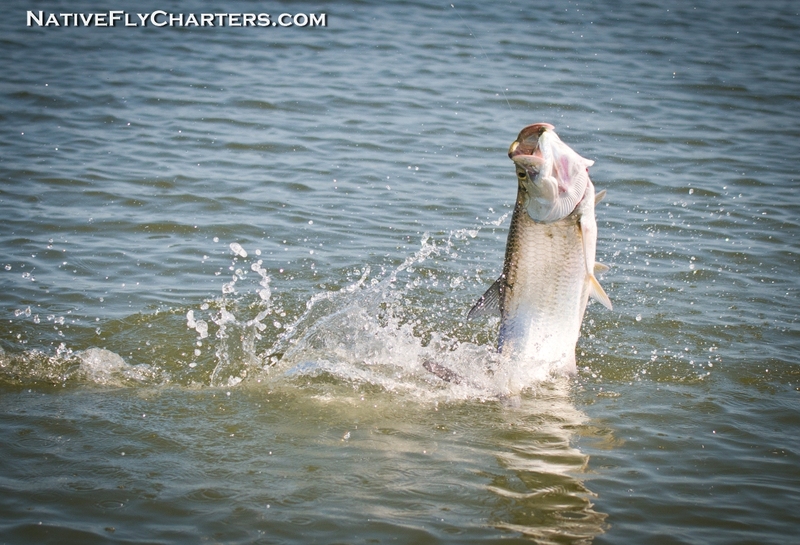 I’ve been seeing way too many photos on social media of mishandled Tarpon being held up that look beat up and missing most of their scales, which most likely didn’t make it. 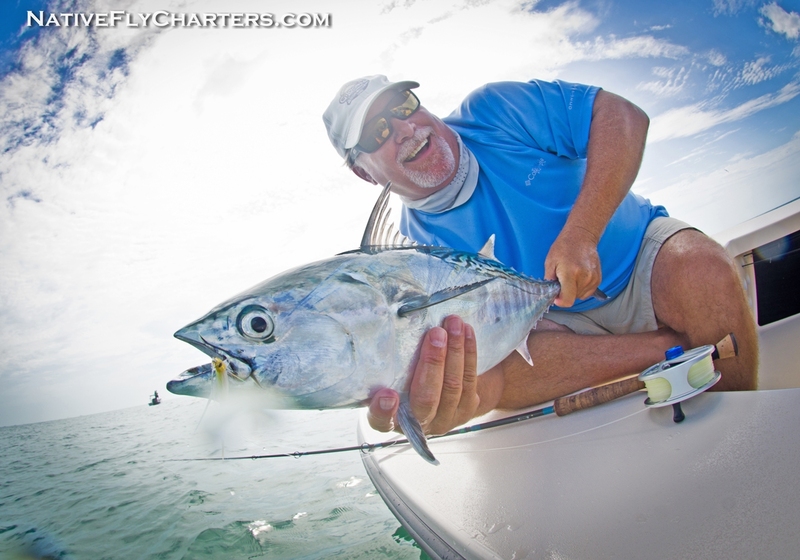 That goes for all fish I plan to release, handle them as if they were one of your babies so they can live on to give you another air show in the future. 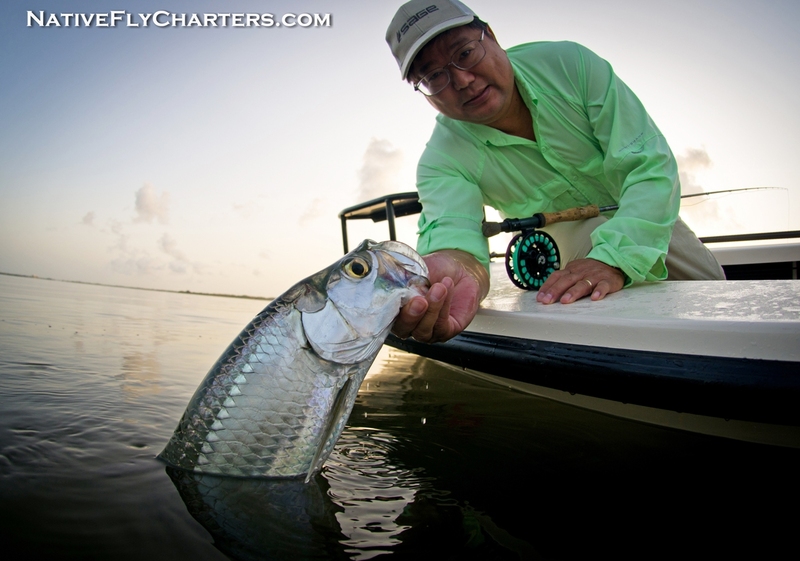 Tim from Texas had some fun sight fishing little tarpon on the flats. 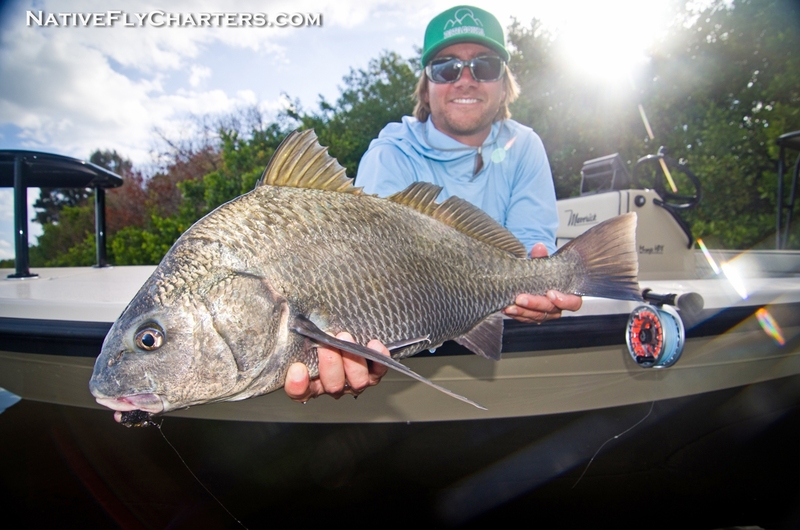 Steele from Longwood, FL. 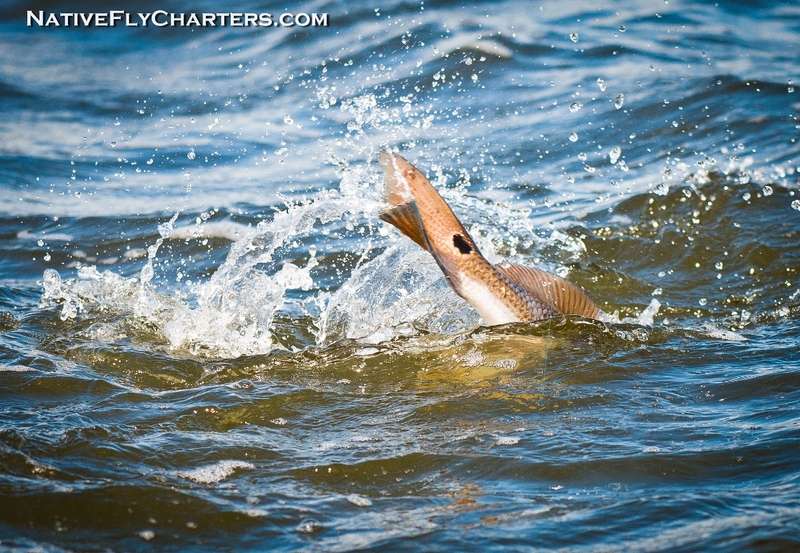 feeding Redfish D.O.A. 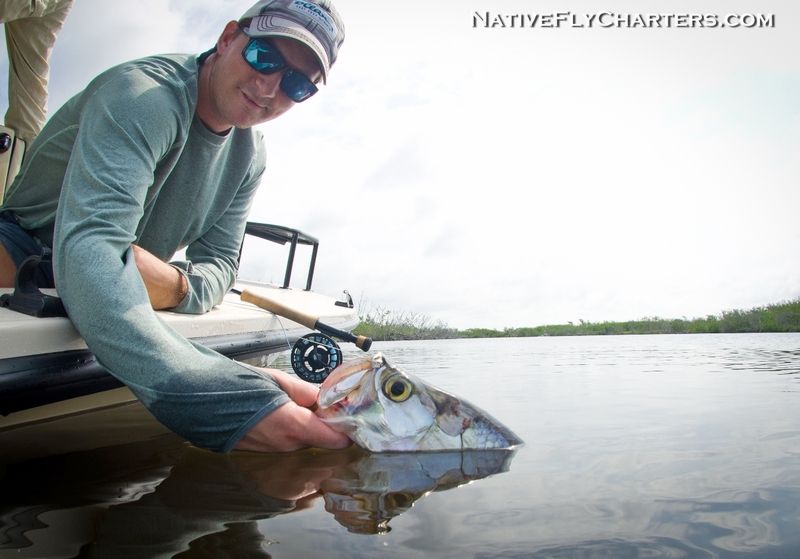 3″ Shadtails in the Mosquito Lagoon on a 4 hour trip. 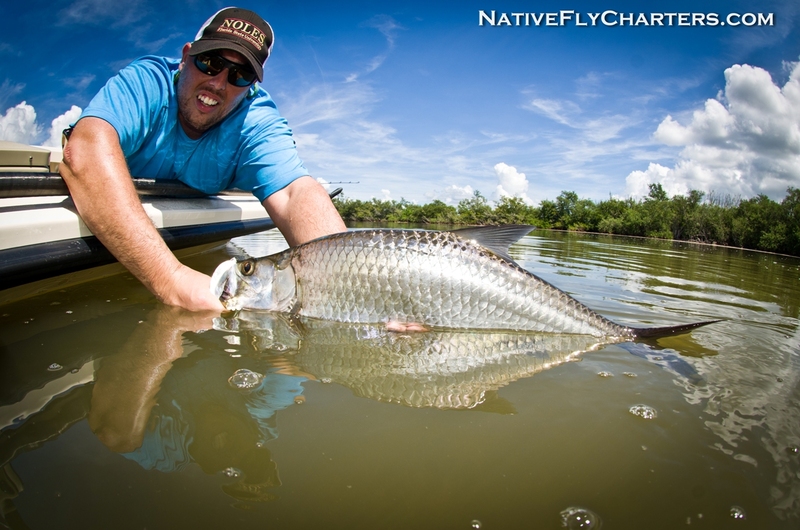 Brandon from Texas managed to feed a handful of Tarpon laid up and cruising in schools. Chip from Vero Beach, FL. got some eats and some jumps but none came to the boat. It was one of the slower and windier days so it was tough. Chip and Jason from Orlando, FL. 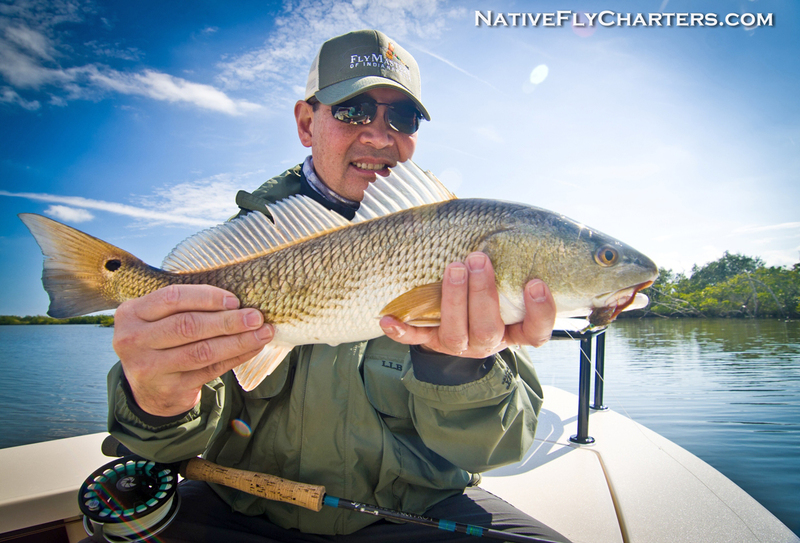 had some fun with redfish on D.O.A. 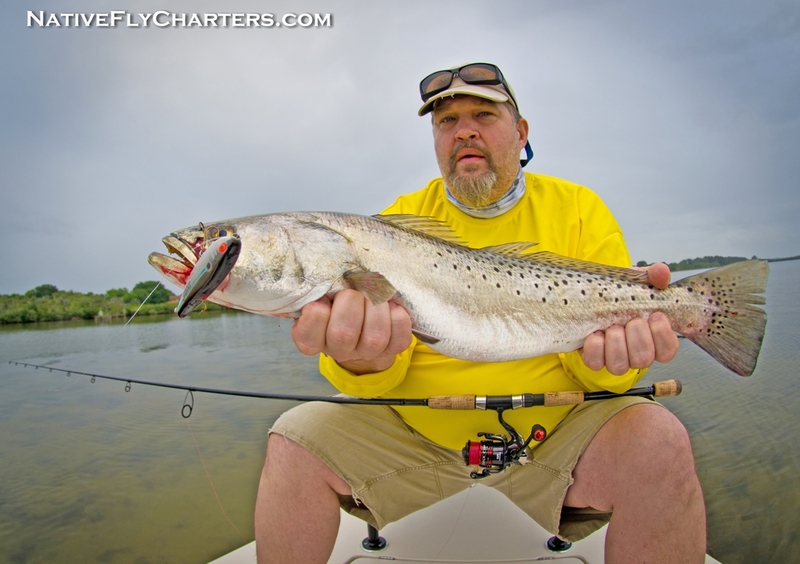 3″ Shadtails, Sea Trout on Topwater lures along with big lady fish and Jacks keeping the rods bent and topwater action exciting. 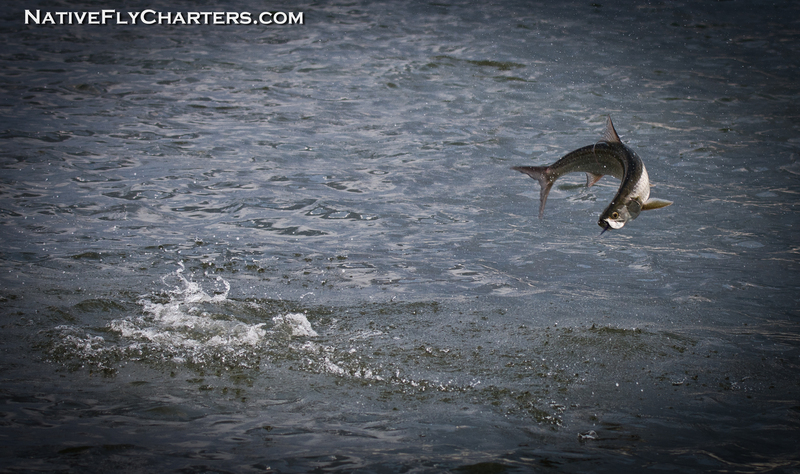 Mike and Mark from South Carolina experienced some schools of tarpon surrounding the boat but were being pretty picky. 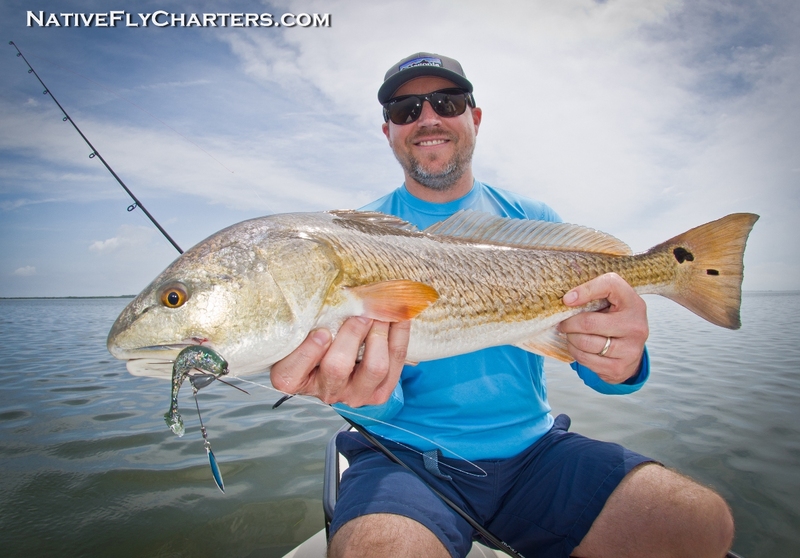 There were a few hungry ones along with a hungry redfish. 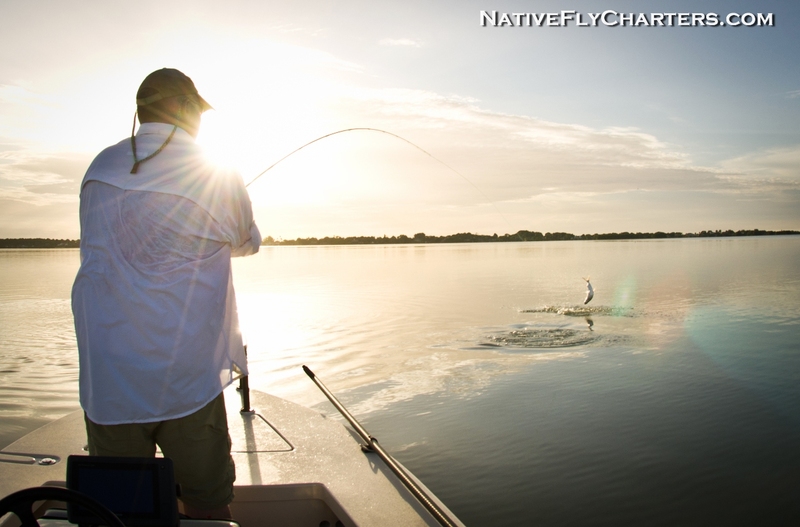 Thanks for reading the Native Fly blog, stay tuned for next months entry. The month of April really felt like June with nice calm westerly winds in the morning and a easterly sea breeze in the afternoon. 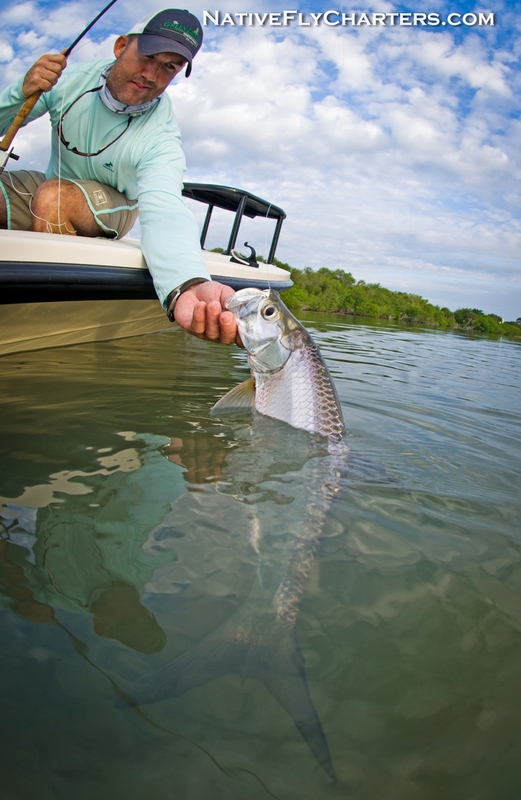 Seasonal fish seem to think the same, like Tarpon for instance. They have been showing up a little early this year in some areas in the back country where they don’t normally show until early Summer. 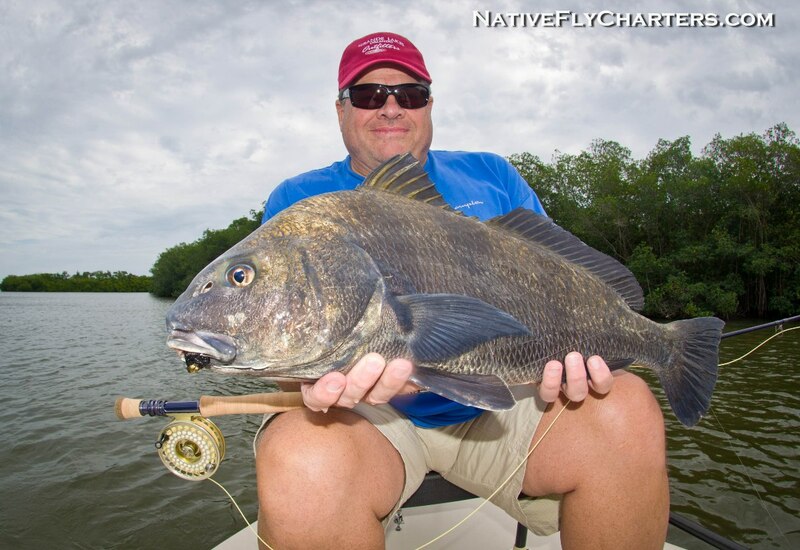 These are the smaller fish ranging anywhere from 10-30lbs. 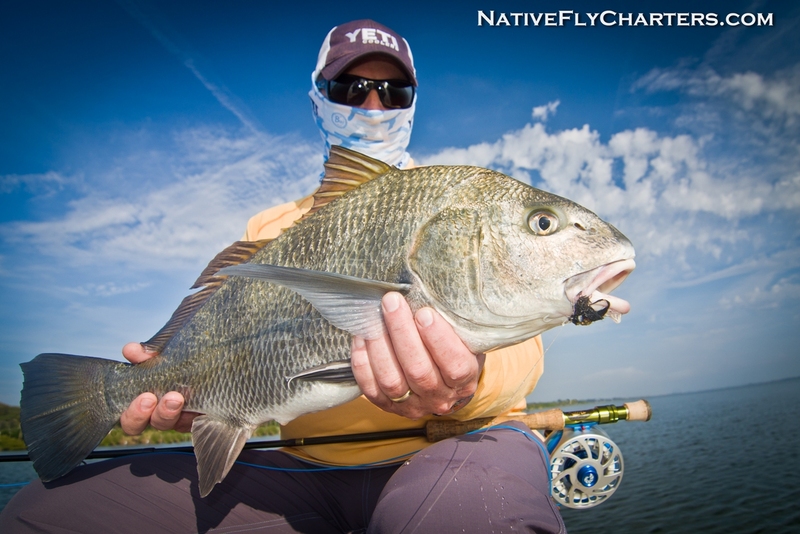 I’ve been finding them in schools cruising the flats or single fish laid up and they have been eating flies very well. 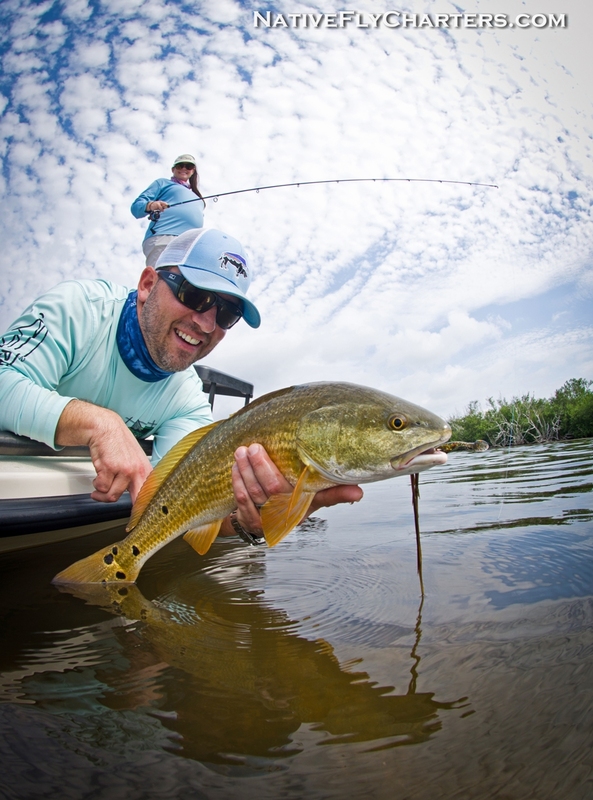 Redfish has been hit or miss, one day we will see a bunch, and the next day only a few which makes it tough for fly fishing. 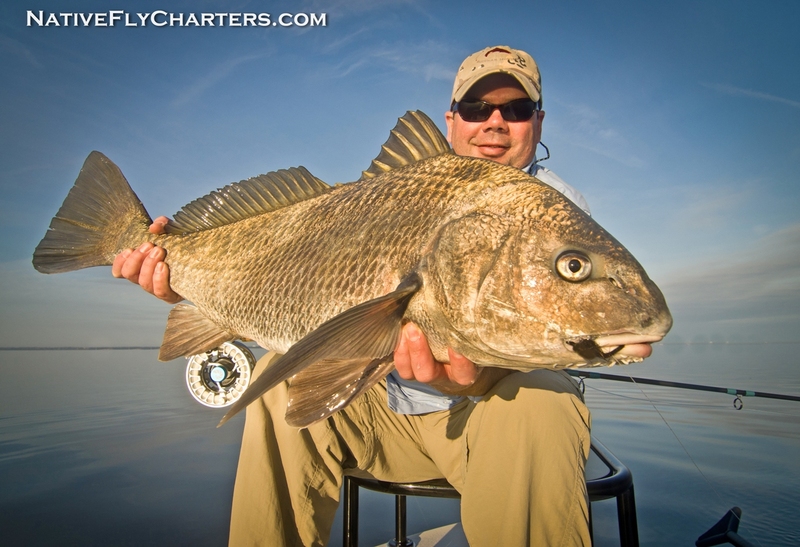 Spin guys can blind cast into fishy areas and catch them regularly. 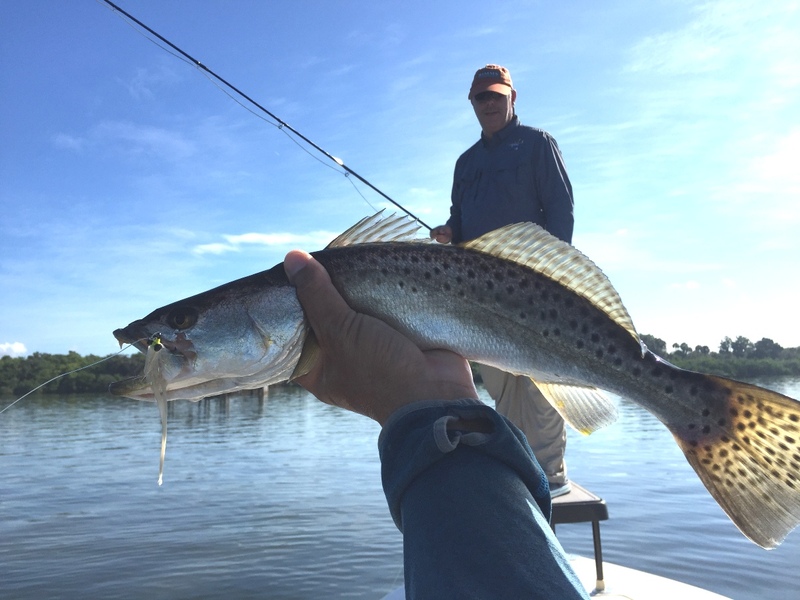 With the massive amount of mullet and glass minnows around in the lagoon systems, big Sea Trout can be found nearby the baitfish. 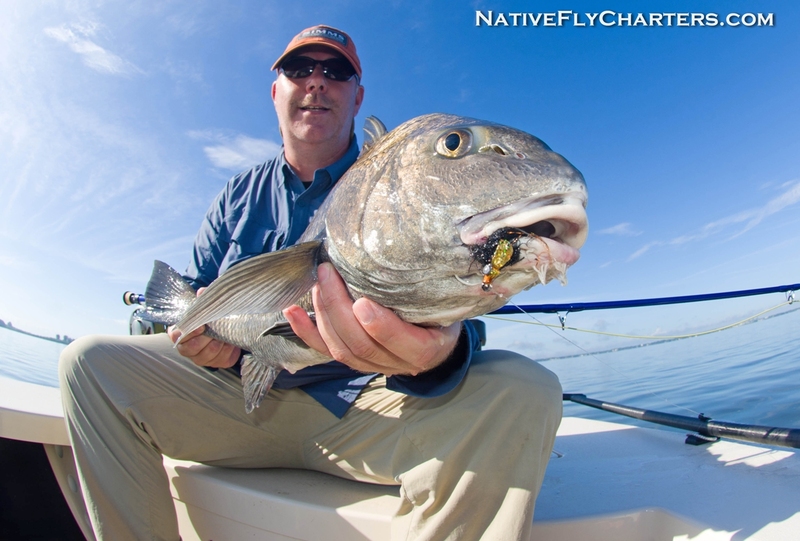 Very tough to sight cast to, but it is possible with a stealthy approach and the right fly/lure. 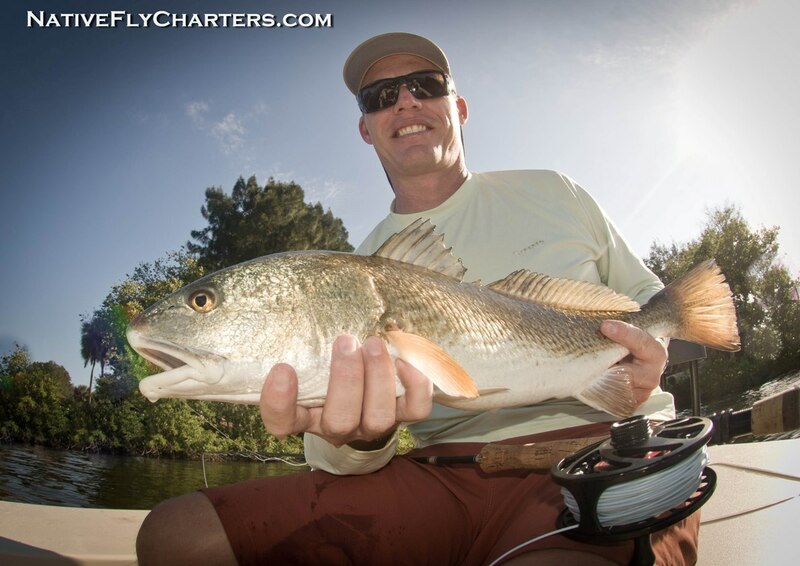 Jon snuck away from the Disney Parks for a day of fishing, he ended up getting slam on fly and spin. 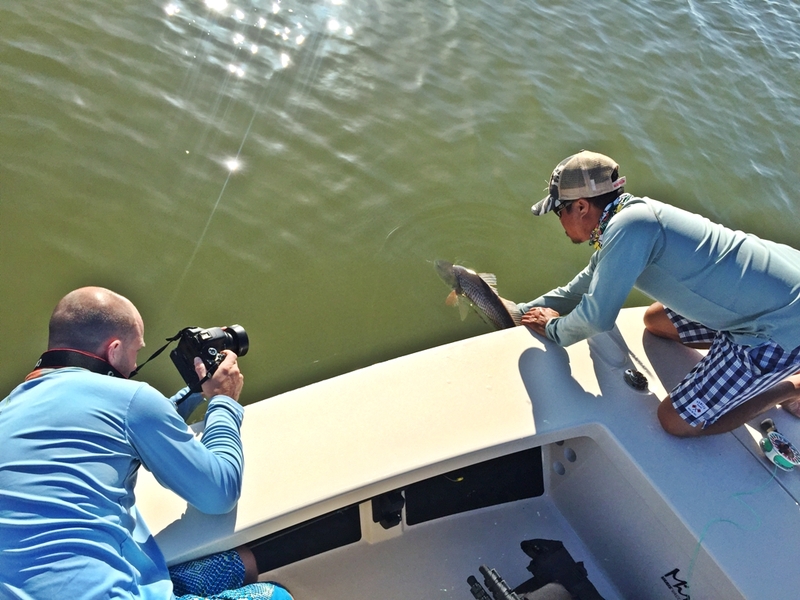 Steven and Steve from Texas got into some good sight fishing action in the Mosquito Lagoon using D.O.A. 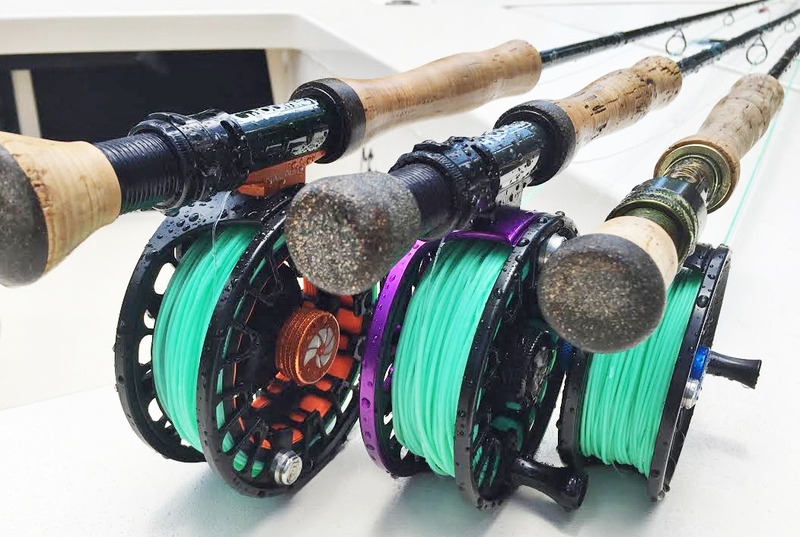 3″ Shadtails. Ashley from Orlando, FL. 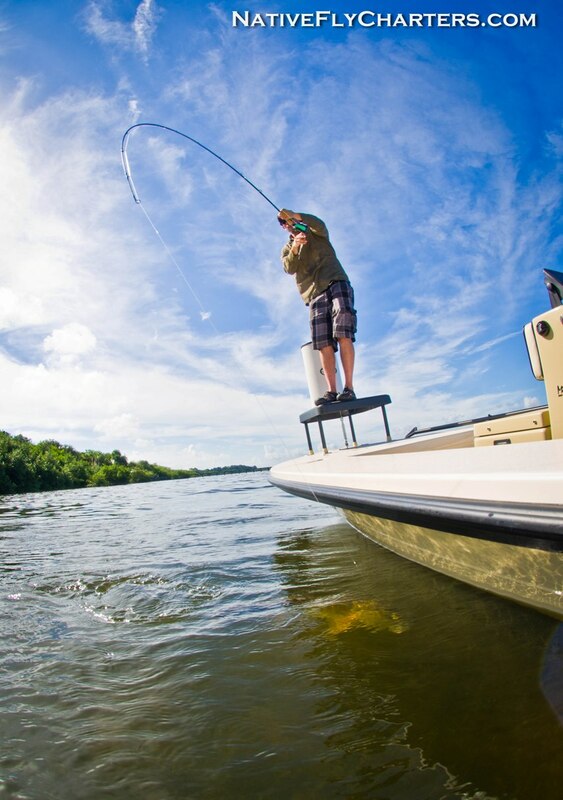 loves to fish. She did not stop casting her D.O.A. Shadtail the entire day! 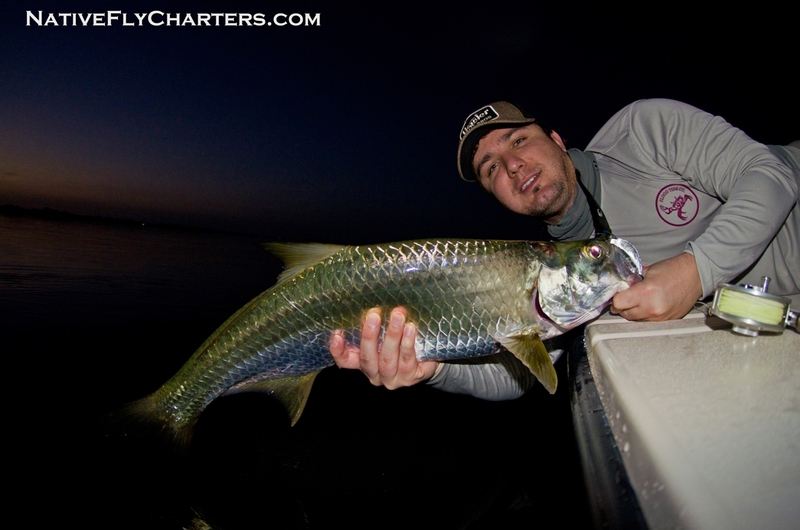 Regular client Brad from Colorado jumped numerous Tarpon in the backcountry ranging from 15-30lbs but could not get one to the boat. 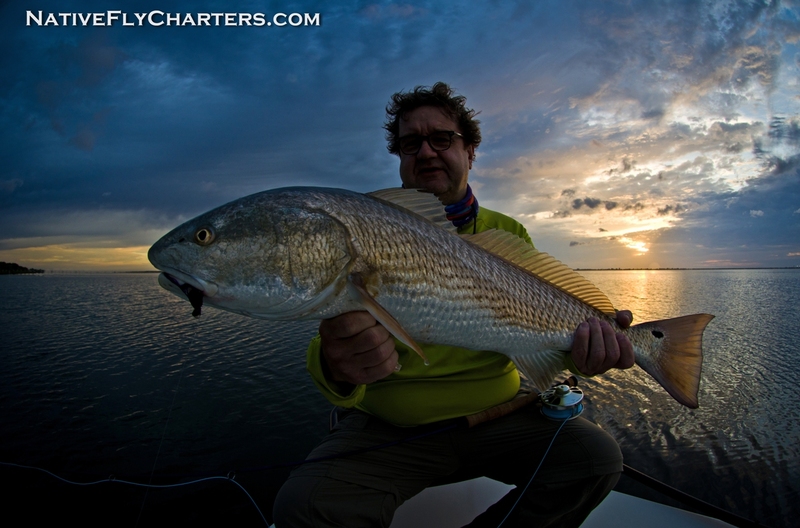 That’s tarpon fishing..but he did land a nice redfish on a 7wt and surface fly while the sun was rising. 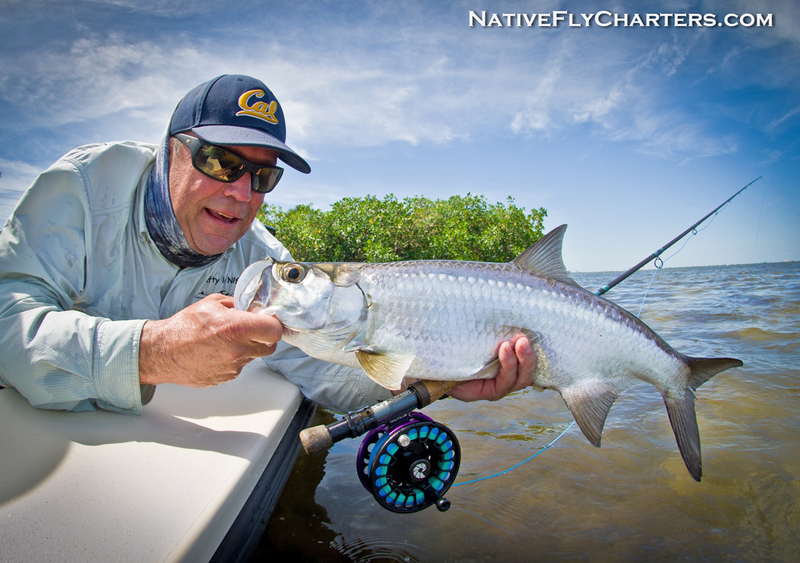 Scott form California had some fun sight casting to small tarpon that were laid up on the flats. Rob and Mike from Orlando, FL. 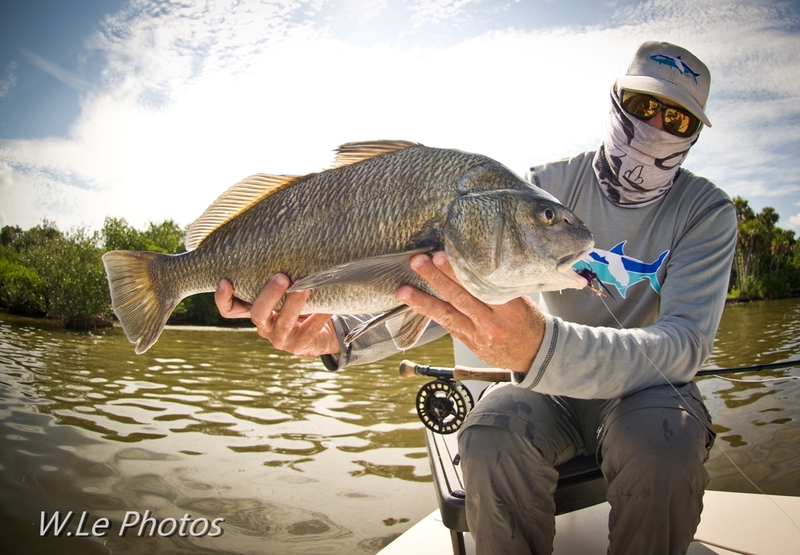 experienced on of the slower days this month, but that didn’t keep them from catching a few. 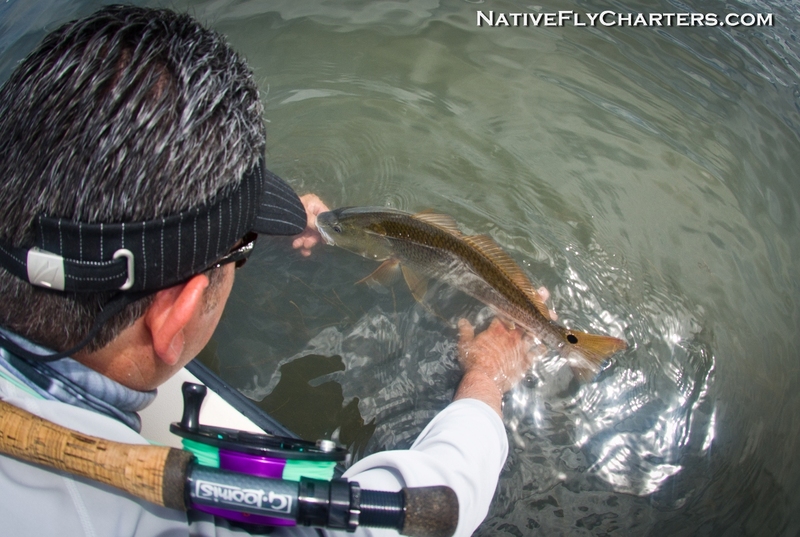 Starting now thru Fall will be a good time to try for a Grand Slam on the fly. 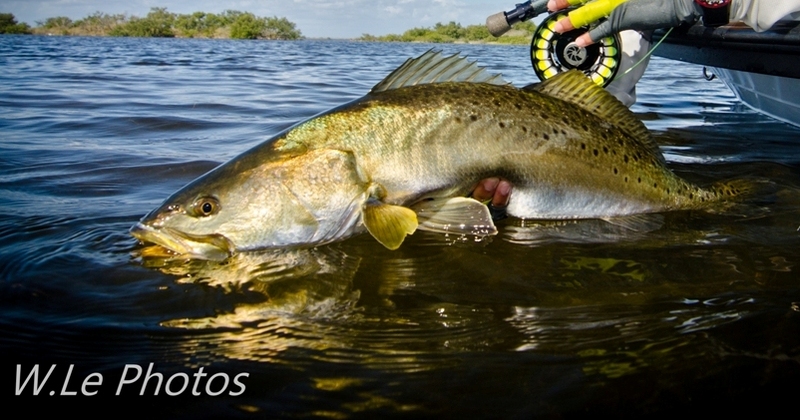 Snook, Tarpon, Redfish, Sea Trout is what you need and from what I’ve seen lately, it is possible. Definitely will not be easy, but possible. Are you up for the challenge? If so, that would make a good little video. 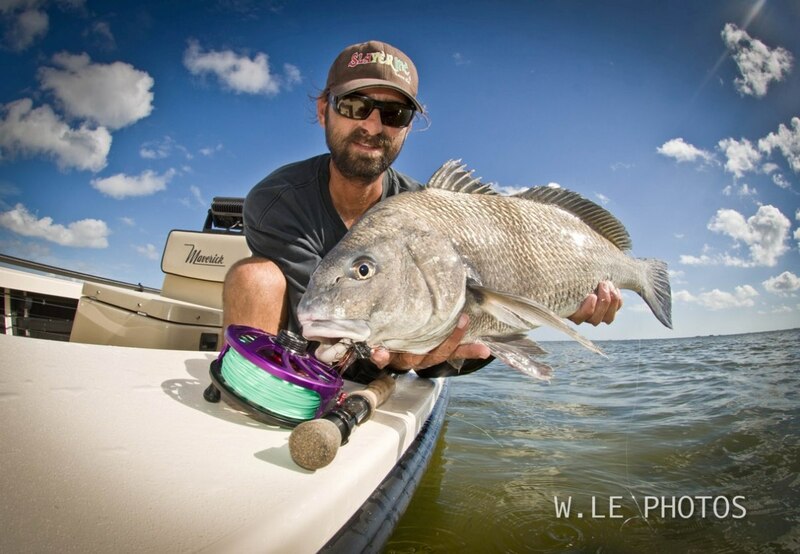 Speaking of videos, this is my latest one about my passion for Black Drum. This is a short film I put together with all the footage of friends and client from this past season. Enjoy! 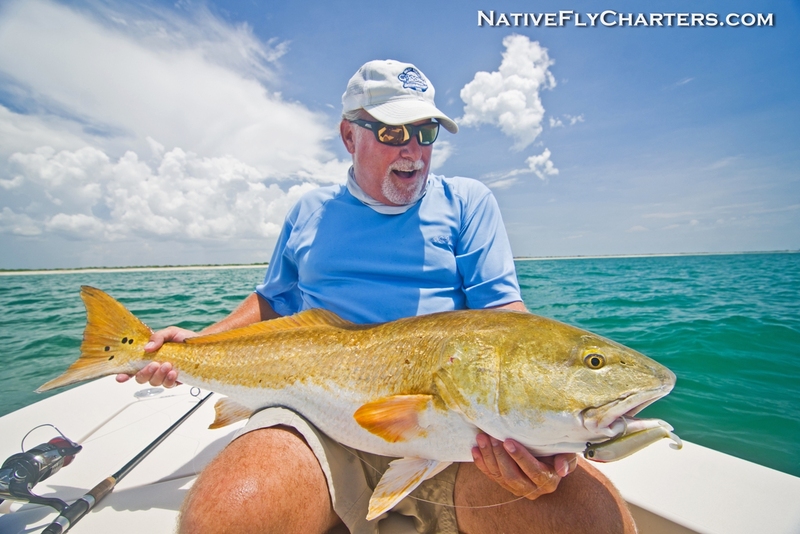 March was a pretty good month of fishing in the Mosquito Lagoon, Indian River, and Banana River….that’s if the winds were lighter than 20mph. The water and air temps have risen up a good amount, almost like as if we never had a Spring and jumped right into Summer. 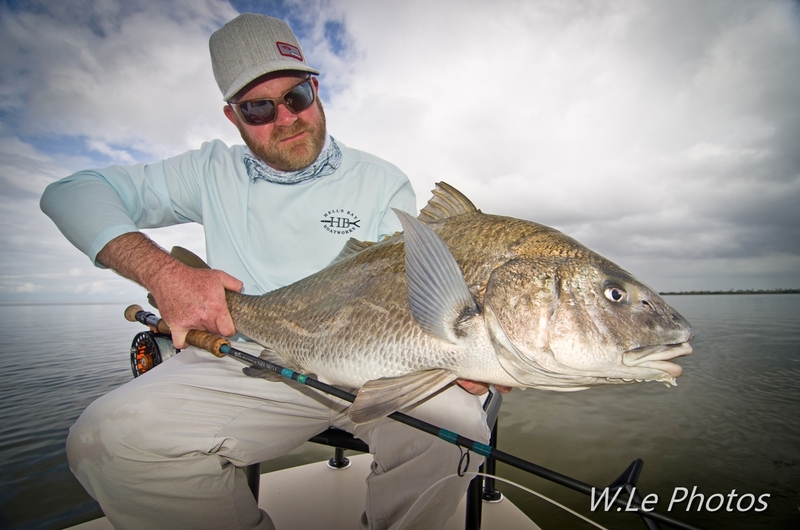 Black Drum were schooled up in big numbers and happily taking flies at the beginning of the month. 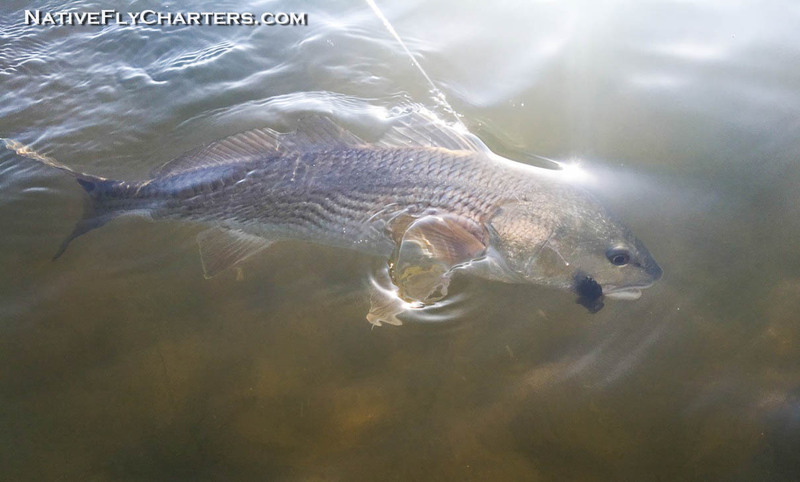 Sea Trout were also schooled up but very alert of their surroundings. 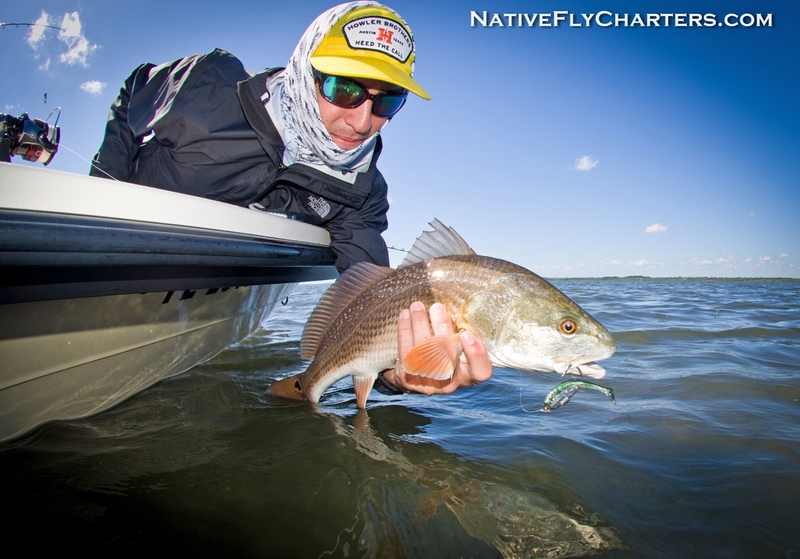 Redfish have been plentiful but it seems like they have gotten a lot smarter this year and can tell what a fake is when you present a fly or lure. Presentations have to be near perfect to get the bite most of the time. 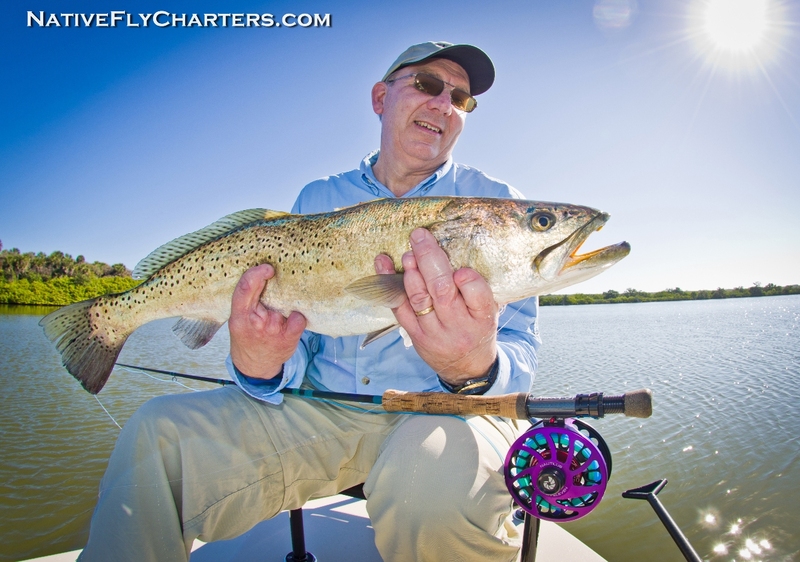 Craig from Chicago was born missing a few fingers, but that does not stop him from fly fishing. 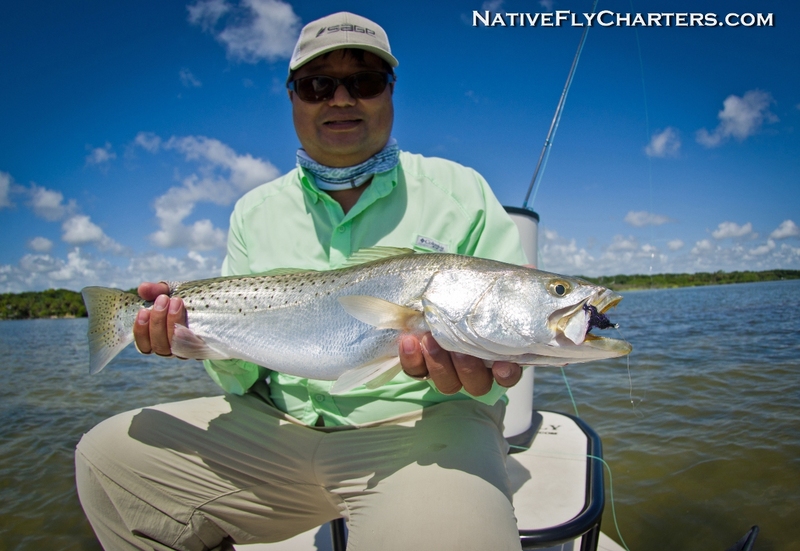 Here’s a nice Sea Trout he got on a 1/2 day trip to the Mosquito Lagoon. 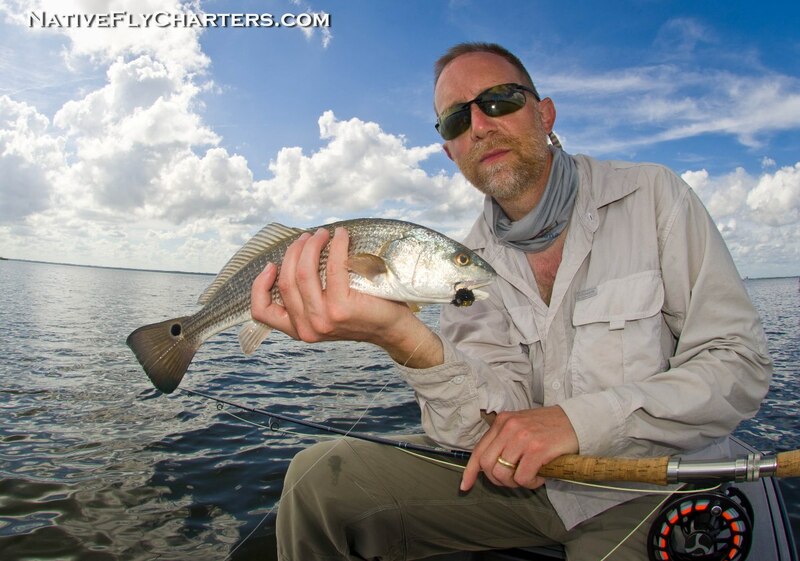 Tim from Panama City, FL. 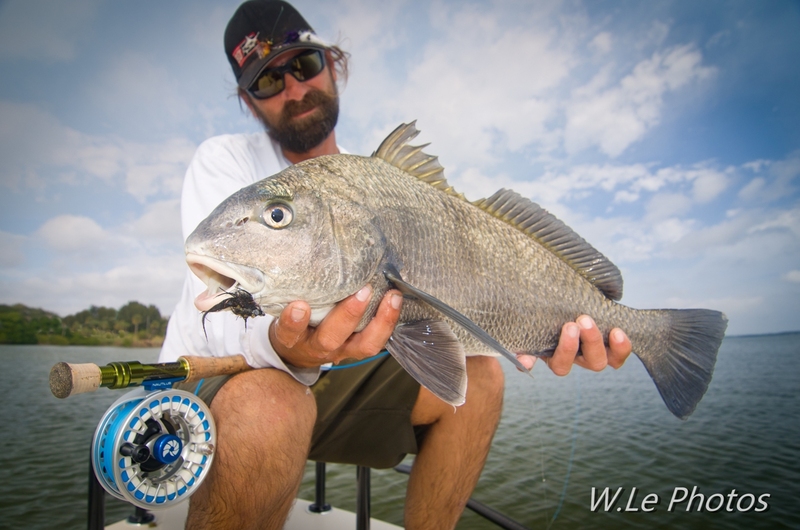 had a great day catching a handful of Black Drum on fly which was his first time targeting them. 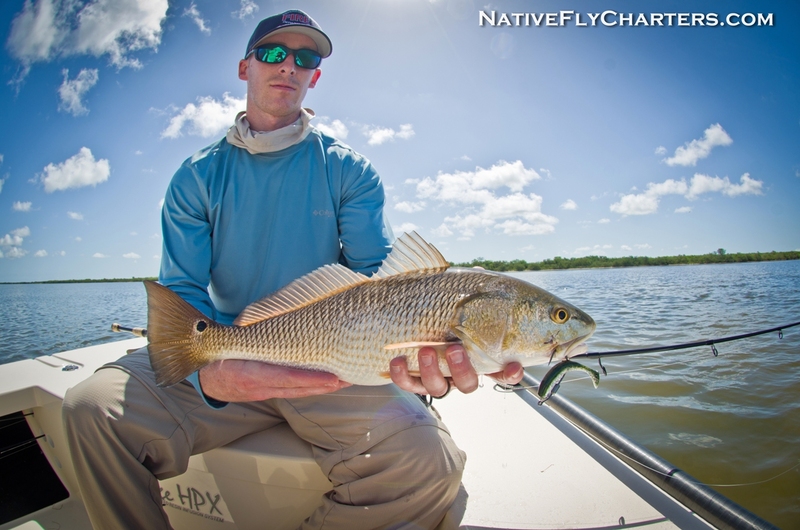 Tyler from Virginia with a Mosquito Lagoon Redfish caught on a 3″ D.O.A. Shadtail. 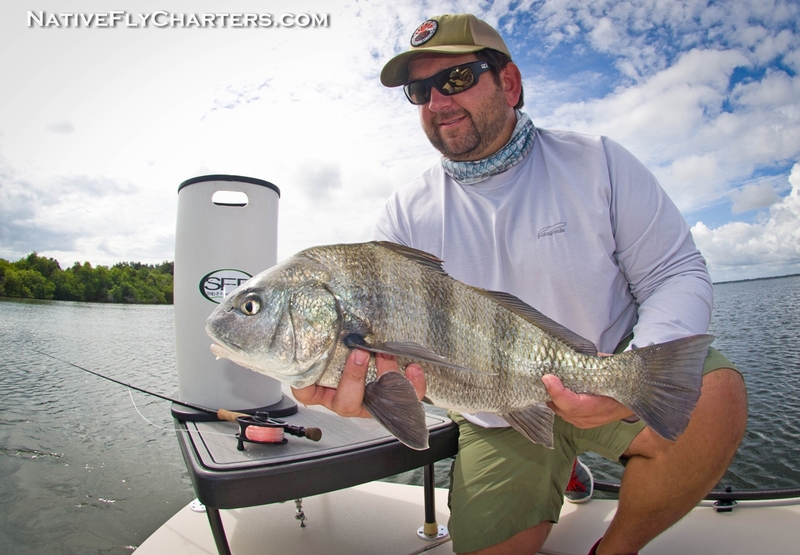 Regular client, Rudy from South Florida made a perfect cast to a small pod of tailing fish which resulted in his first ever Black Drum on fly. 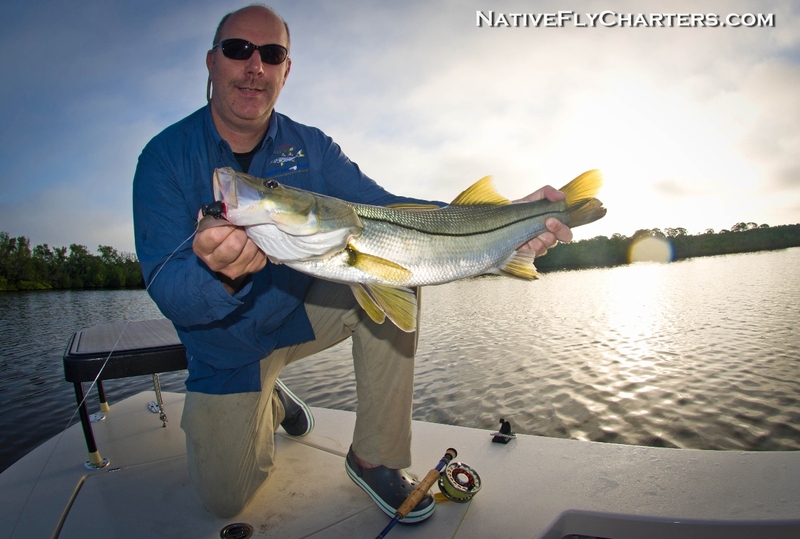 Carlos from S. Carolina with a snook on fly while the Tarpon were not being cooperative. 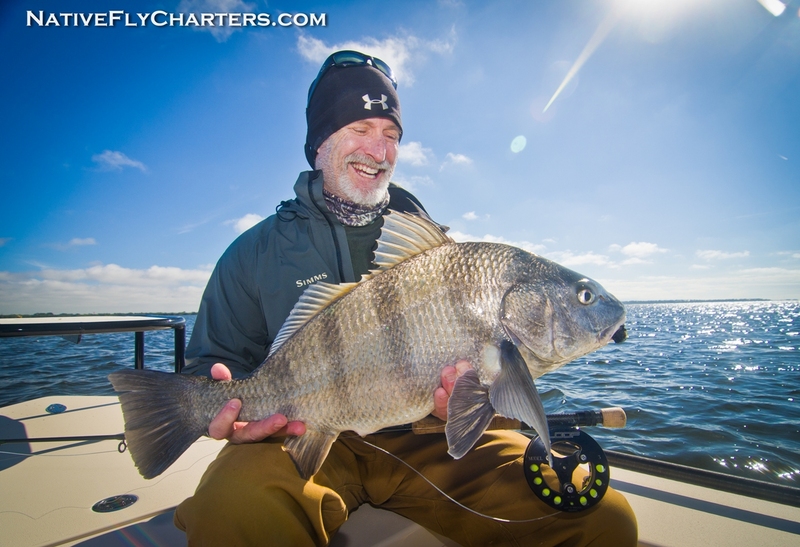 Rob and Norm had some fun times catching Black Drum and Redfish using the D.O.A. 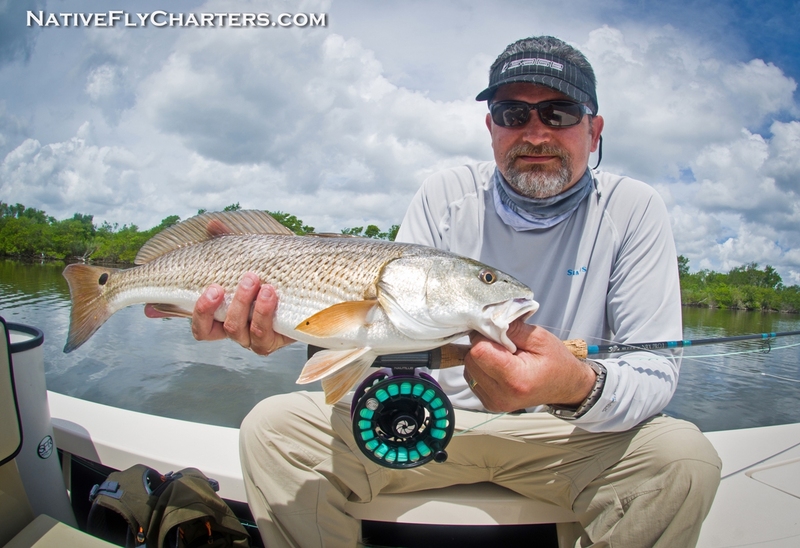 Soft shell crab and 3″ Shadtails. Greetings everyone! 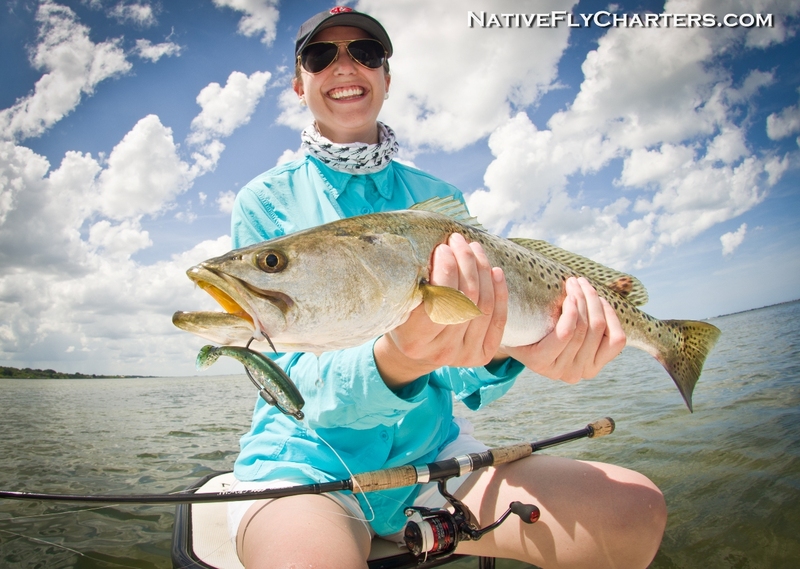 Welcome to Native Fly’s monthly blog/fishing report. This month has been very funky with weather. One day it’s 50 degrees for a high and the next is in the 80’s, add some howling winds blasting at 25mph during and after fronts and you have typical Florida Winters. 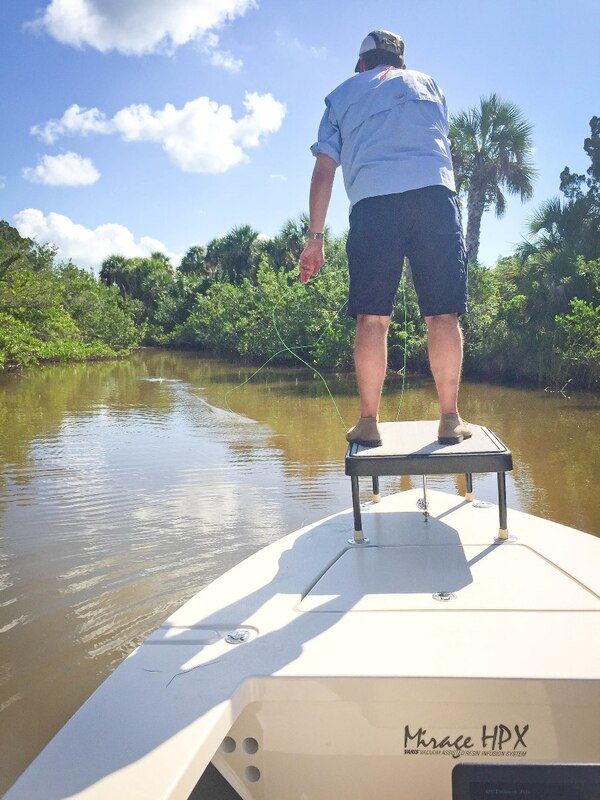 Some days I’ve been lucky to have great weather while on the water, and some days I have no choice but the get out and brave the winds looking for protected areas in order for customers to be able to cast a fly rod. 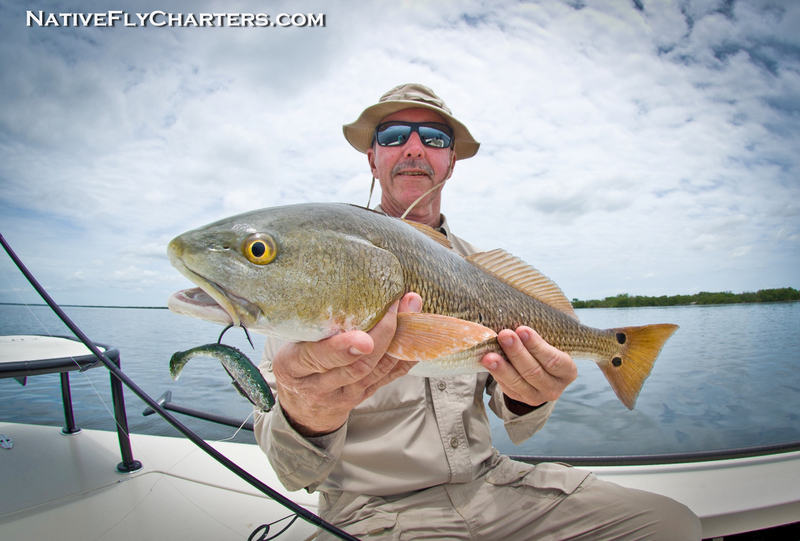 Finding fish has not been a problem in all 3 Lagoon systems(Banana River, Indian River, Mosquito Lagoon). 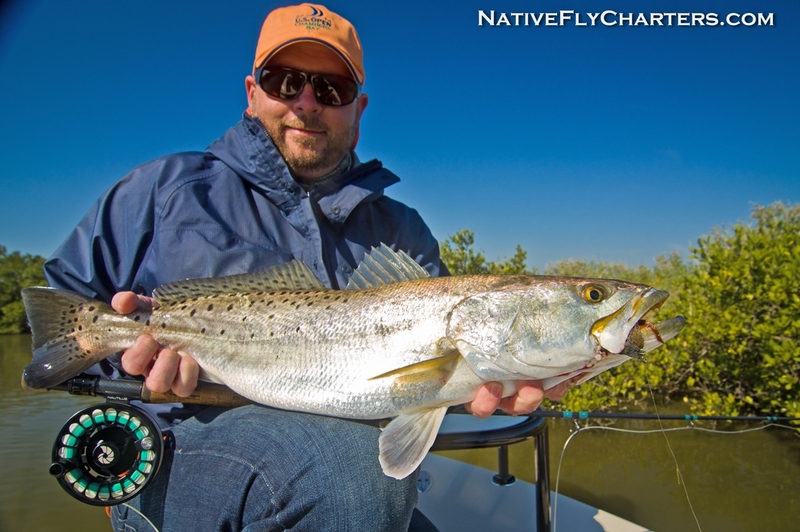 North winds and cooler temps this month have cleaned up the water quite a bit making it top notch for sight fishing. 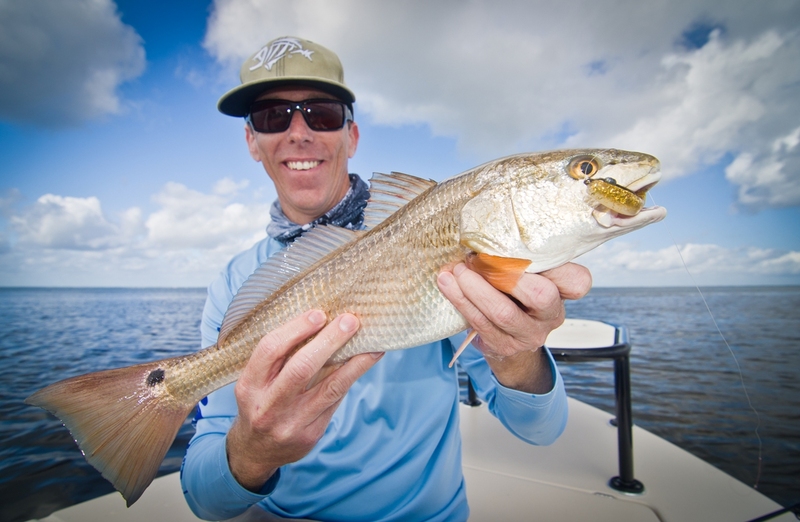 I’ve been seeing a lot of Sea Trout ranging from 20″-30″+ in shallow water, a few schools of Redfish, and a good number of Black Drum. 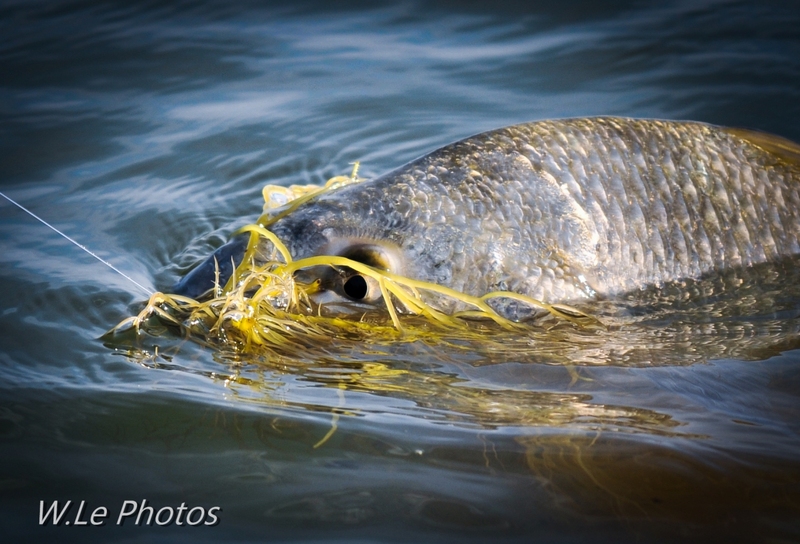 Although there are plenty of fish to be found, they can be extremely spooky and picky eaters. 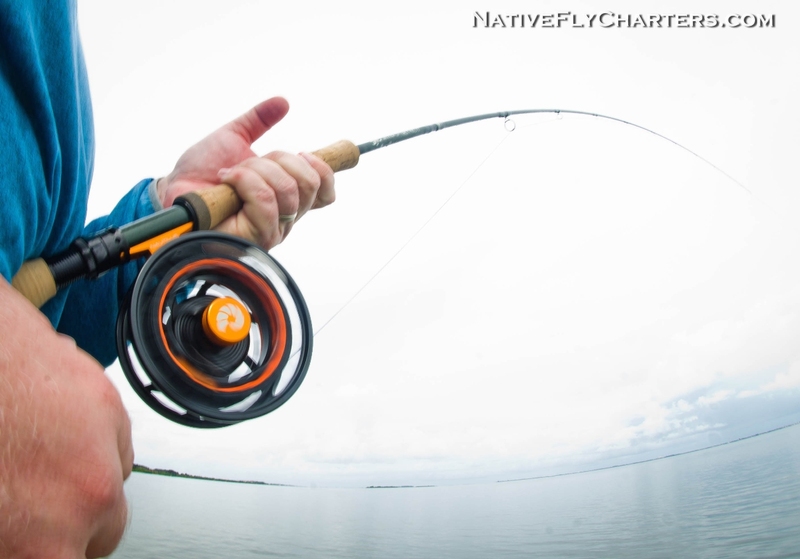 I’ve scaled down to 10lb test tippet at times and also scaled the size of the flies in order to present it to laid up fish without them taking off in the other direction at warp speed. 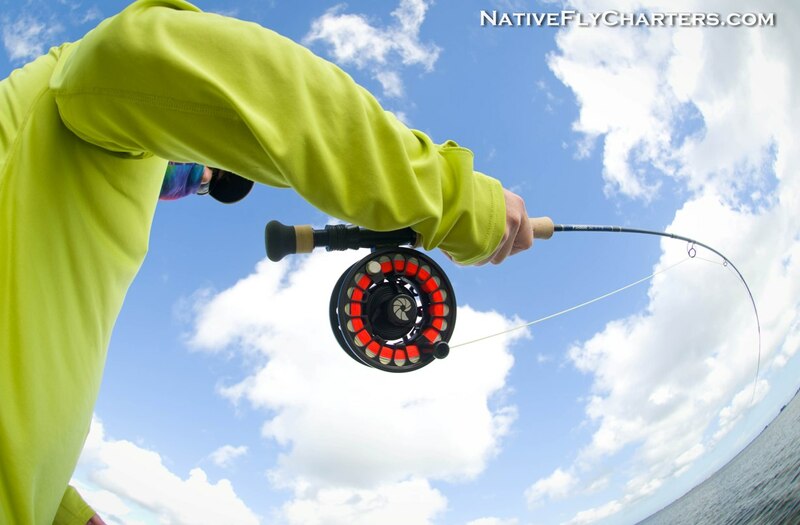 Same goes to spin fishing, increase the length of your fluorocarbon leader, scale it down to 10-15lb test and use small lures in a natural color for better presentation in crystal clear water. This has been a busy month for me with new and repeat customers. 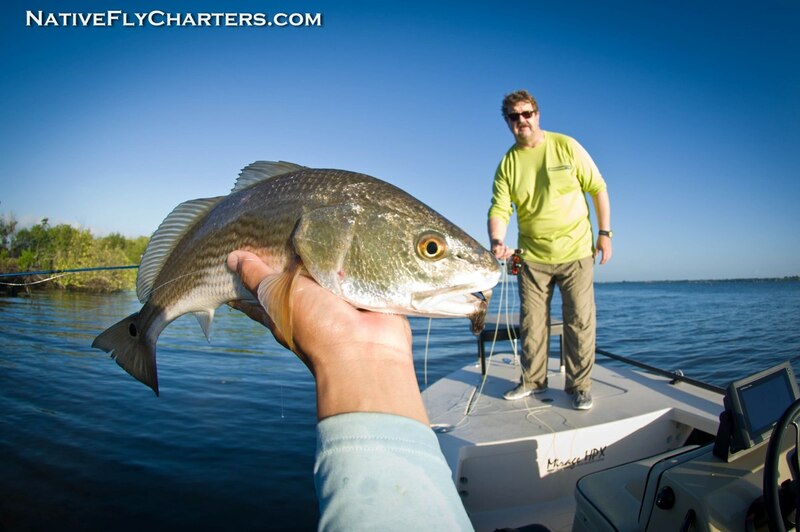 It’s always good to see repeats back on the skiff and see their progress in the sight fishing game. 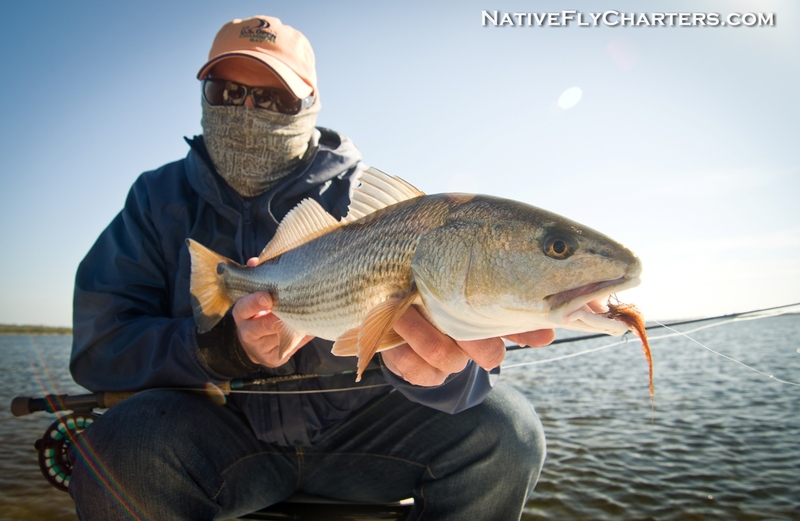 Bud, who is one of my regulars from Georgia joined me on one of the colder days, fish didn’t seem to mind the cold air temps. 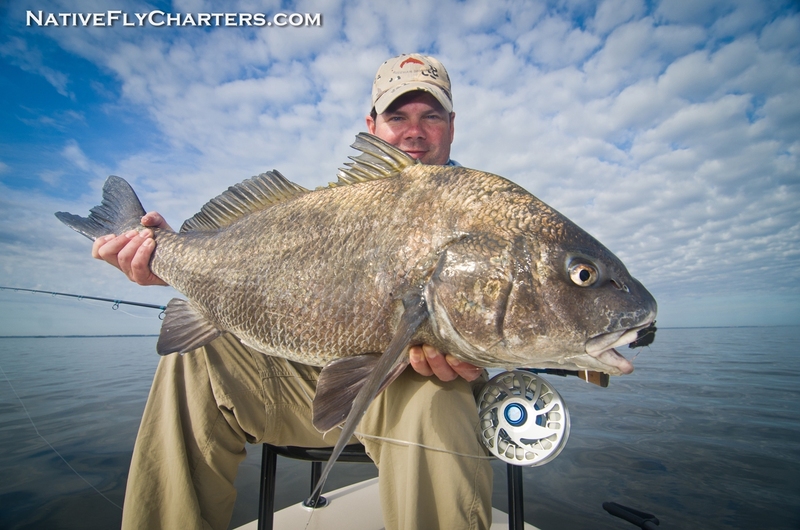 Chad from Ohio had a banner day with me catching 3 very nice sized Black Drum on fly along with a good Sea Trout. 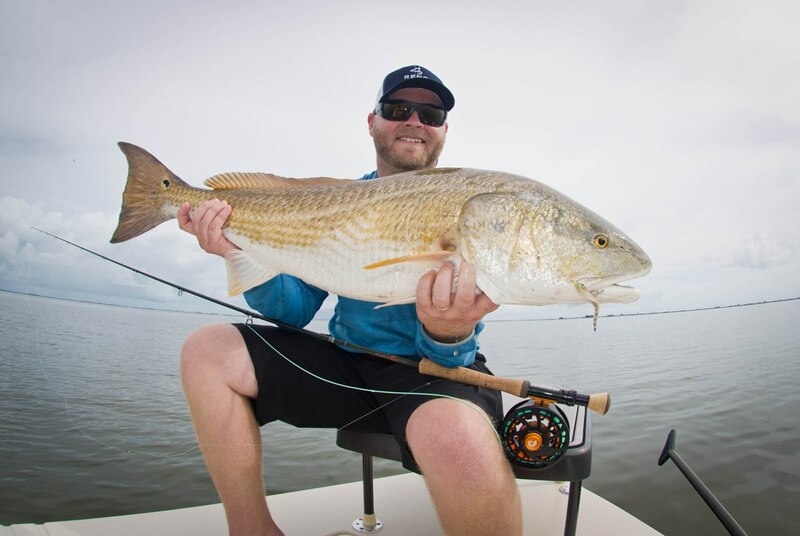 What’s cool about Chad is that he agreed to leave the Drum alone after catching 3. These fish were grouped up and happily tailing, we didn’t want to beat them up all day, instead we left them happy for my guys the next day. 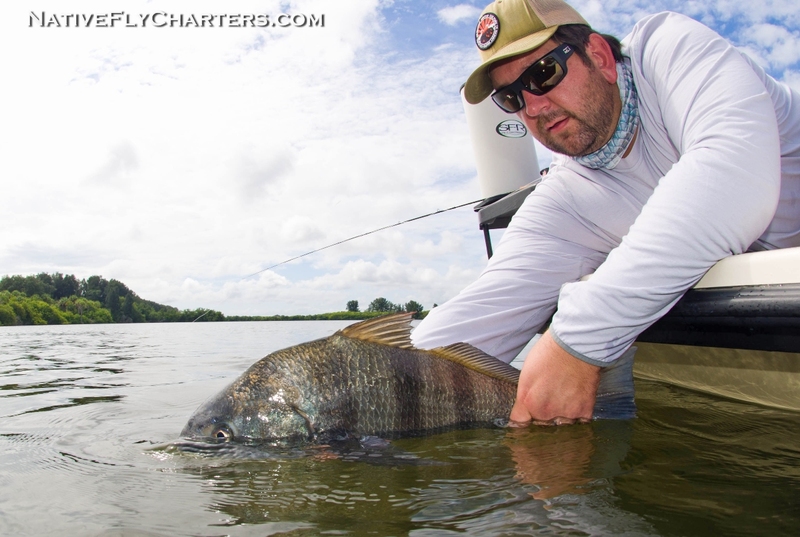 Since we left them alone the day before, the fish were still at the same spot still tailing away for Argentina angler Alejandro. 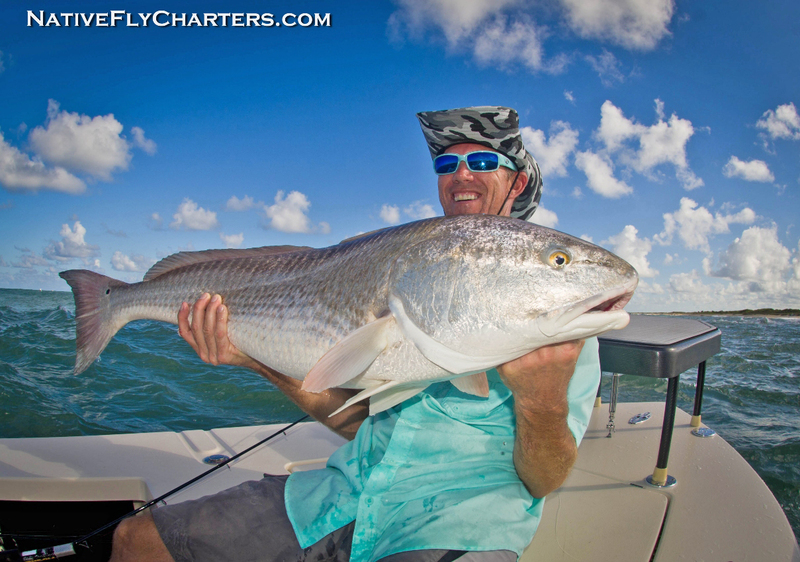 We had enough time to catch 1 before the winds picked up big time and chased us off the water early. 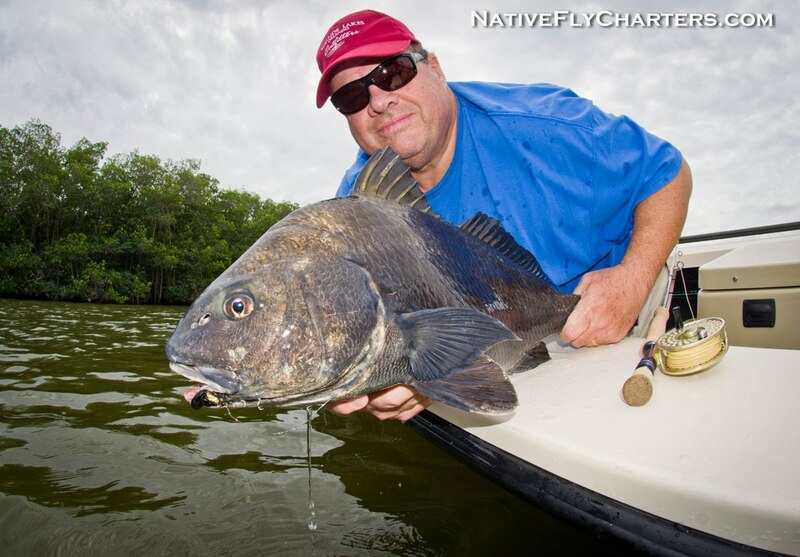 This was Alejandro’s largest fish on fly. Paul from Indiana made it happen this day. 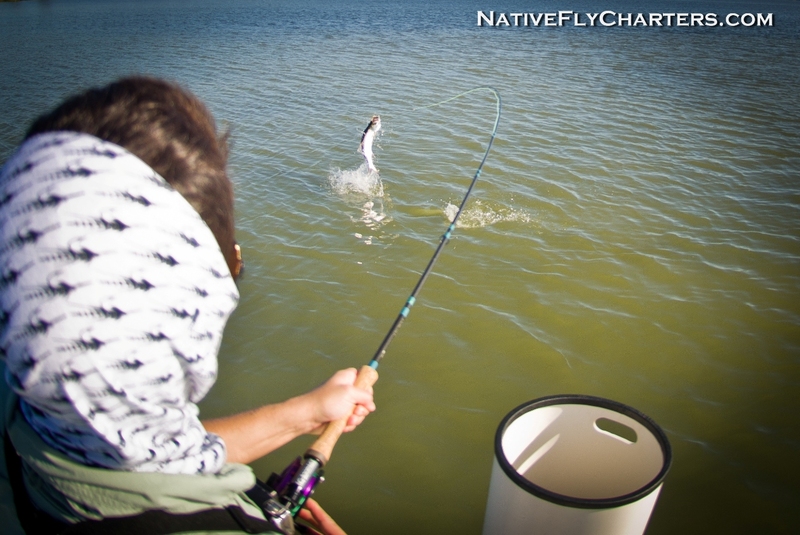 Fish were very spooky, but one fell for the fly. Nicole from Calgary, Canada had a pretty good day. 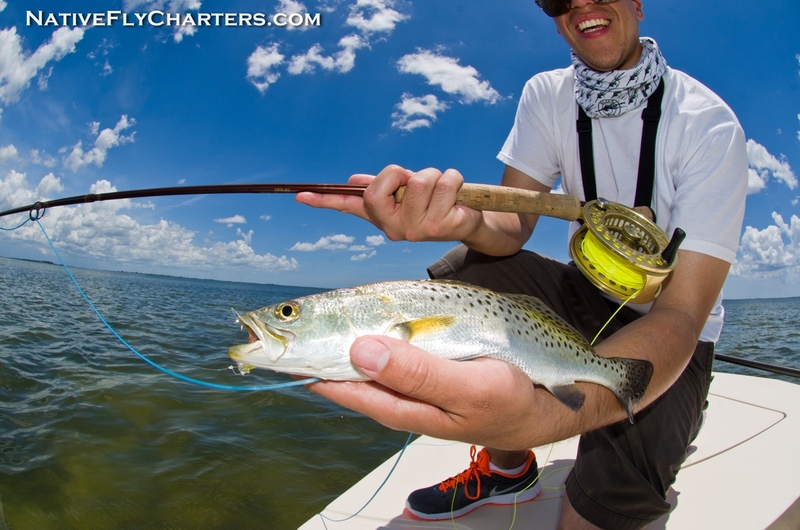 Lots of happy fish in very clear water. Nicole is also a fishing guide up in the Bow River in Calgary. 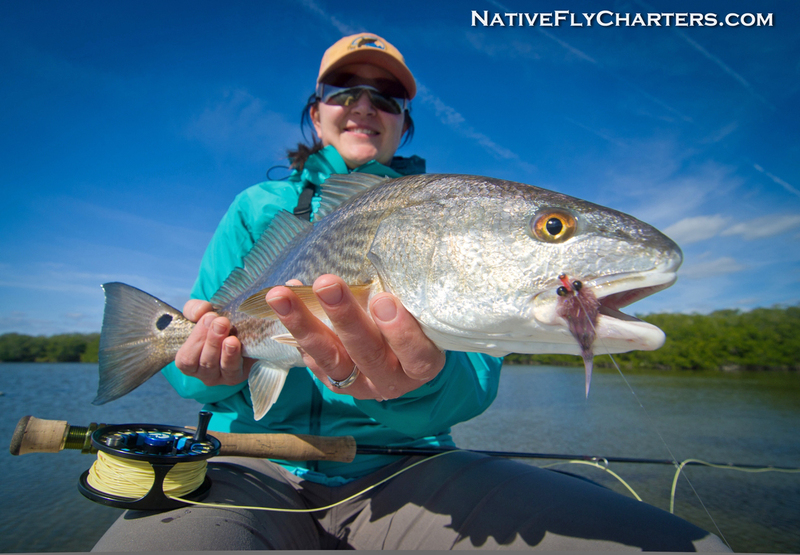 If you are ever up that way and looking to do some fly fishing, her site is: www.castawayfloattrips.com. 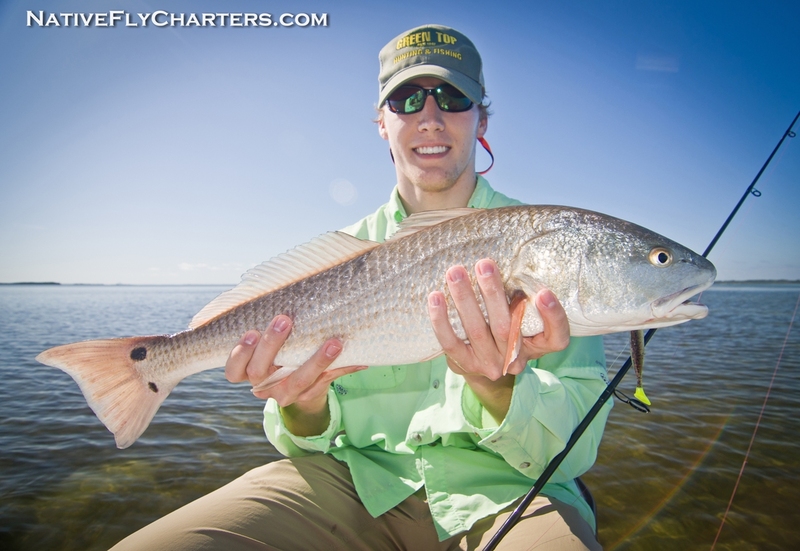 Fishing was really slow for the 1st half of the trip for Josh and Josh from Orlando, FL. but towards the end of the day, they started whacking them on D.O.A. Shadtails. Colder water temps had the bite starting later in the day when the sun warmed things up. 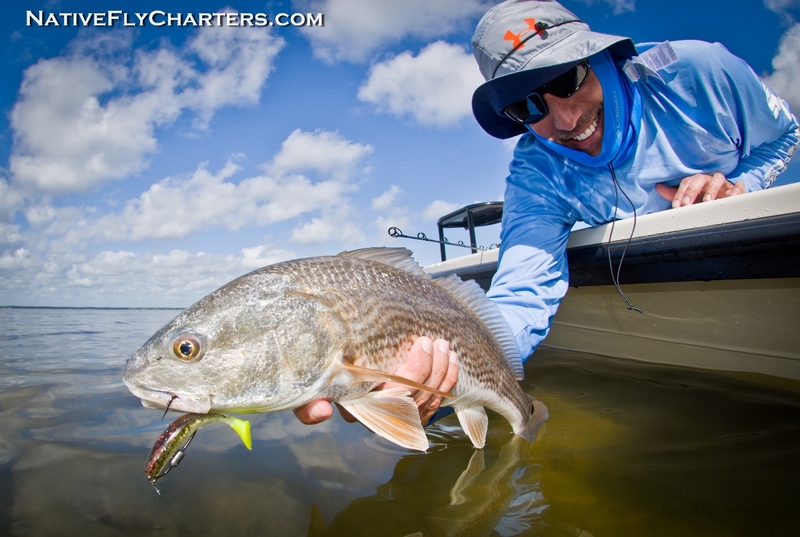 Jason also from Calgary, Canada had to deal with some picky redfish this day. He fed a few but only 1 came boatside. 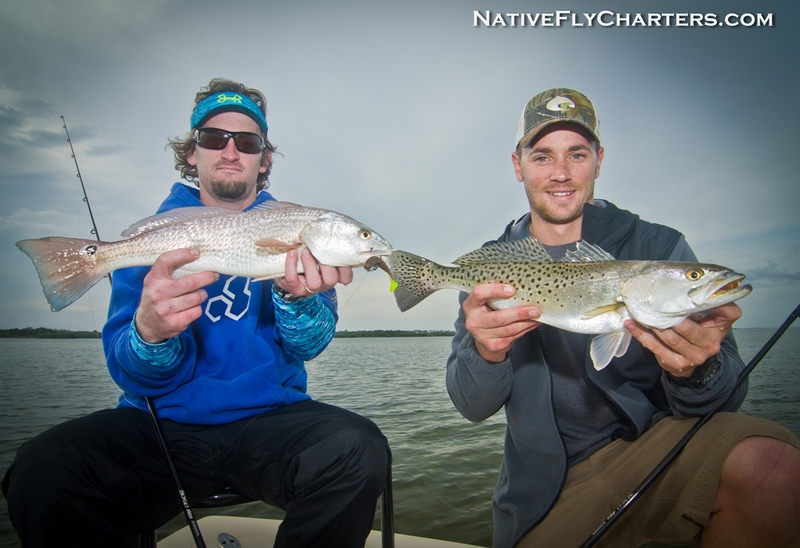 Freshwater anglers Christian and Kevin from Pennsylvania joined me on their first trip in saltwater. They did very well for being the first time. This is a day neither John from Oregon or I will forget. 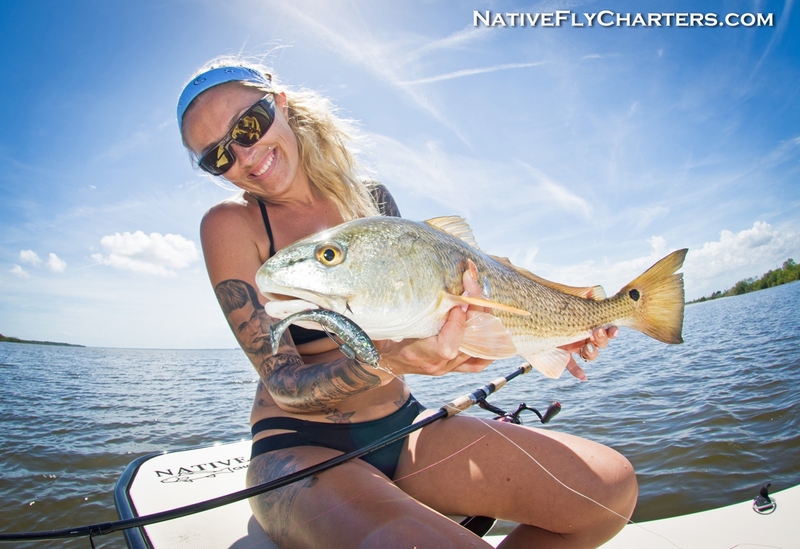 It was the roughest I’ve ever seen the Mosquito Lagoon, some boats could not make it through the channel and had to head back in to the ramp. 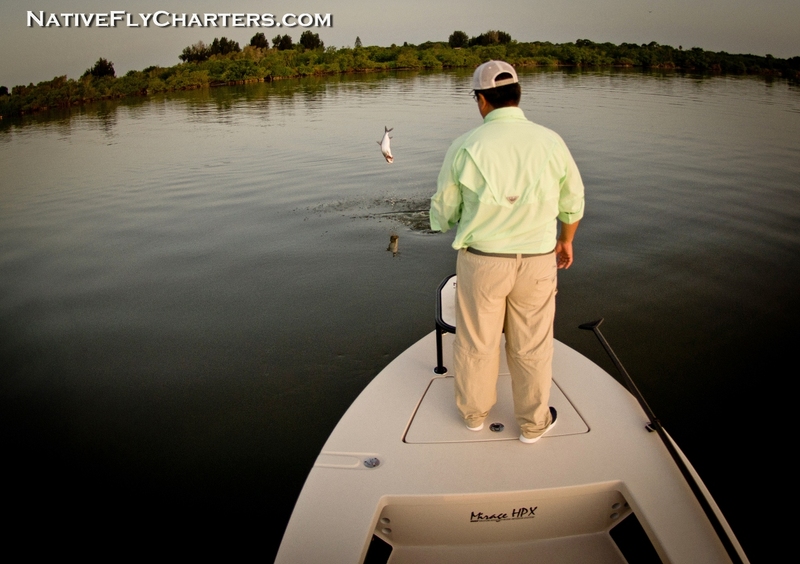 John and I decided to charge it and head for an area that I have found fish the day before. 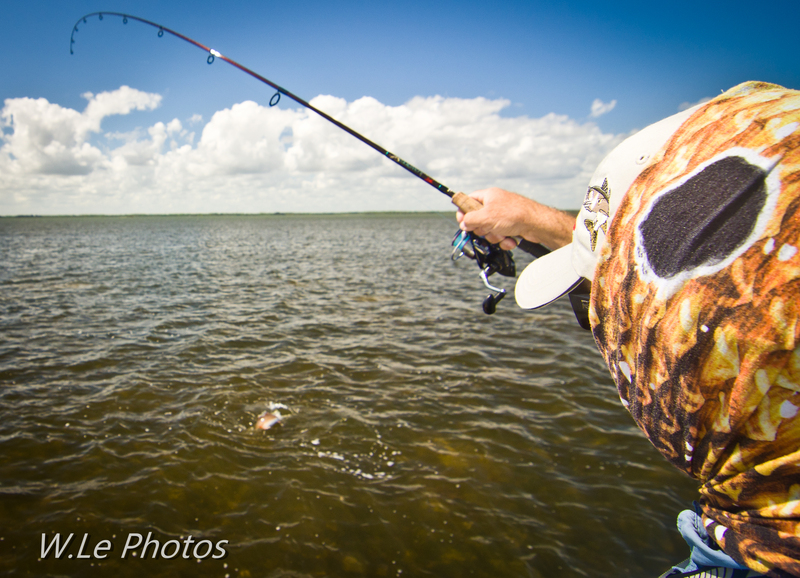 Luckily my Maverick HPX-V can handle some big waters and we made it to the spots high and dry. 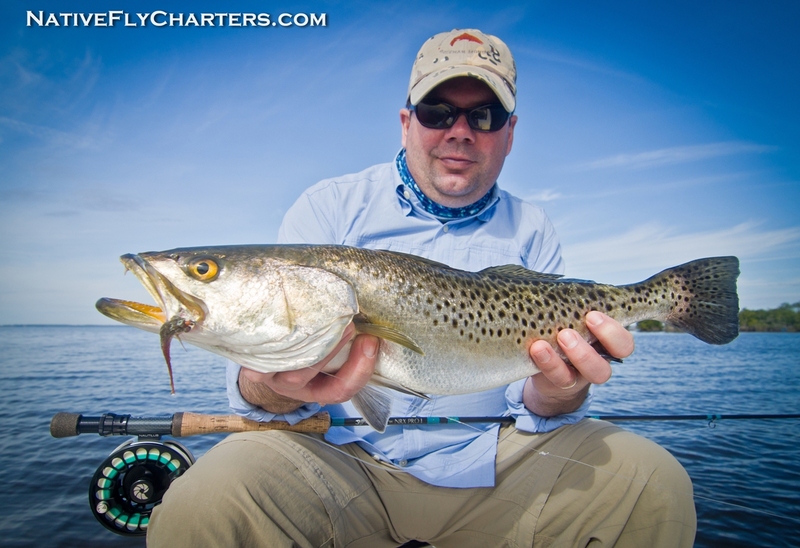 John ended up catching his first ever Sea Trout which he was hoping for, and it was a good one! 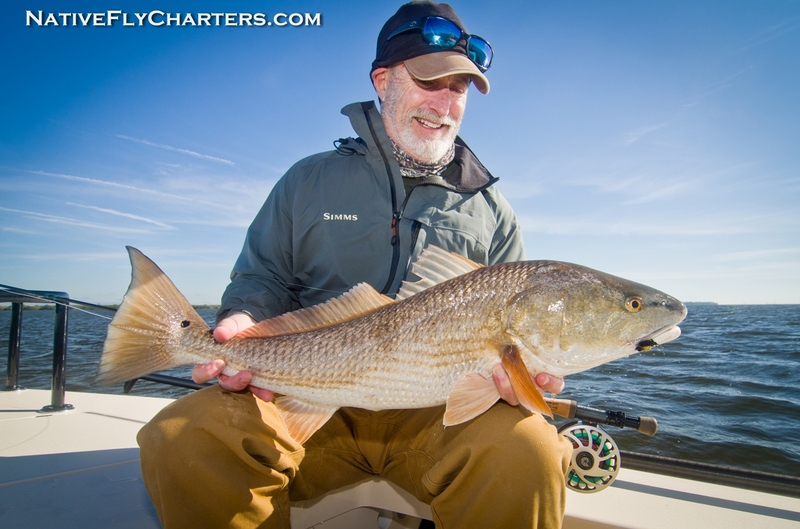 He also got a couple small redfish which was impressive for such a windy day. 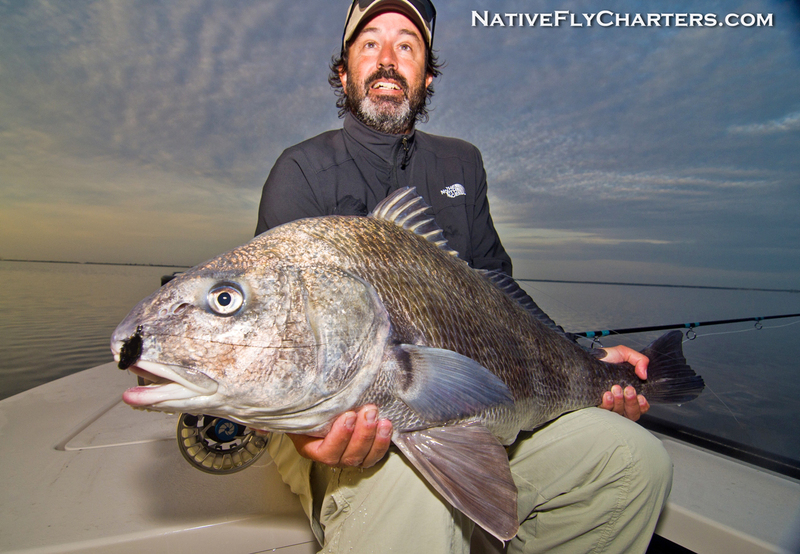 Chip is another regular from Vero Beach, this day he caught his very 1st Black Drum on fly along with another. Of course I get to play sometimes. 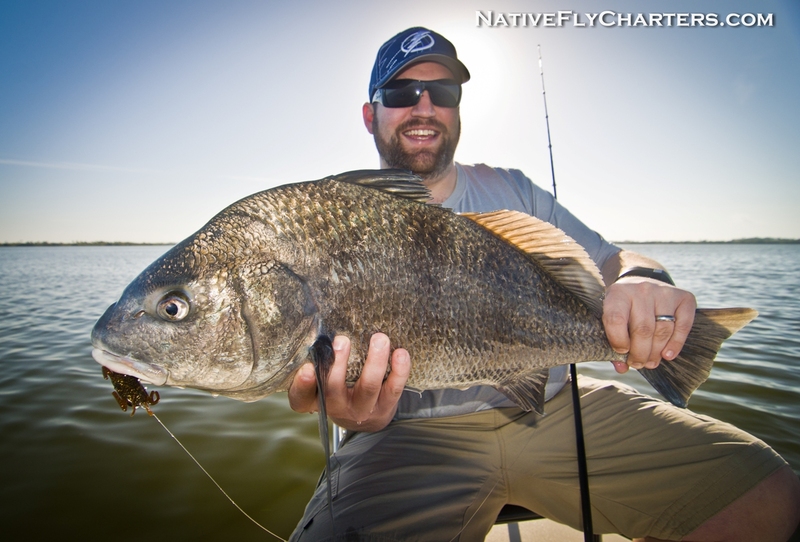 My buddy Billy and I were doing some looking around, when we came across a happy group pf Black Drum. 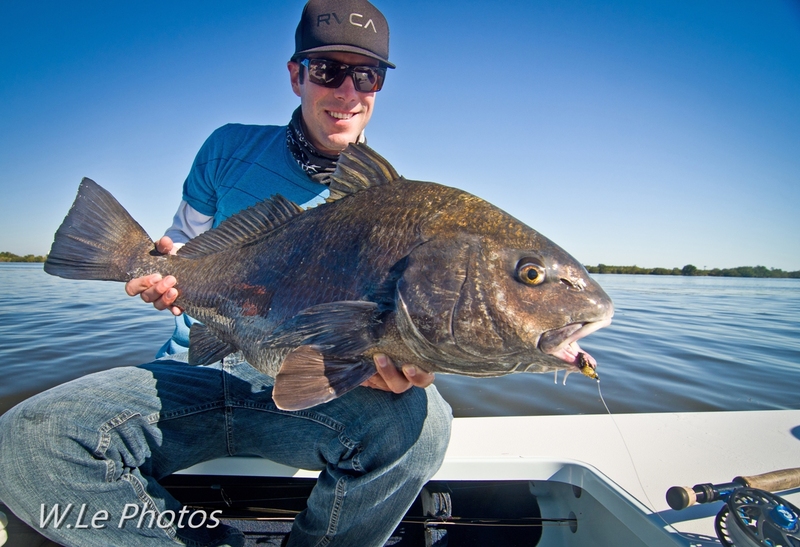 The Black Drum fishing has been very good and still going strong. 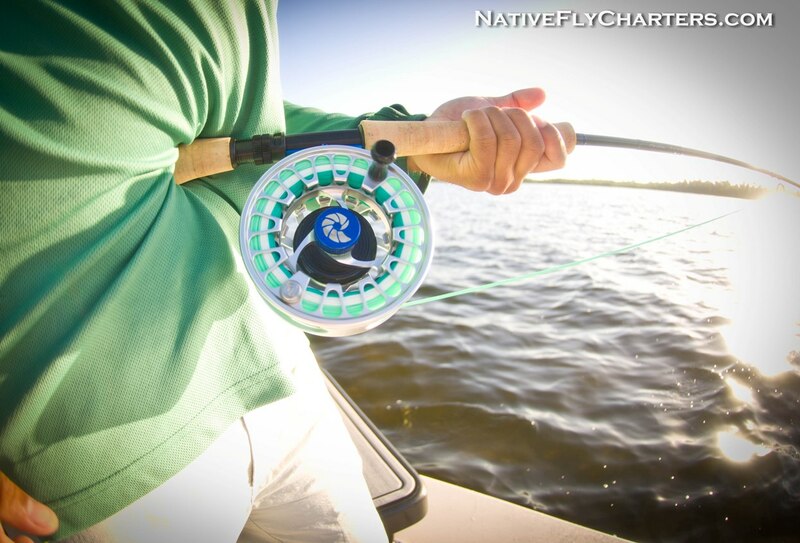 These fish have been a favorite of mine to specifically target on the fly. I think mainly because they can be very tricky to feed, and sometimes hard to find. I like that challenge and the pursuit. Thanks for reading and see ya in March!